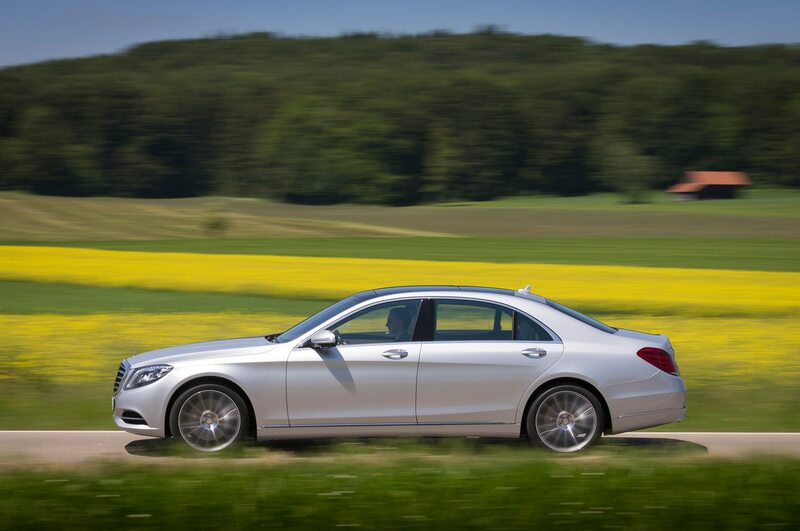 &#8220;This is a very wealthy area,” said our Stuttgart-native photographer as we drove the new Mercedes-Benz S-Class through the Swabian Alps. 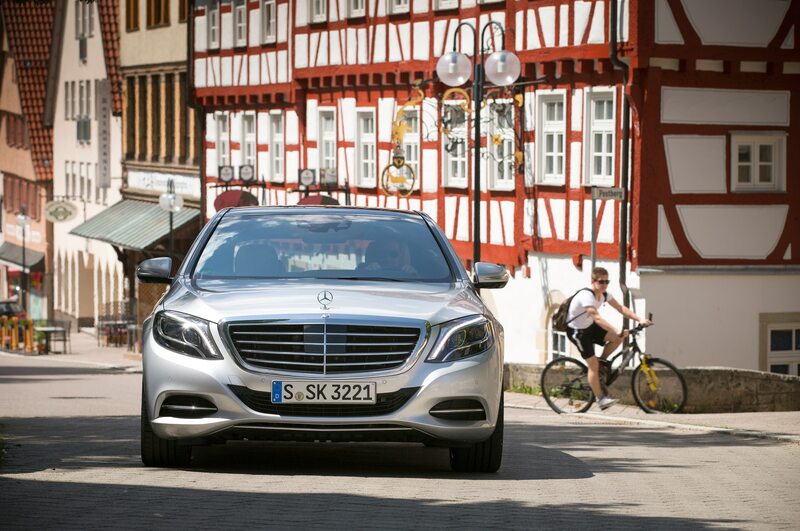 “But you’d never know it.” That’s because the Swabians, he explained, are very reticent to display their wealth. 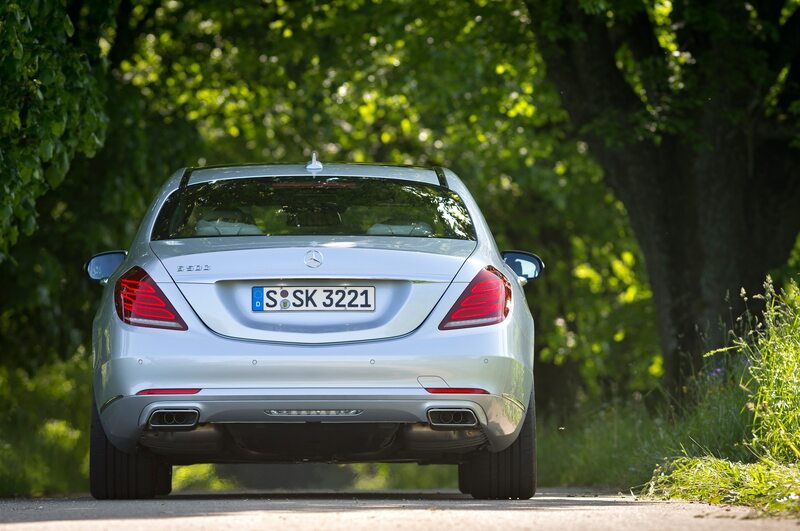 The new S-class, then, might not be very popular here. 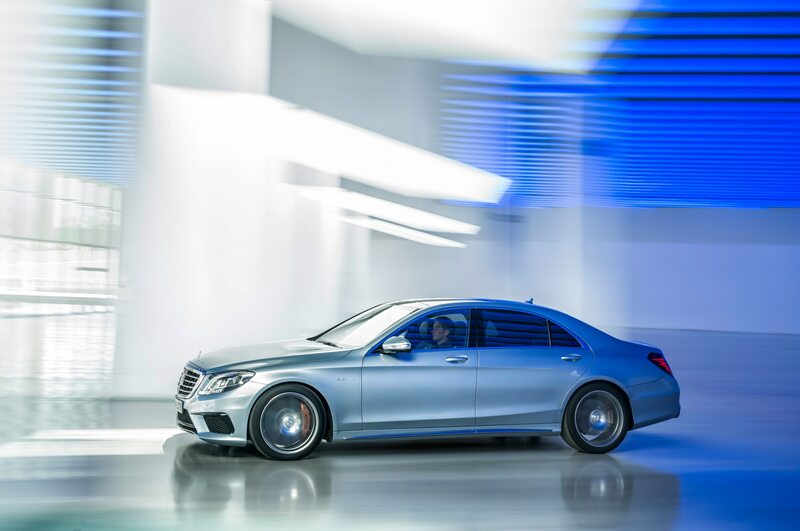 Although the new car has not grown in length or wheelbase, its styling is more extroverted. 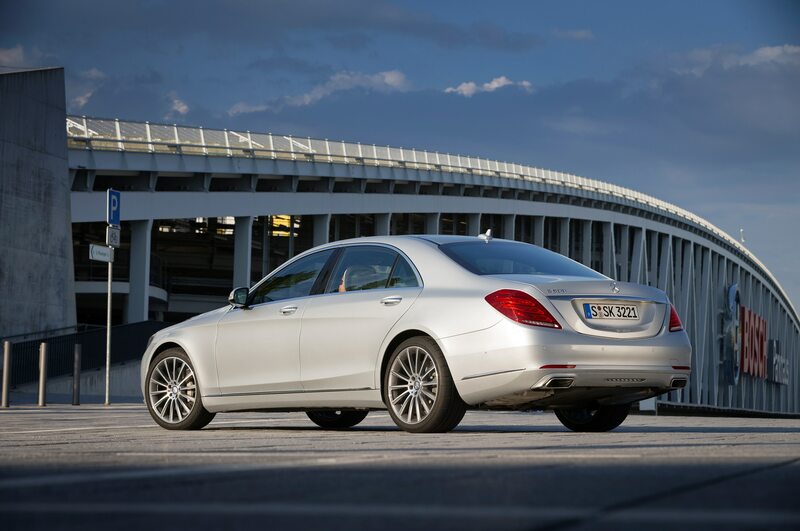 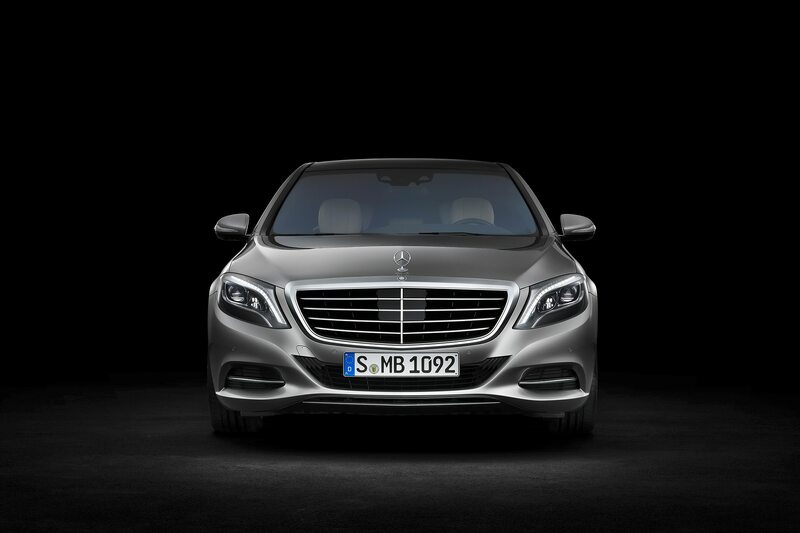 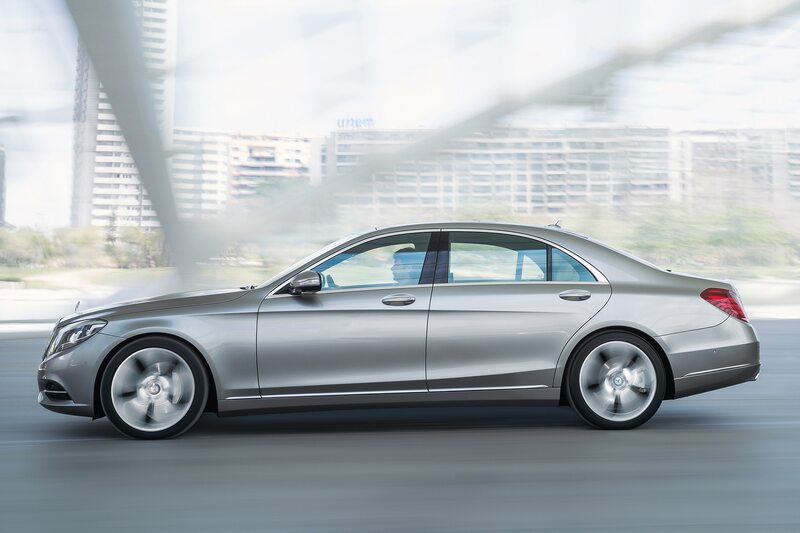 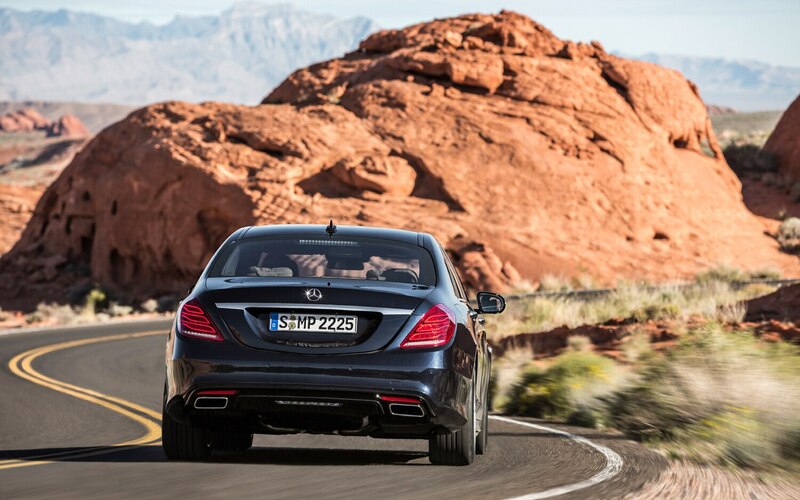 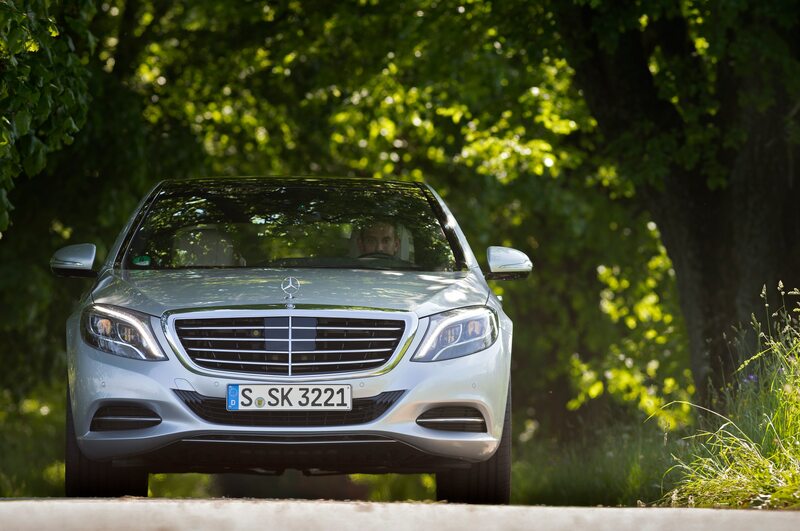 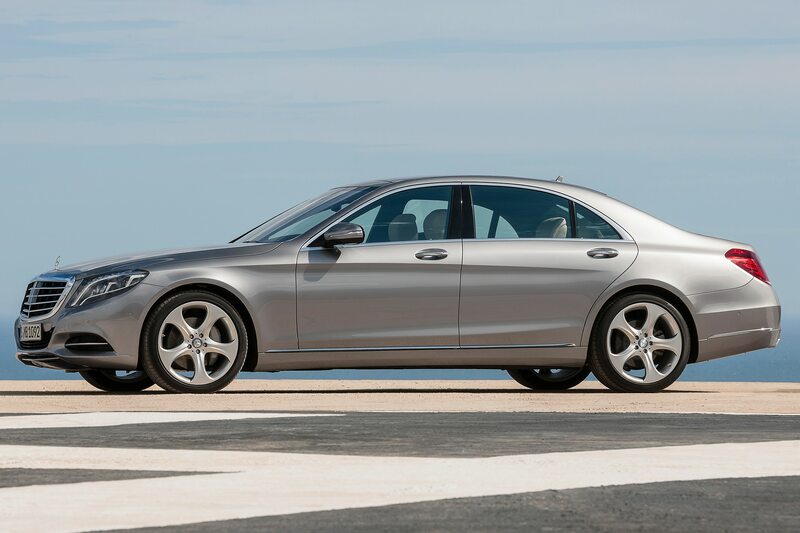 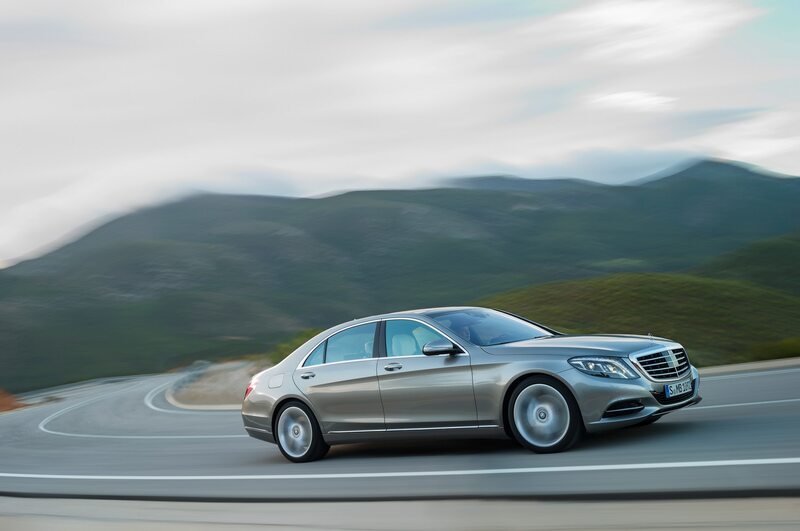 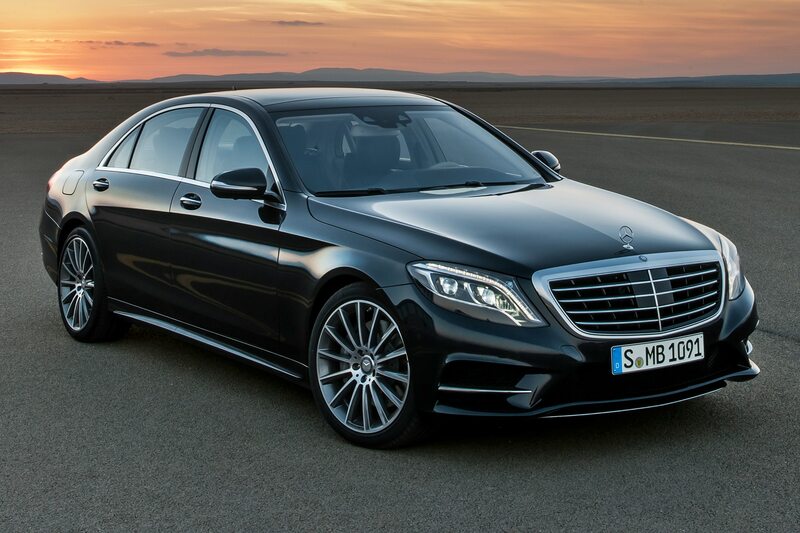 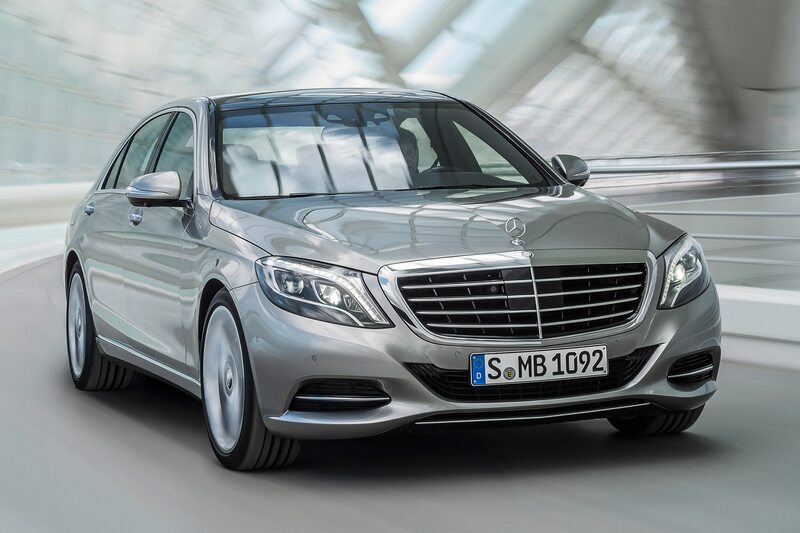 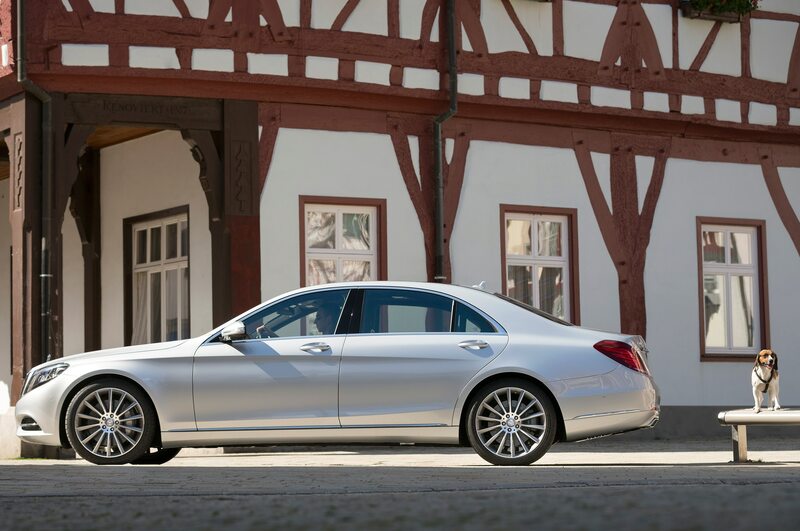 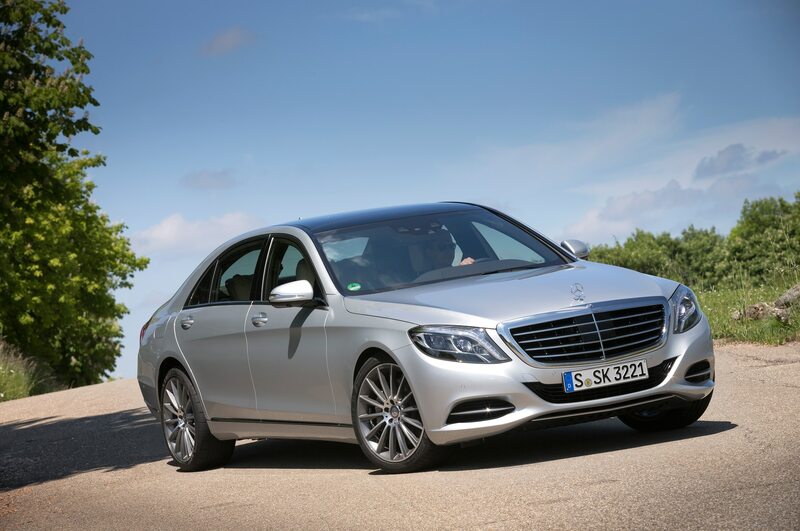 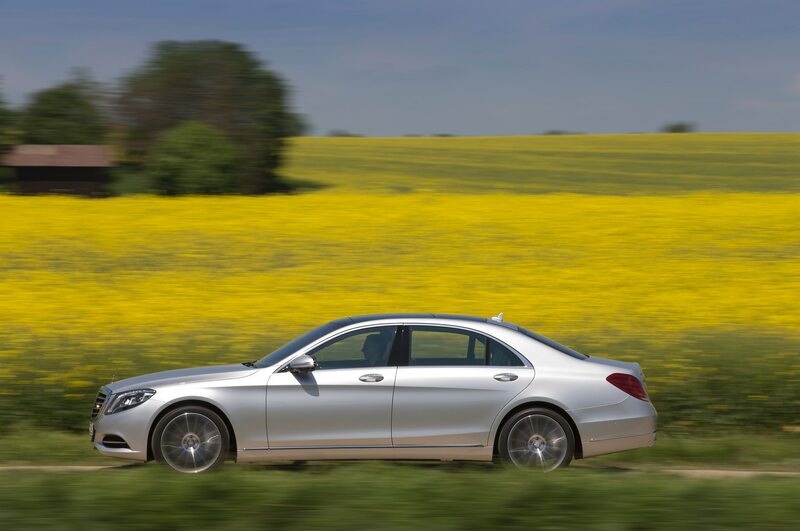 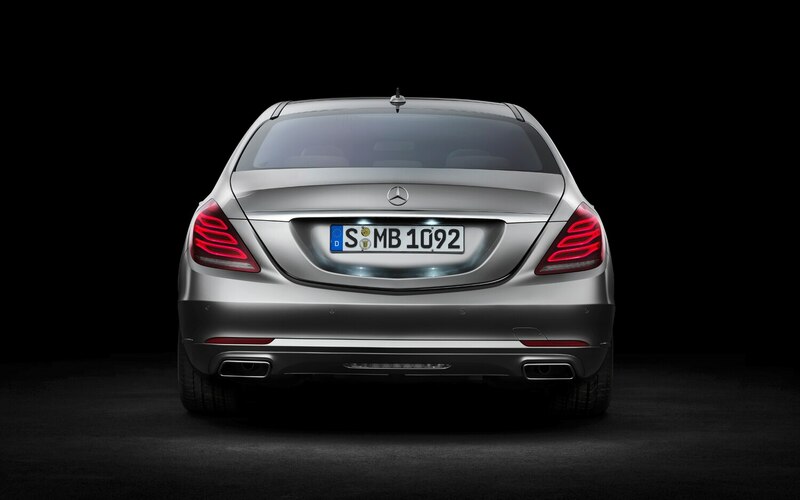 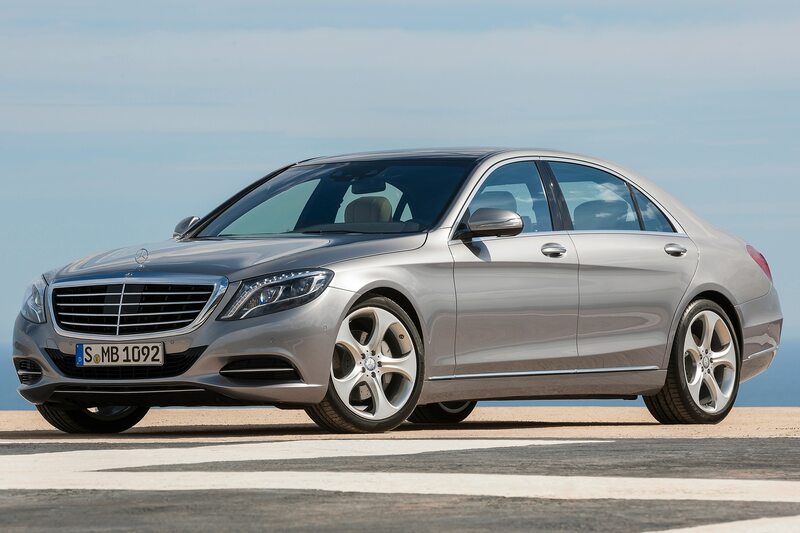 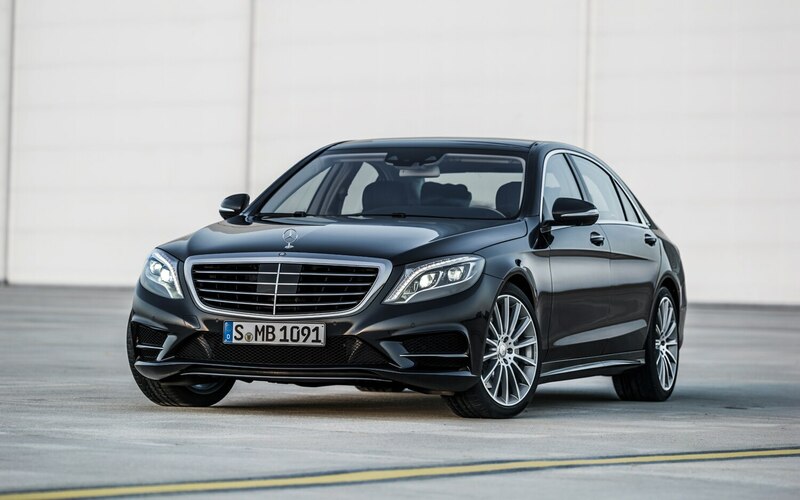 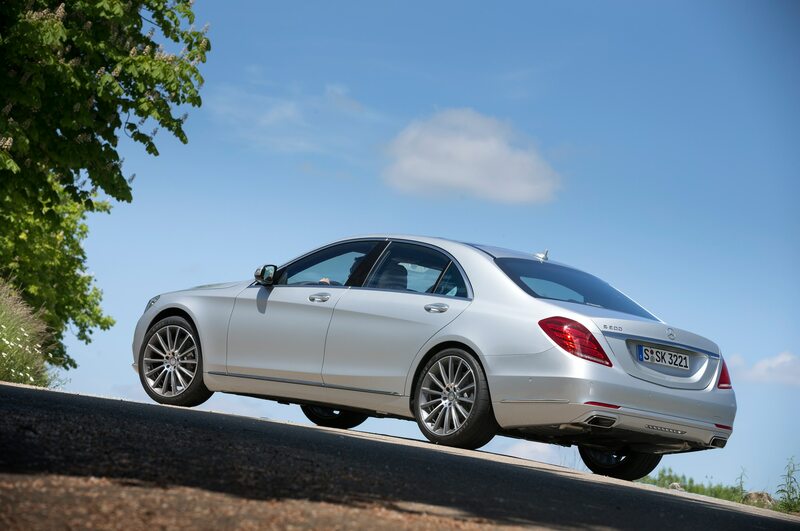 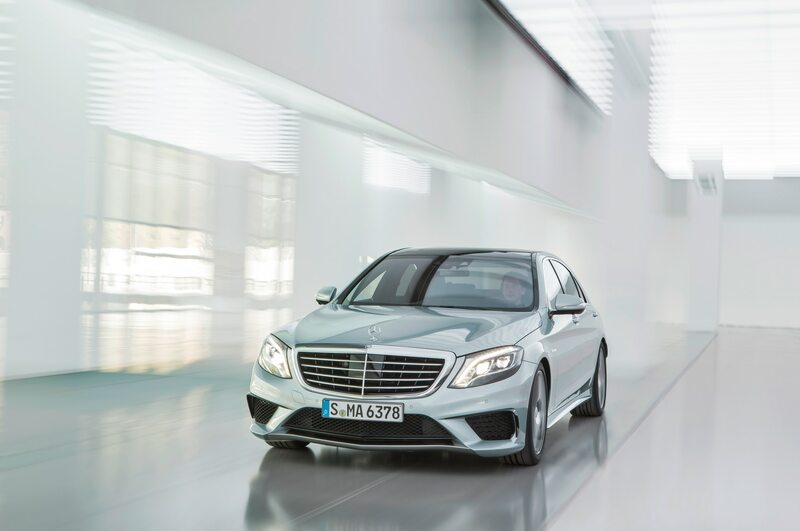 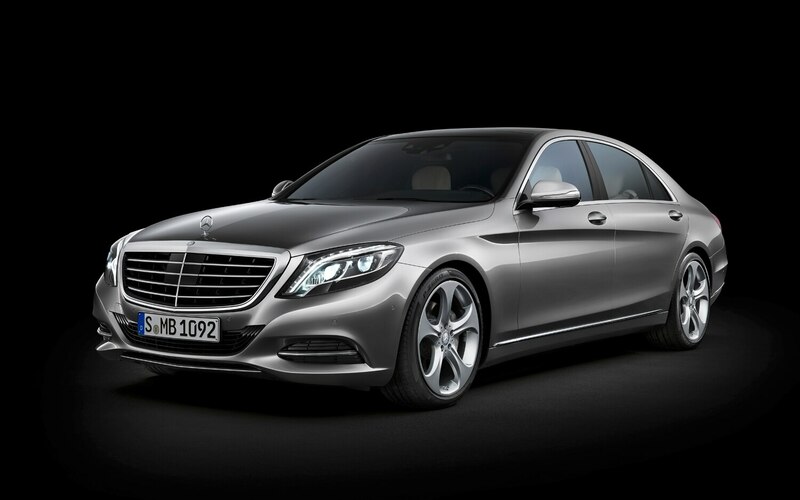 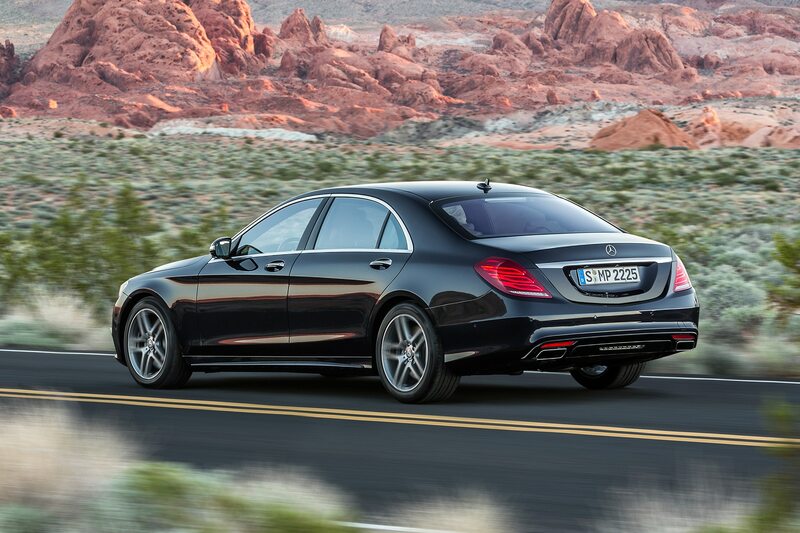 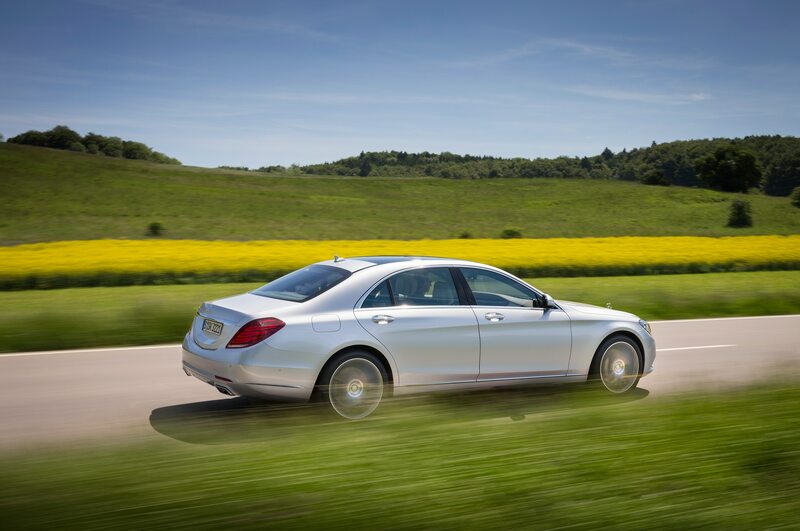 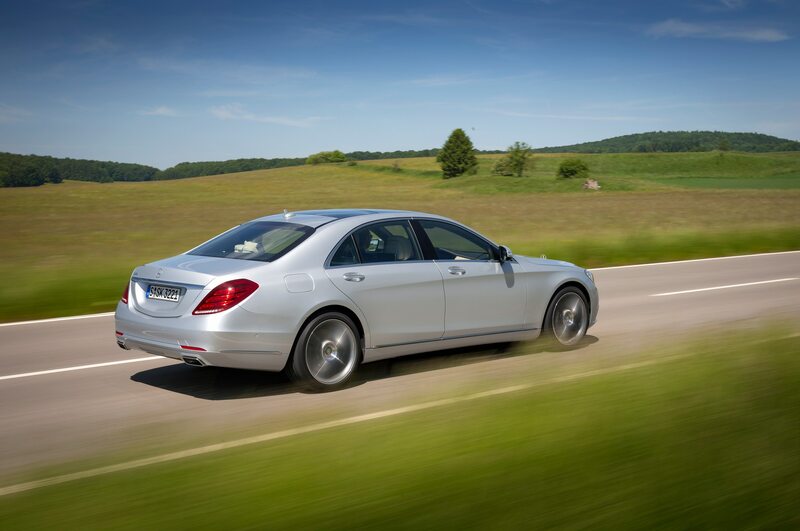 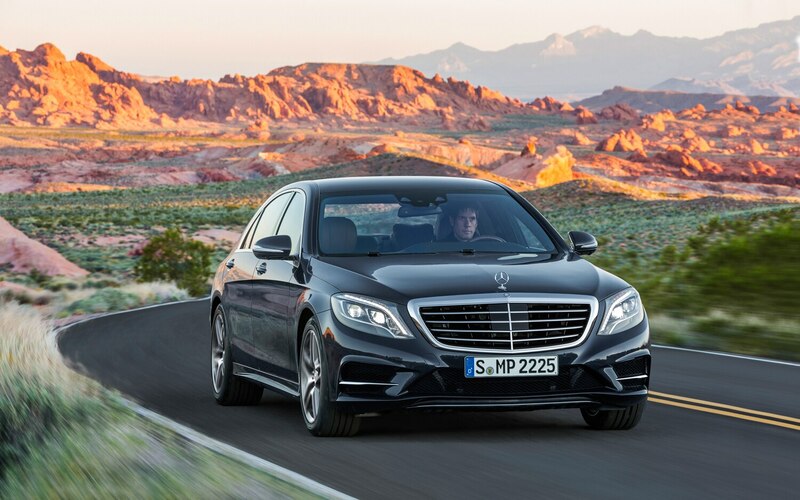 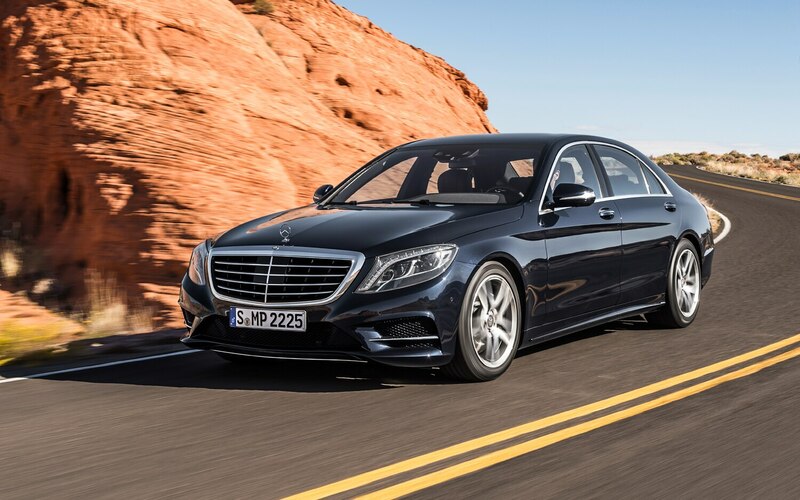 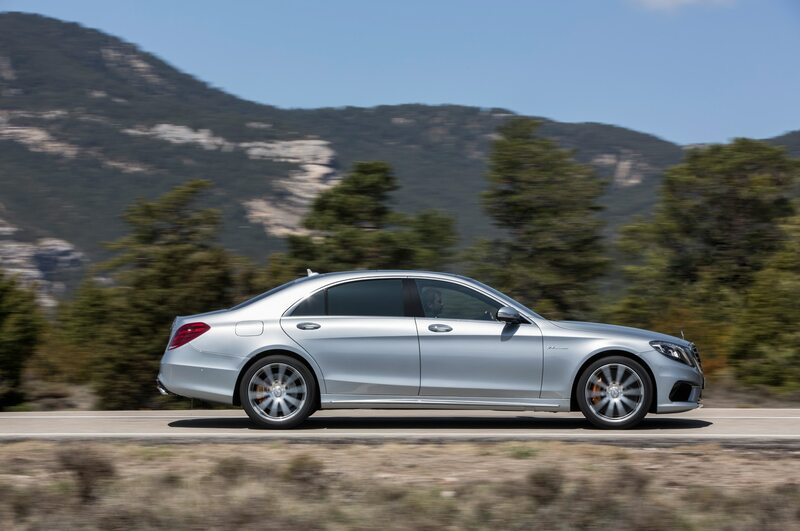 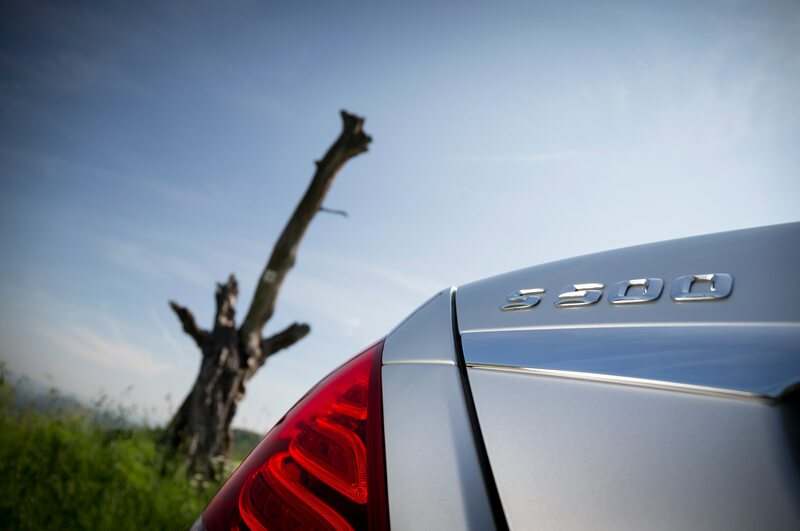 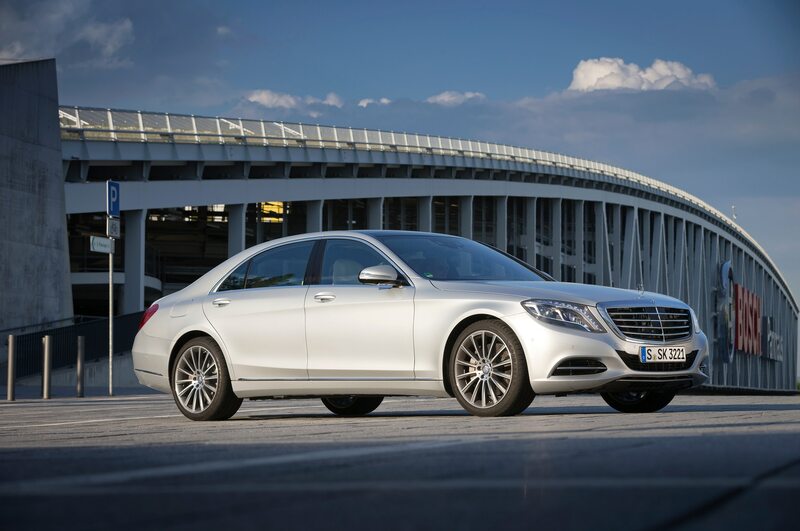 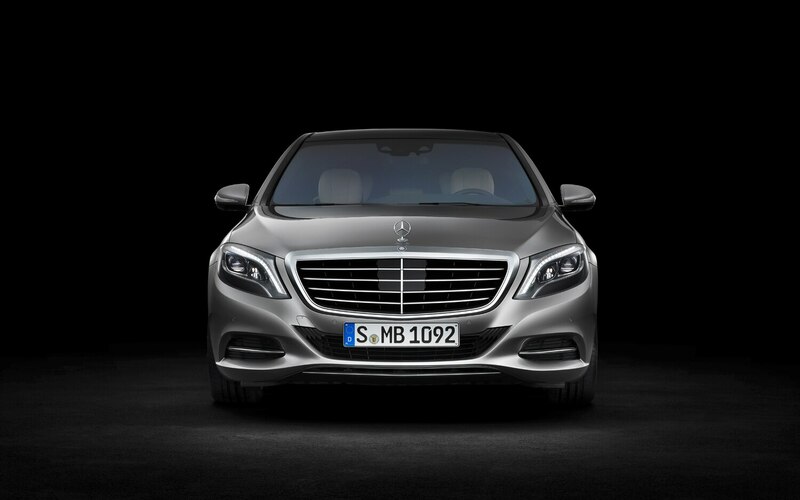 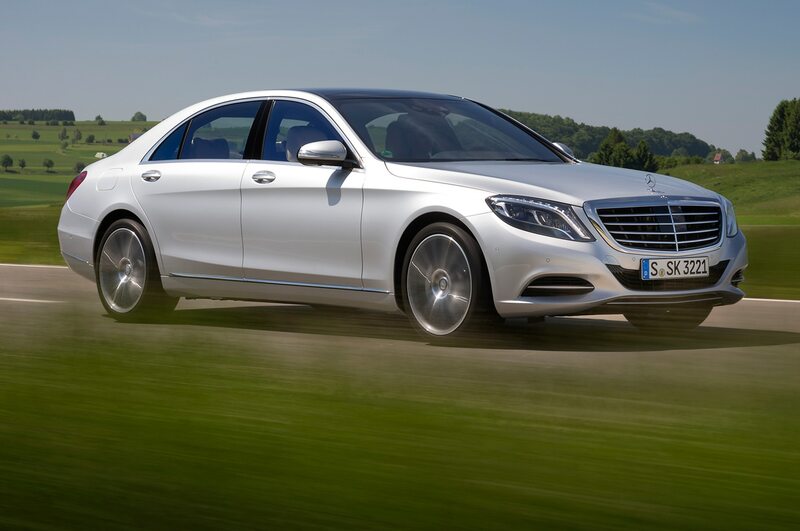 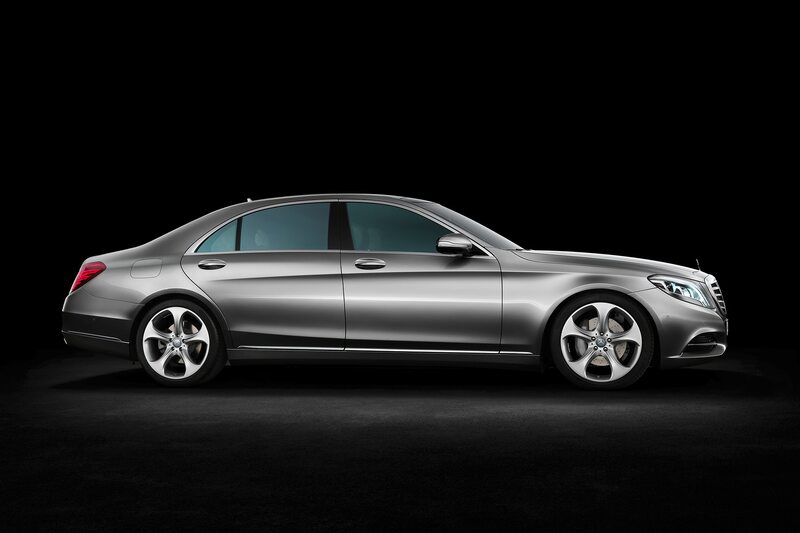 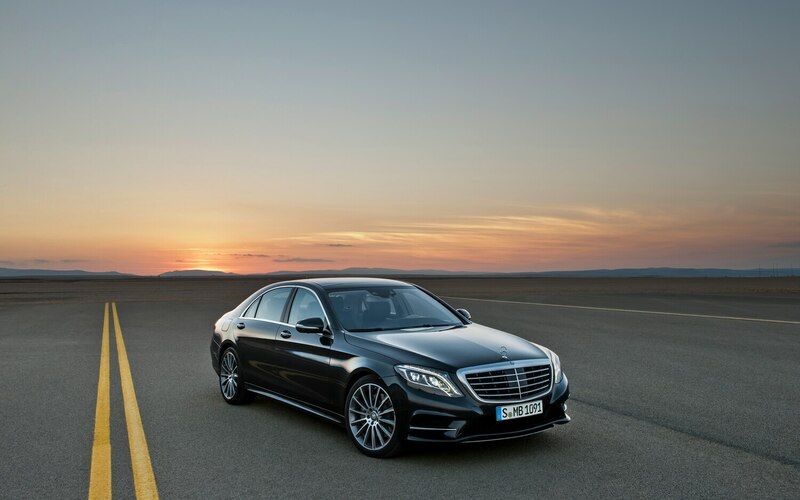 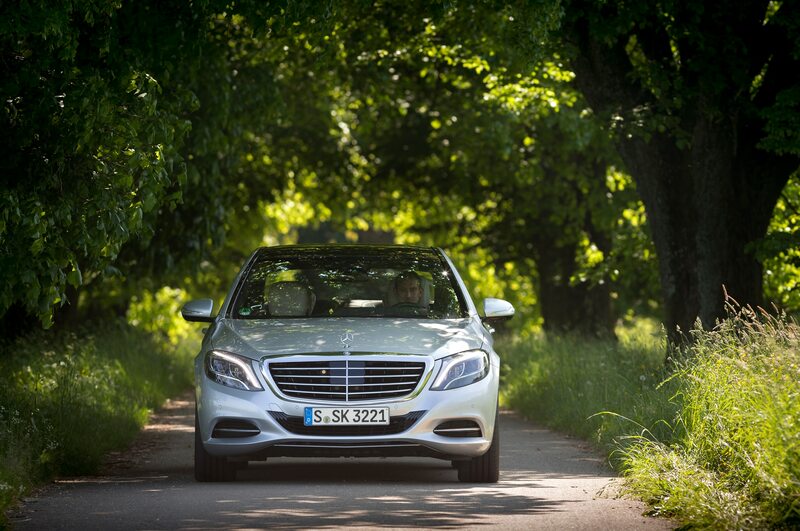 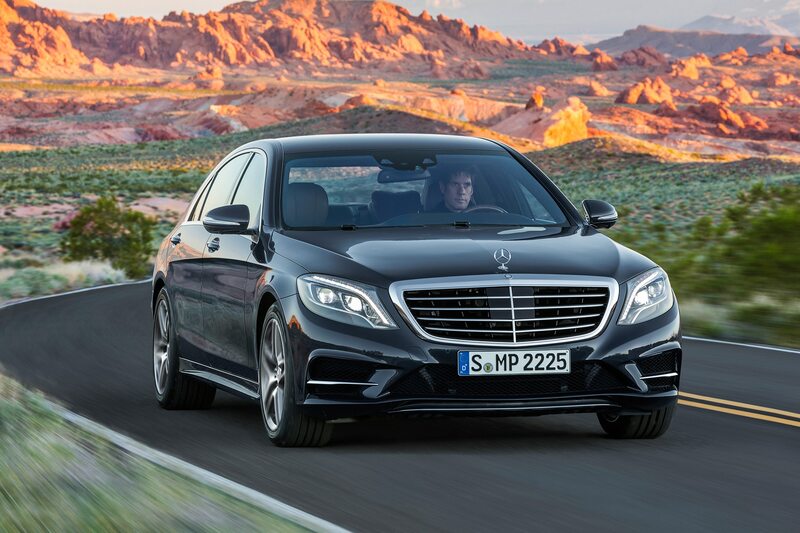 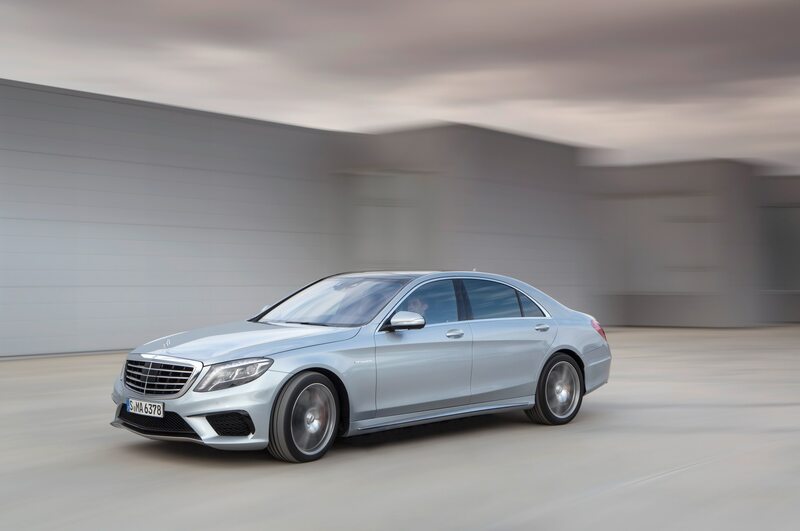 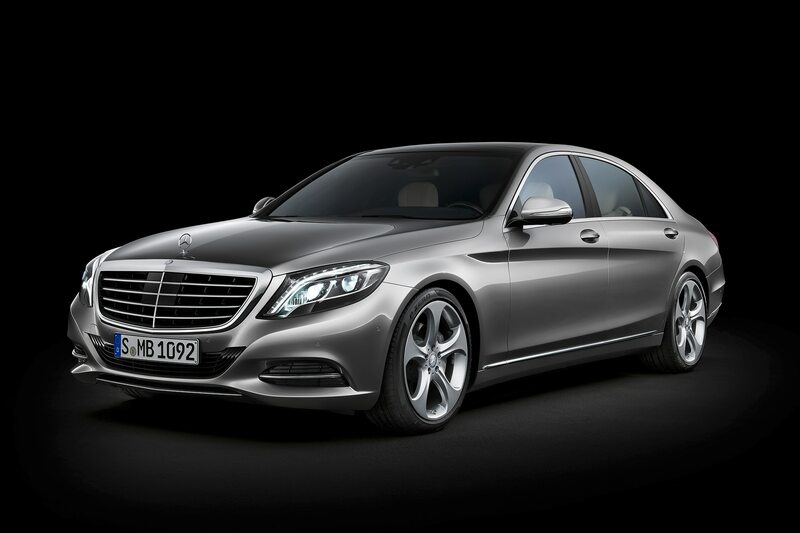 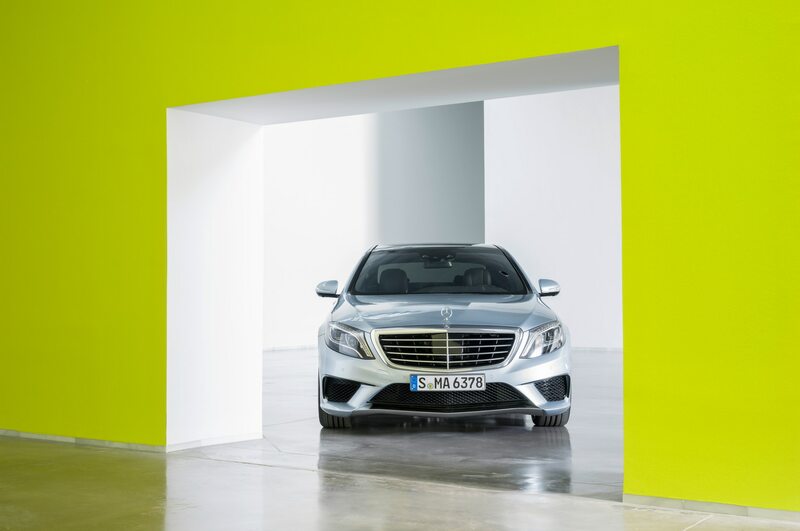 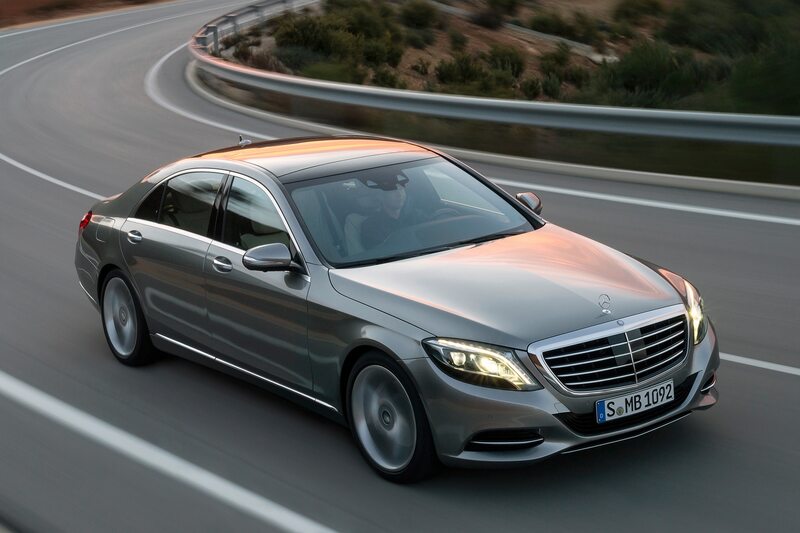 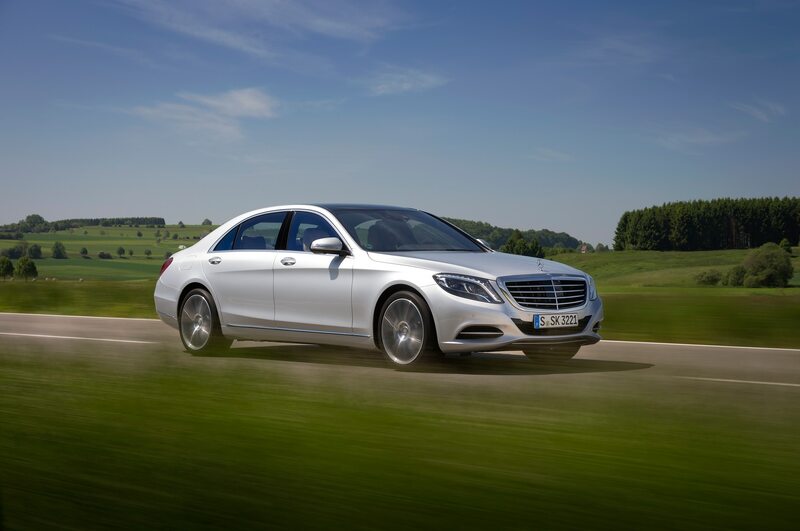 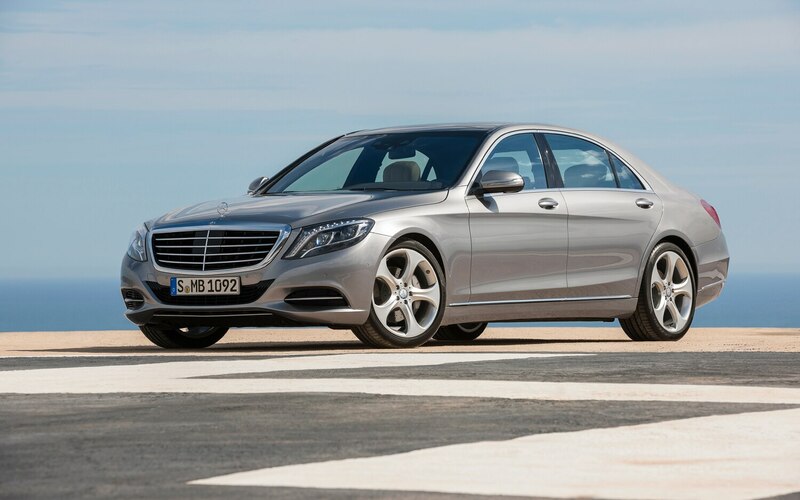 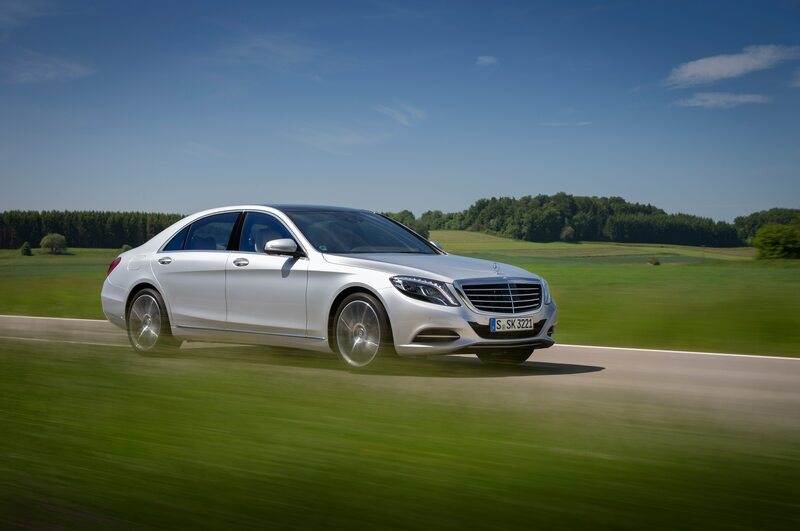 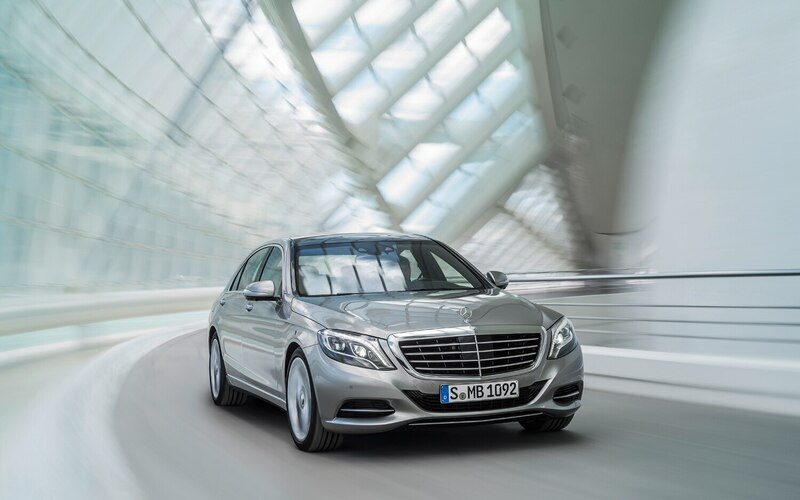 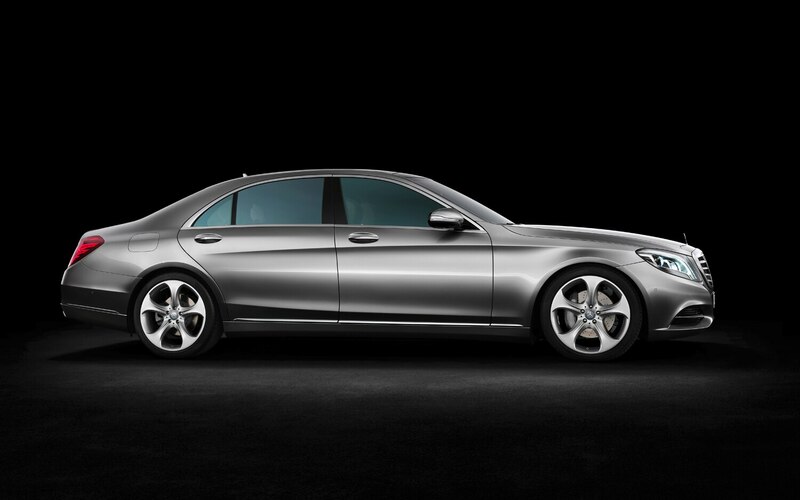 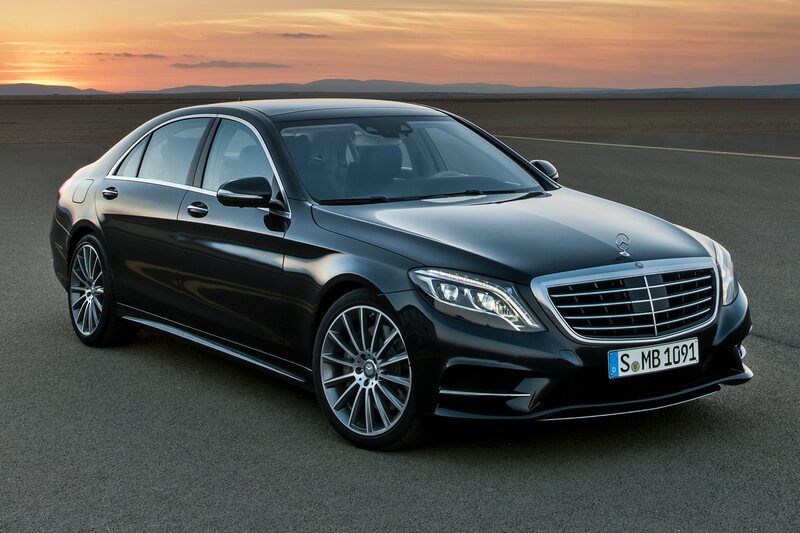 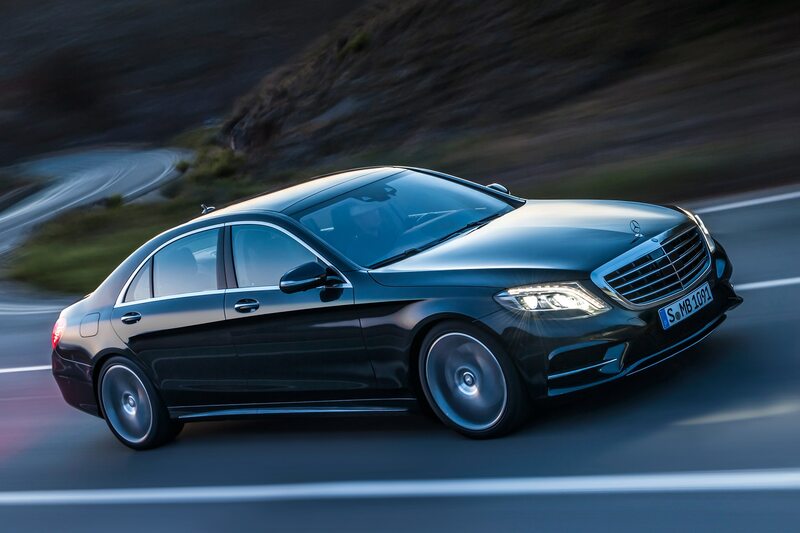 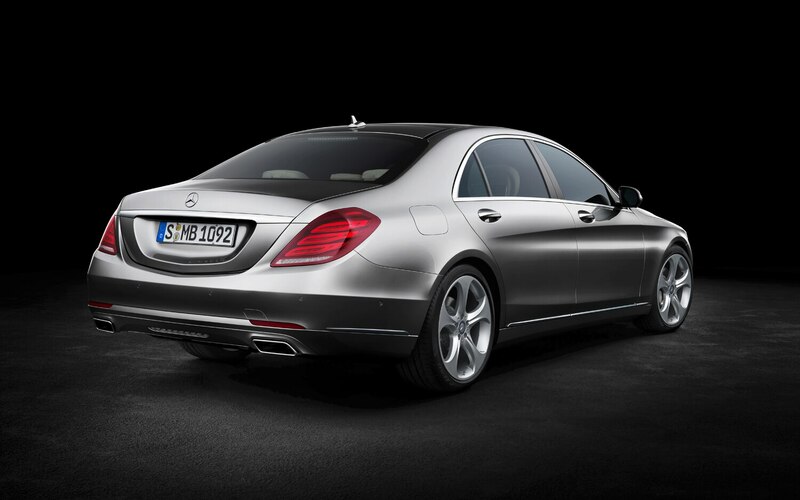 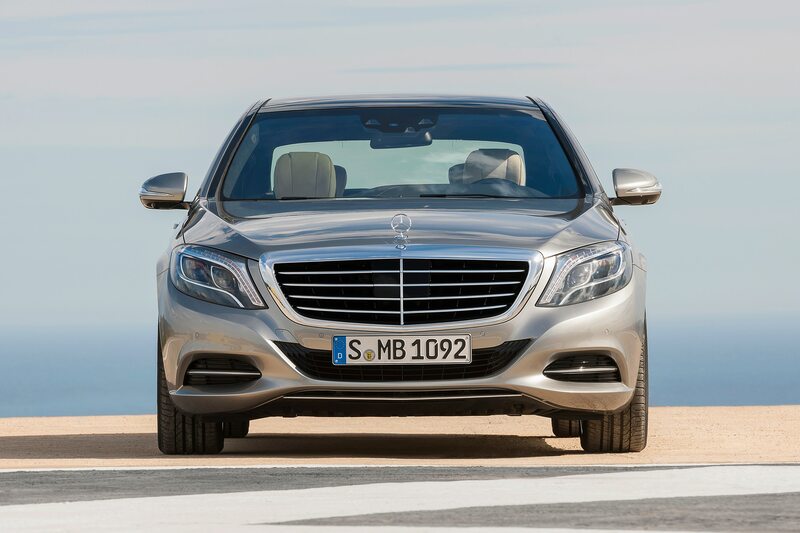 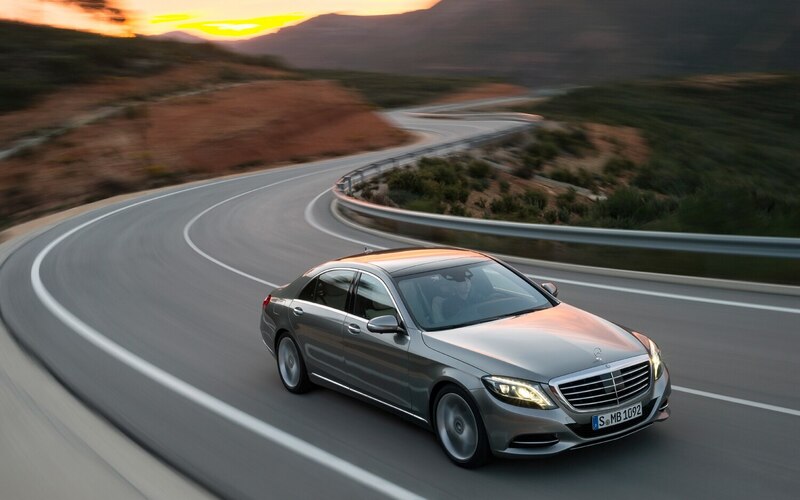 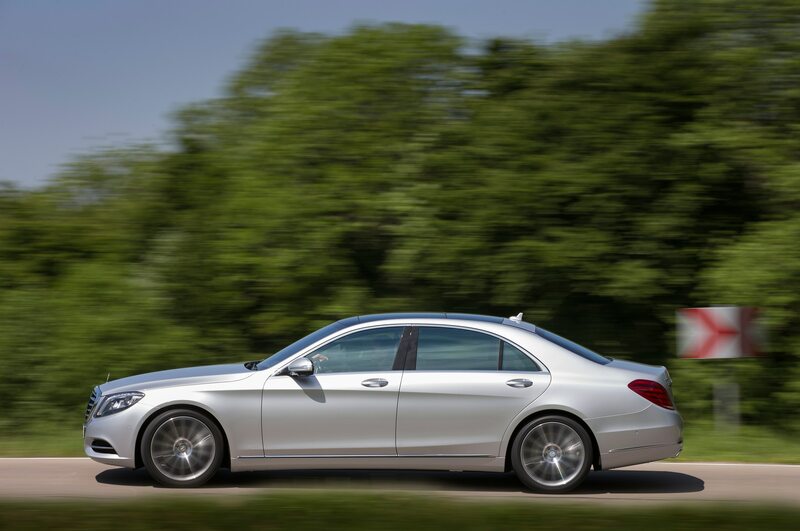 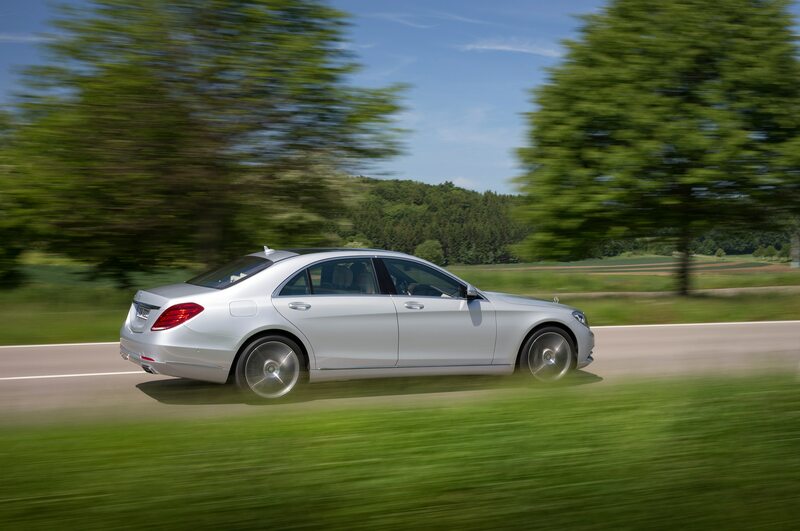 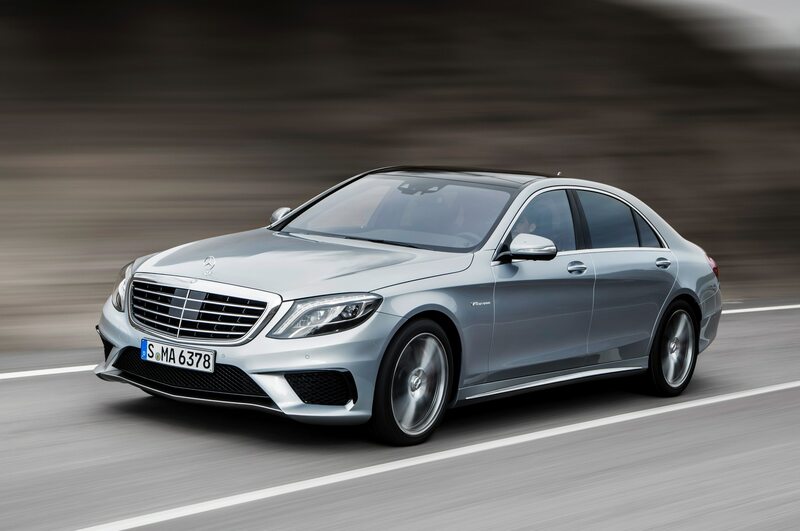 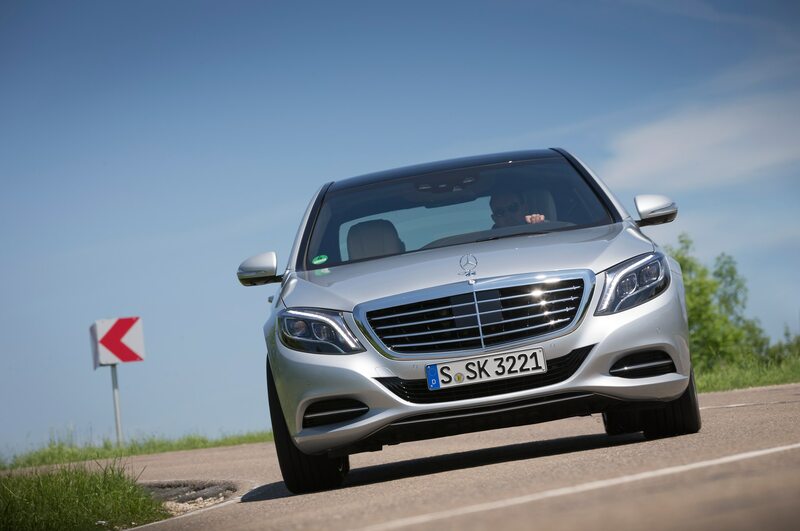 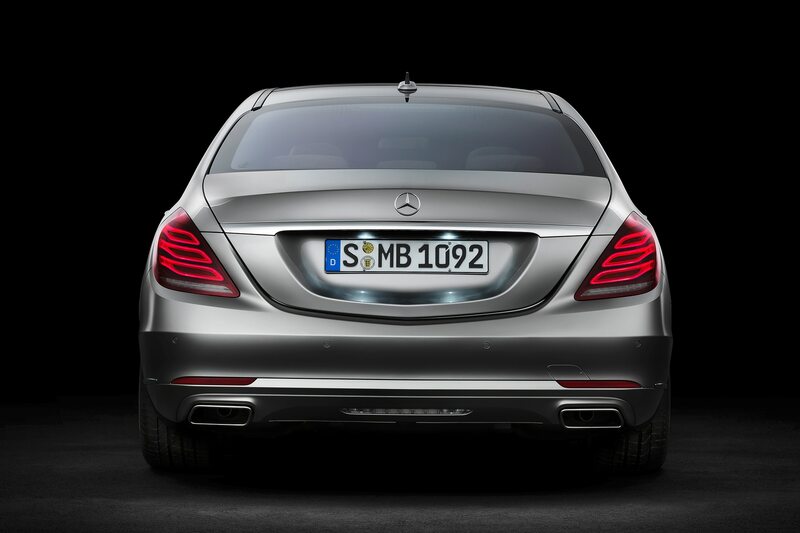 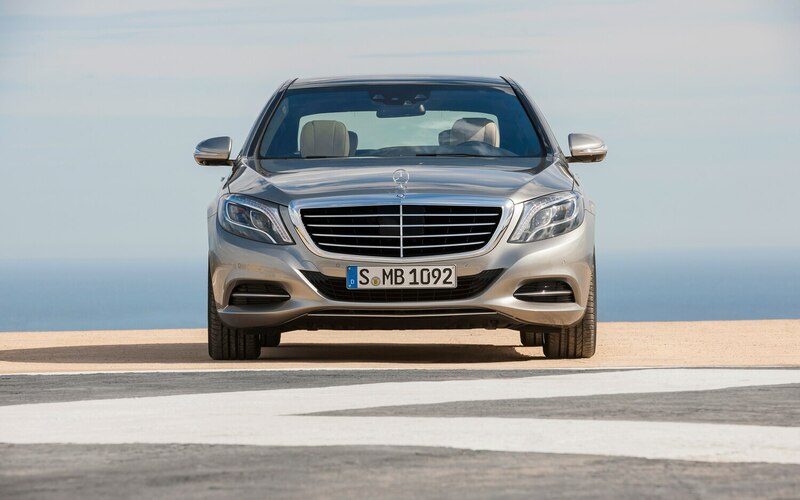 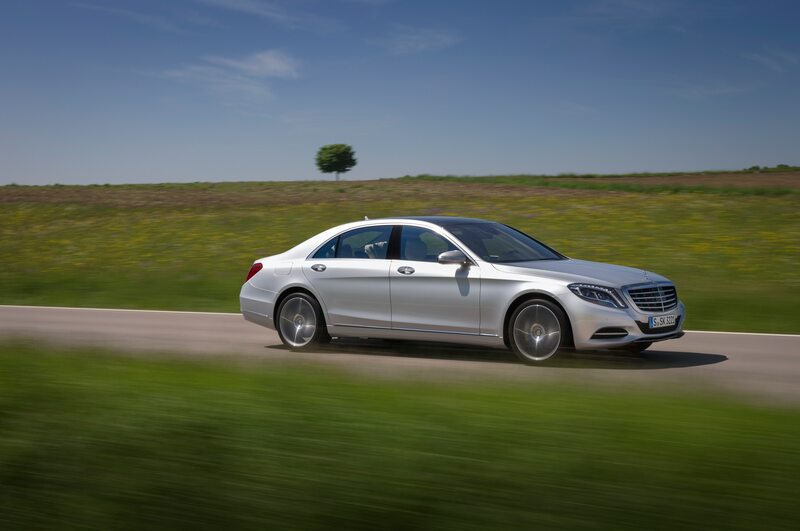 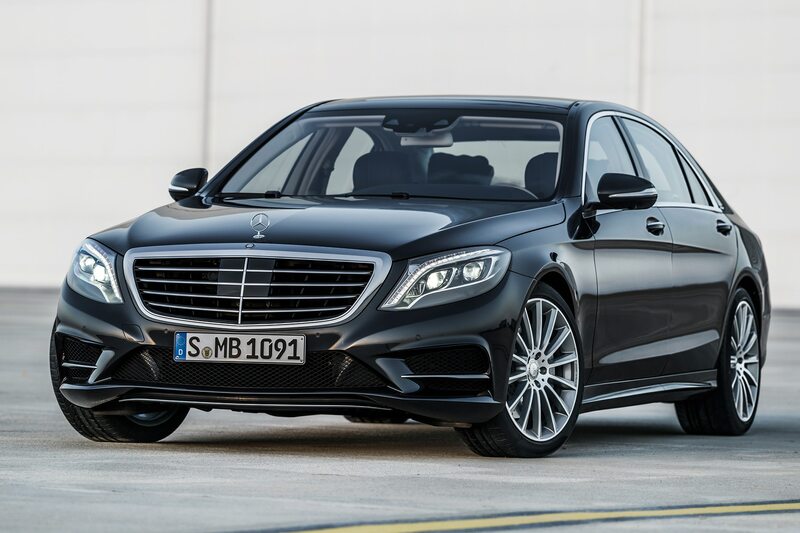 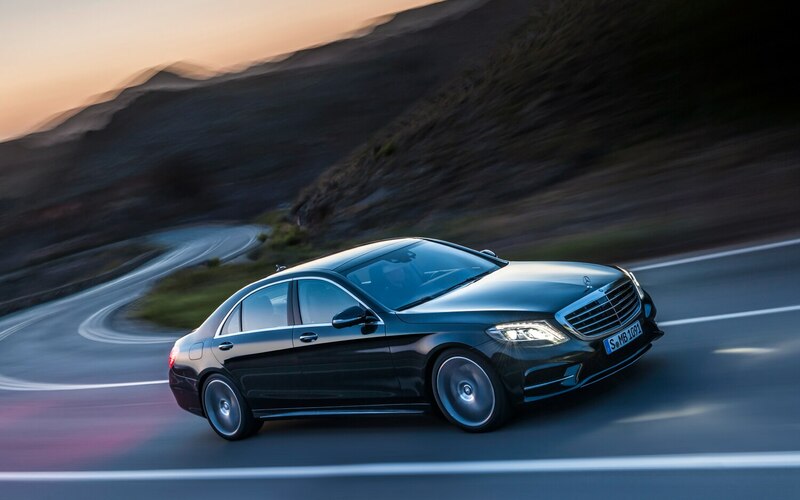 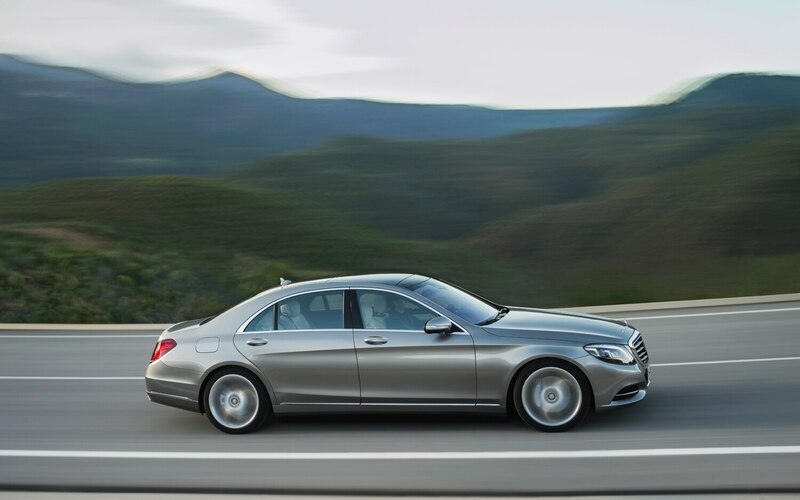 Whatever the Swabians think of it, the S-class is the most popular luxury sedan worldwide. 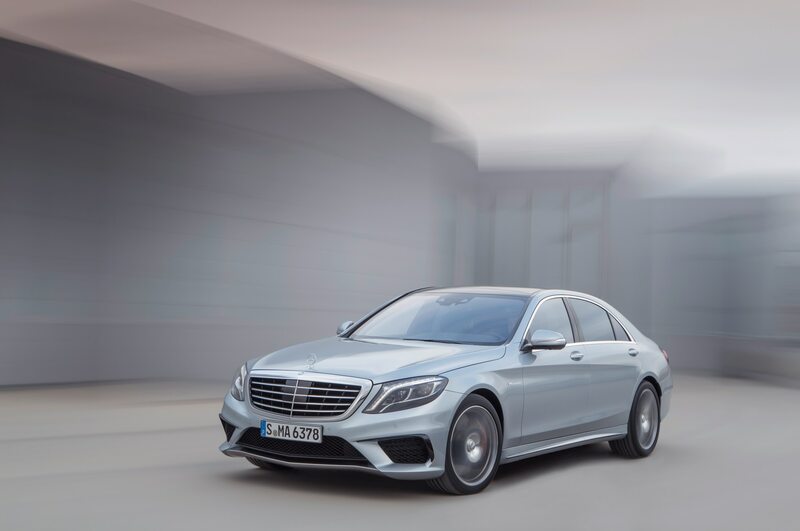 An S-class still means something, and as the Mercedes-Benz model range stretches ever further downmarket, it is more important than ever that the S-class remain an estimable machine, one that can confer rub-off status onto even the lowliest A-class. 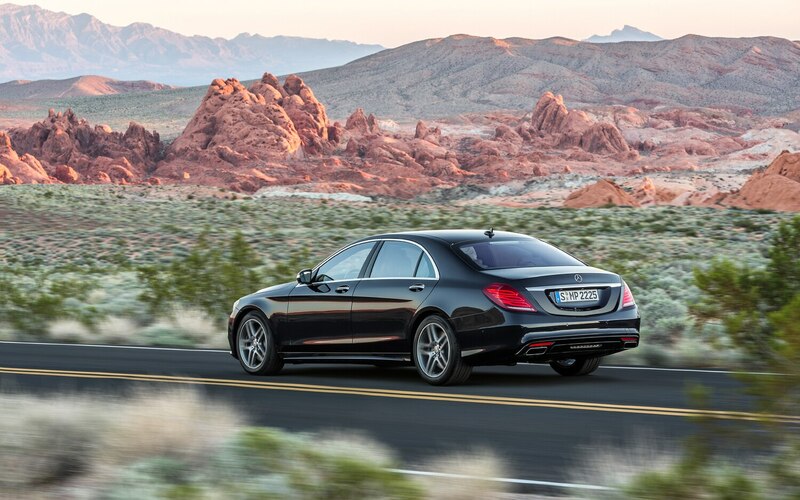 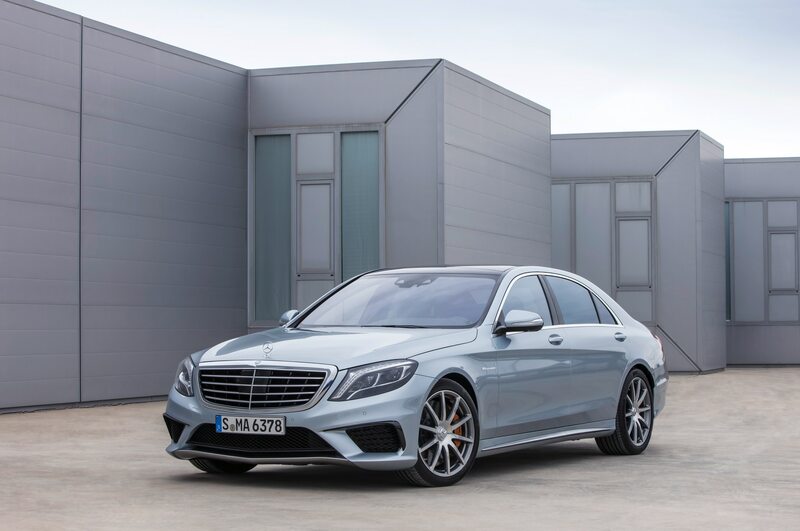 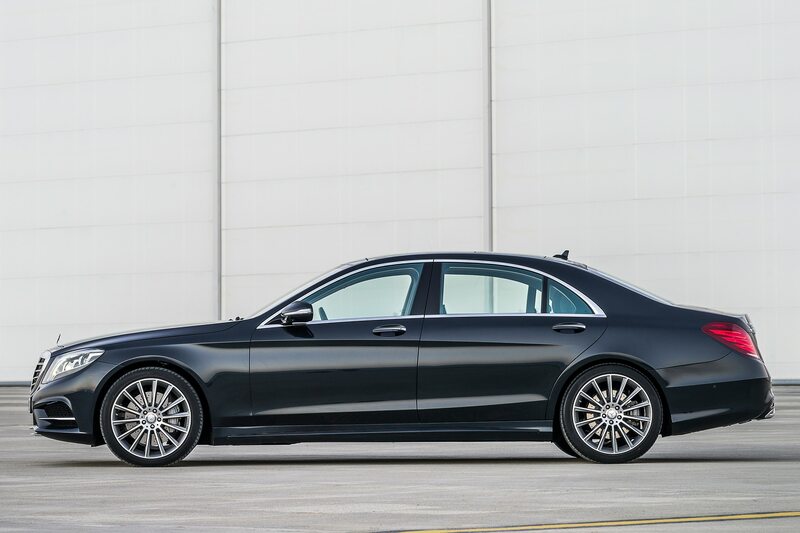 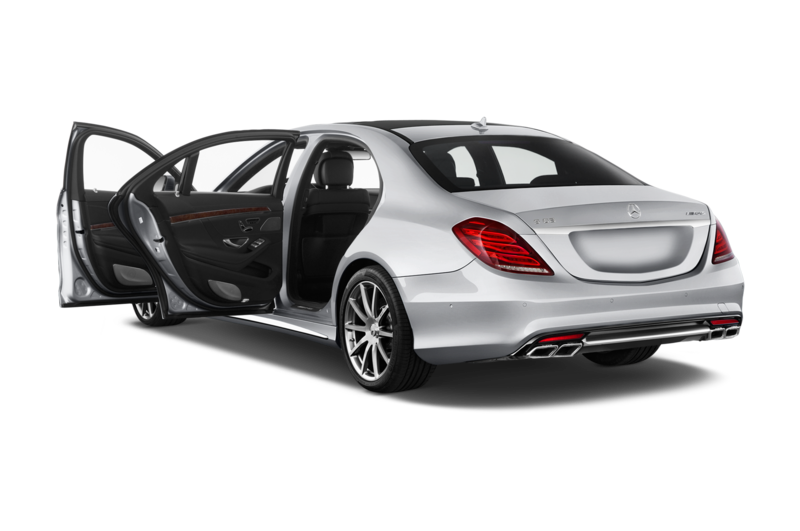 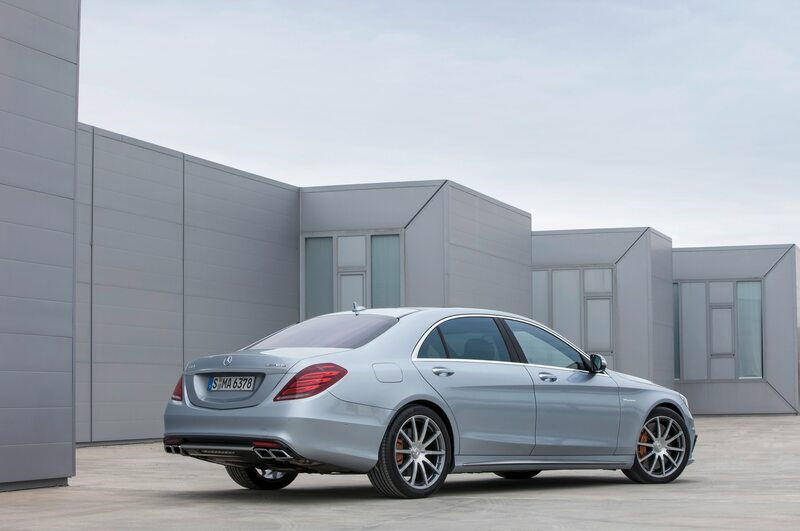 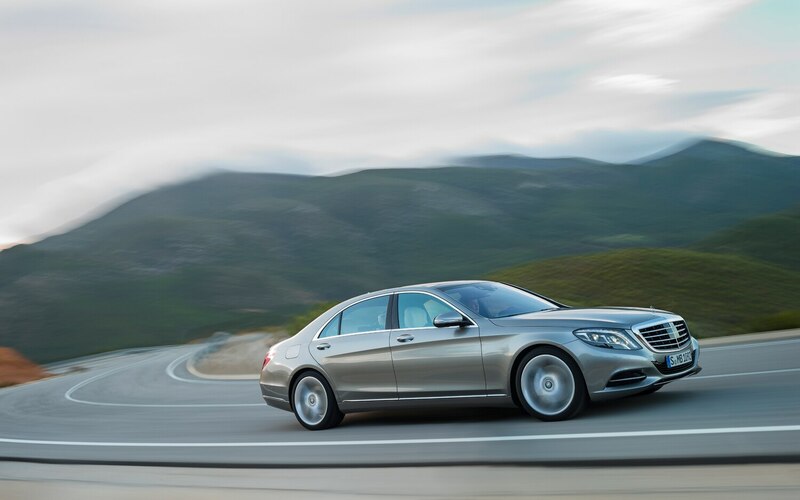 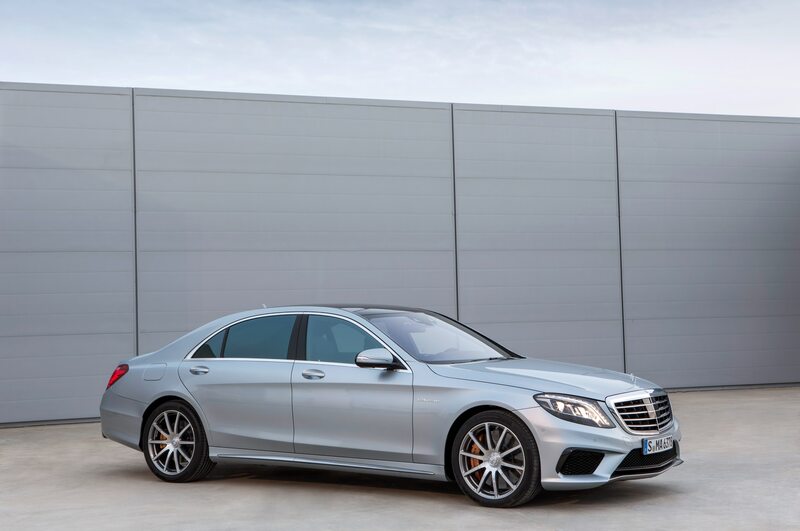 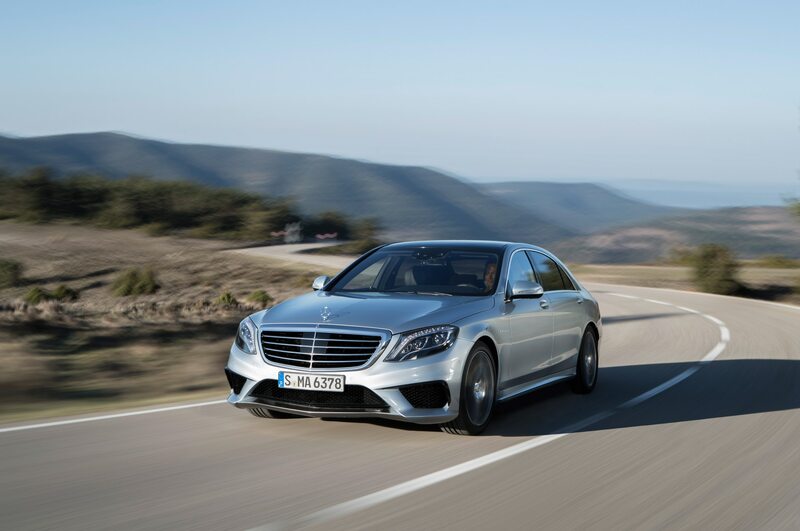 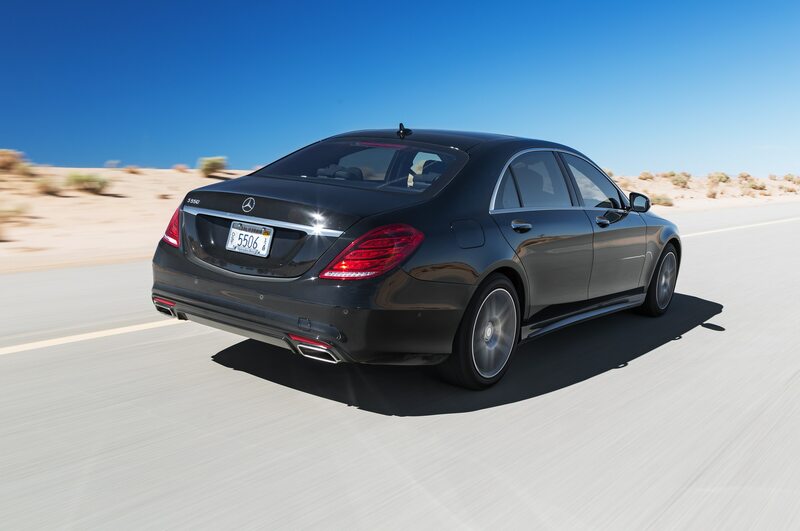 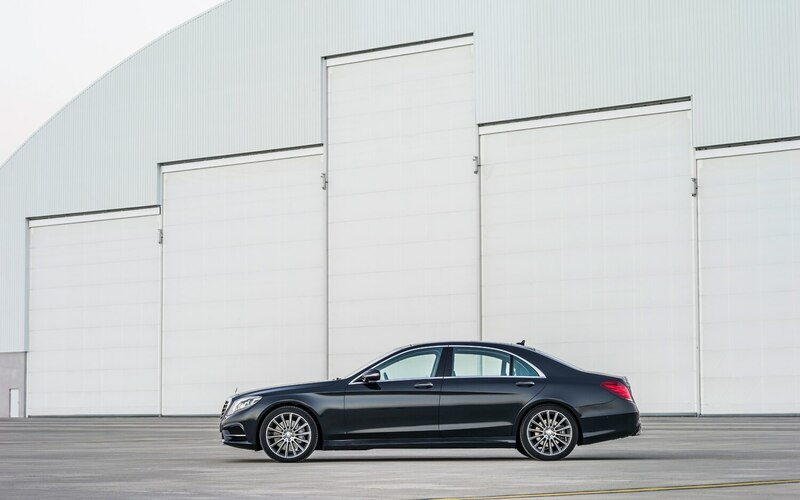 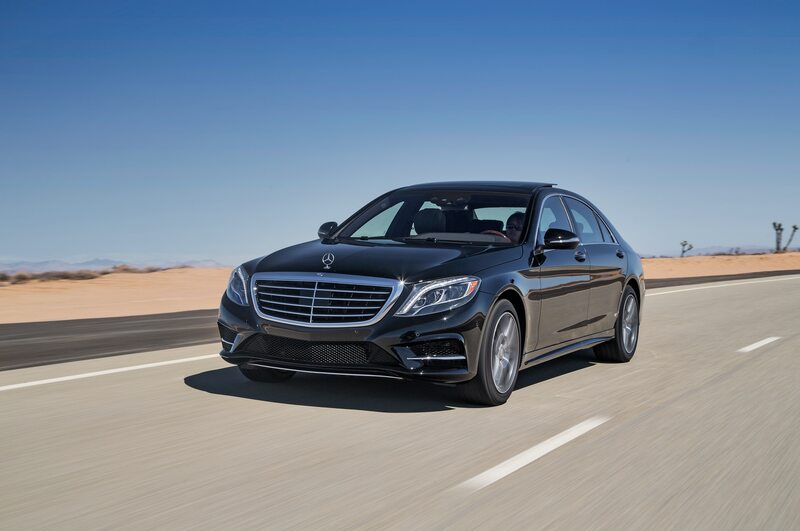 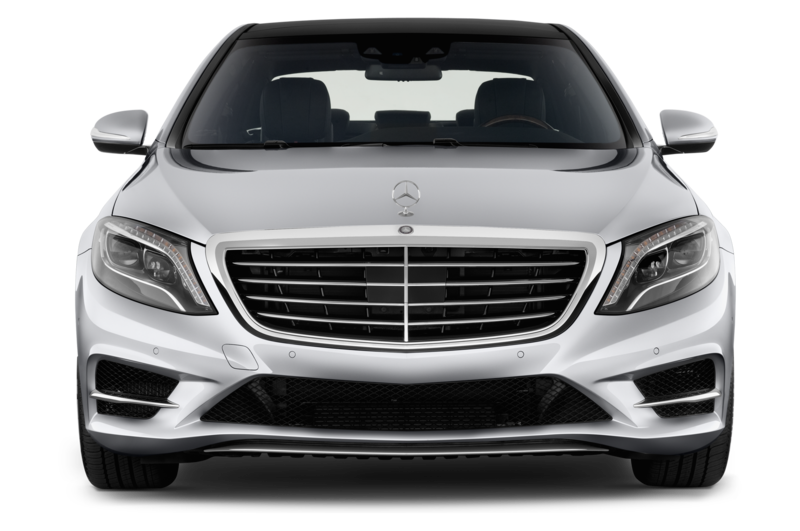 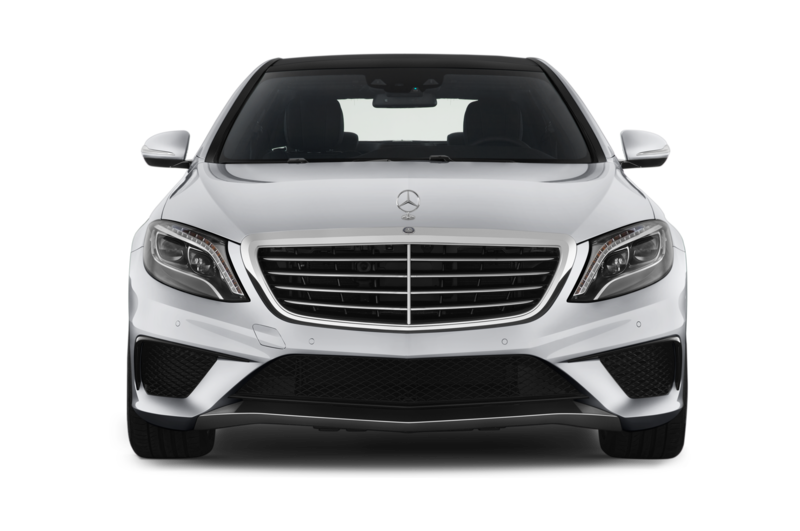 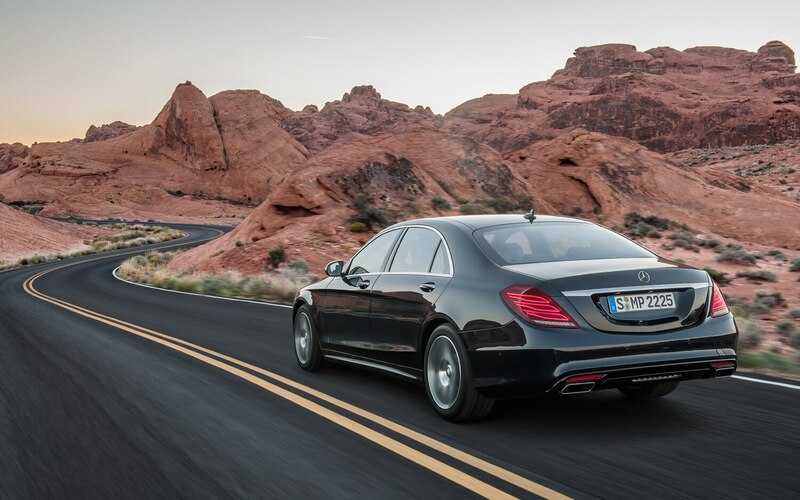 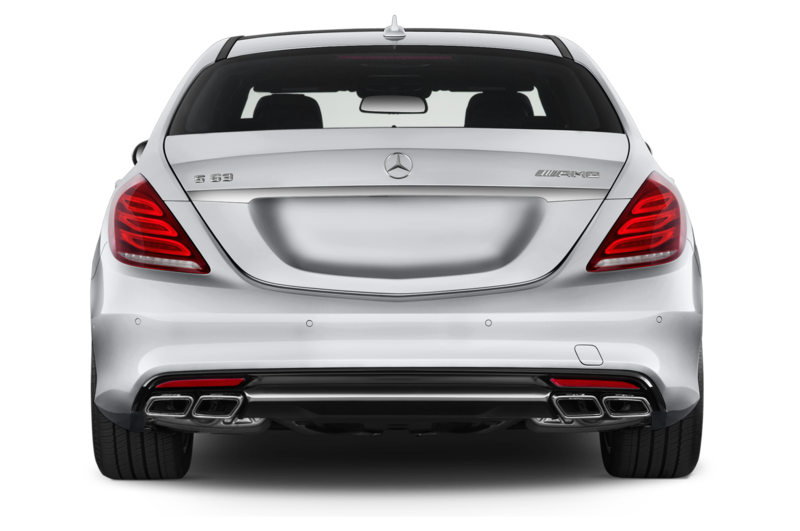 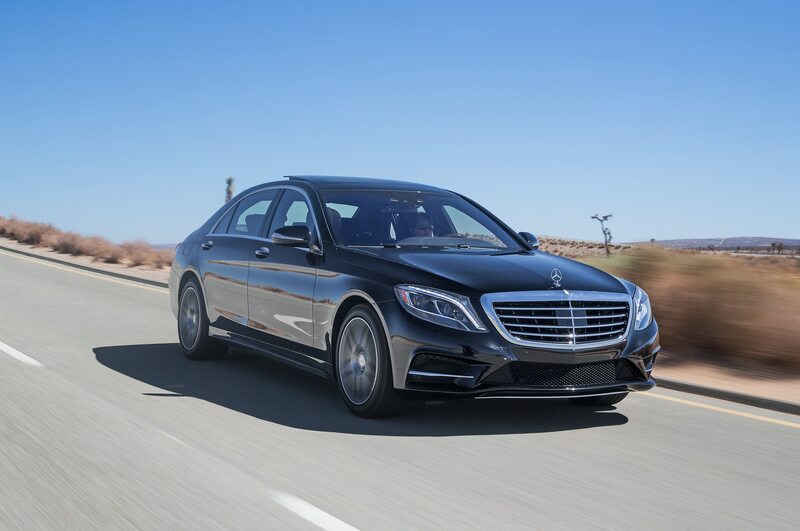 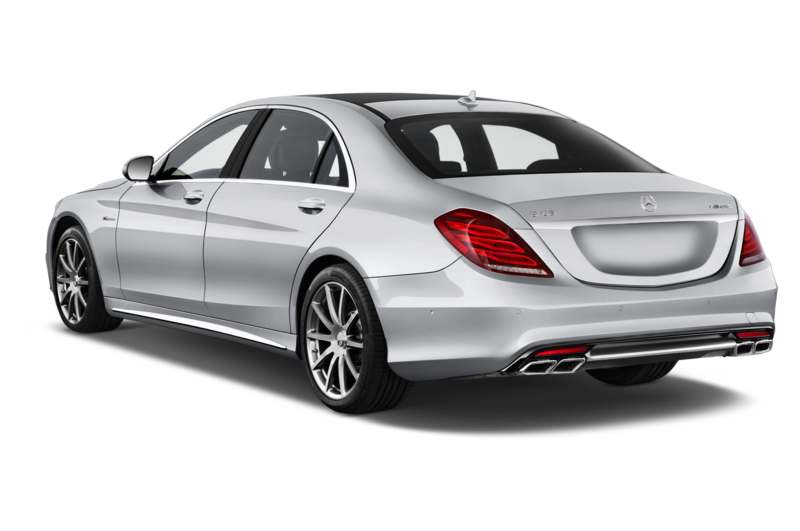 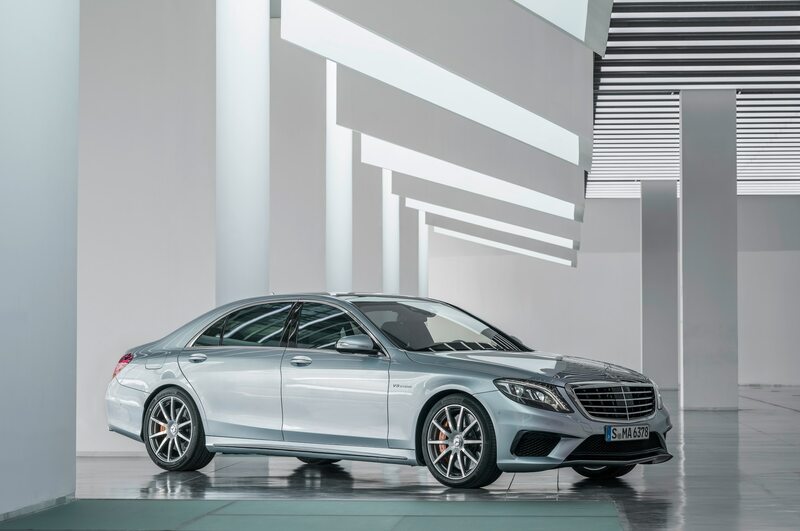 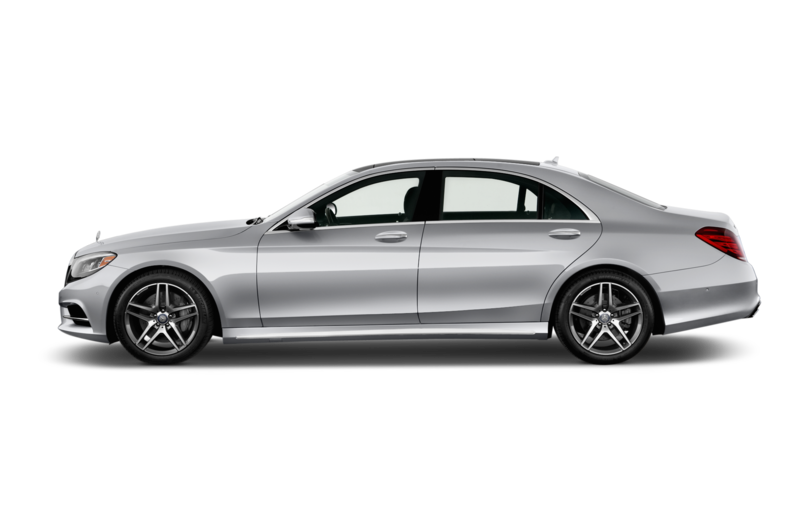 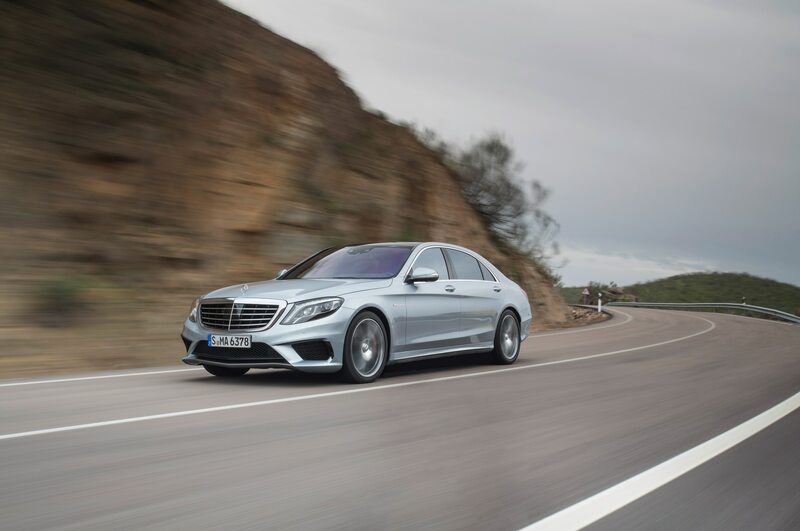 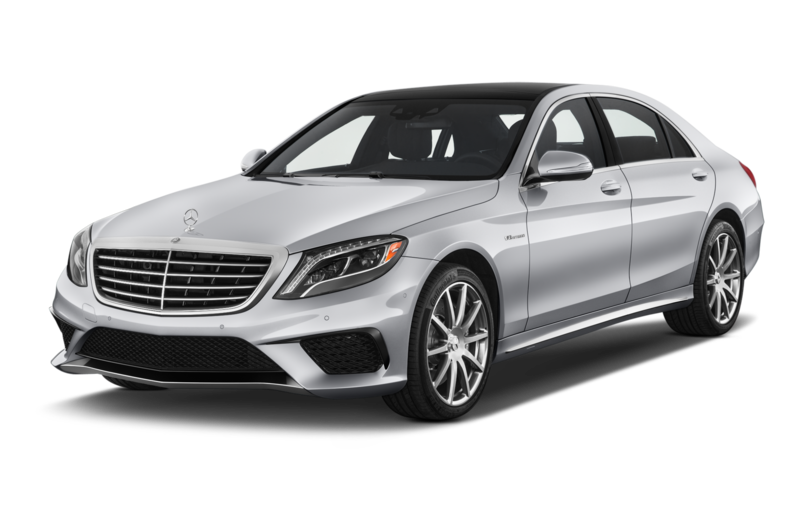 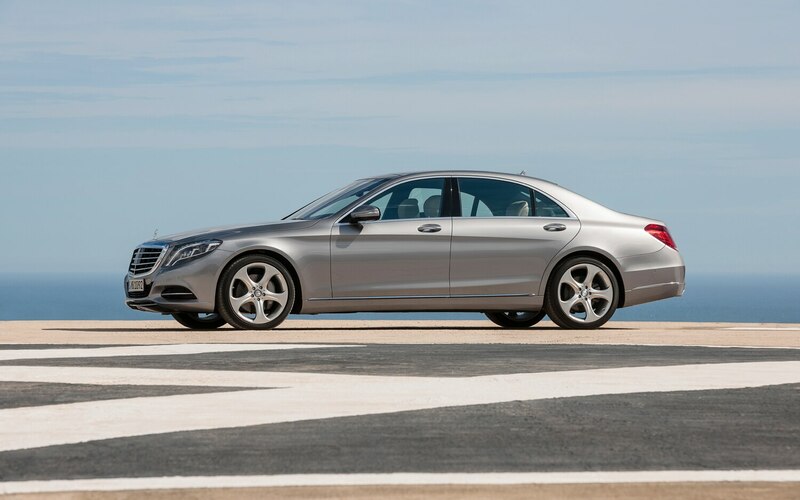 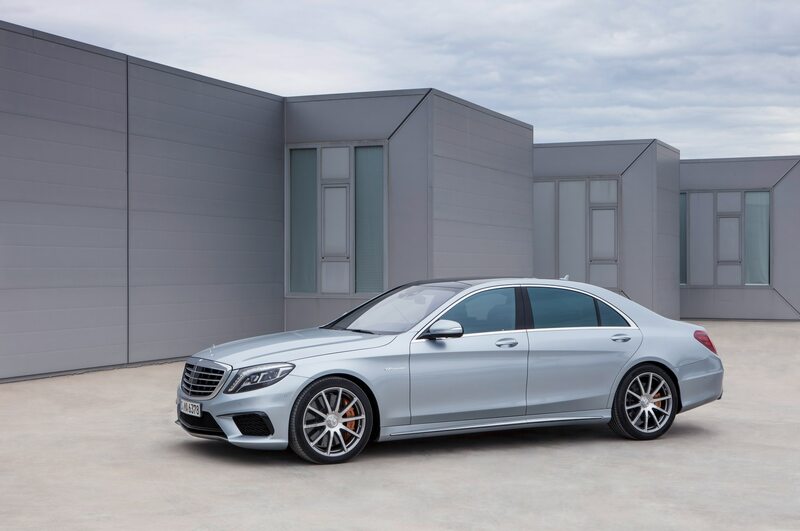 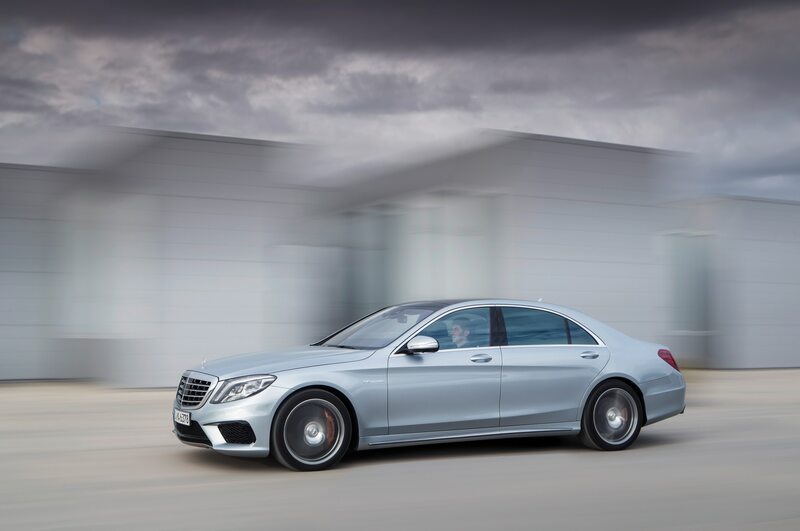 The 2014 S-class (the V222 to the cognoscenti) reinforces its position with more dramatic styling, a more cosseting interior, and more — lots more — leading-edge technology. 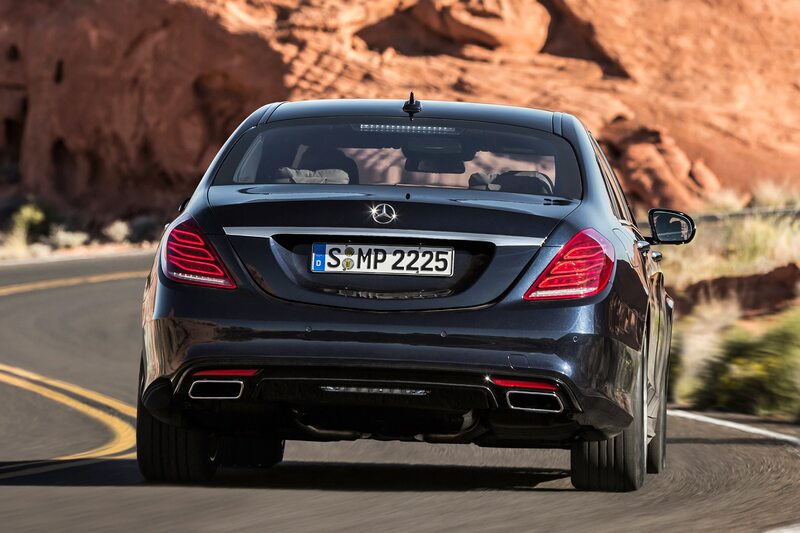 Mechanically, though, much of the V222 S-class is an evolution. 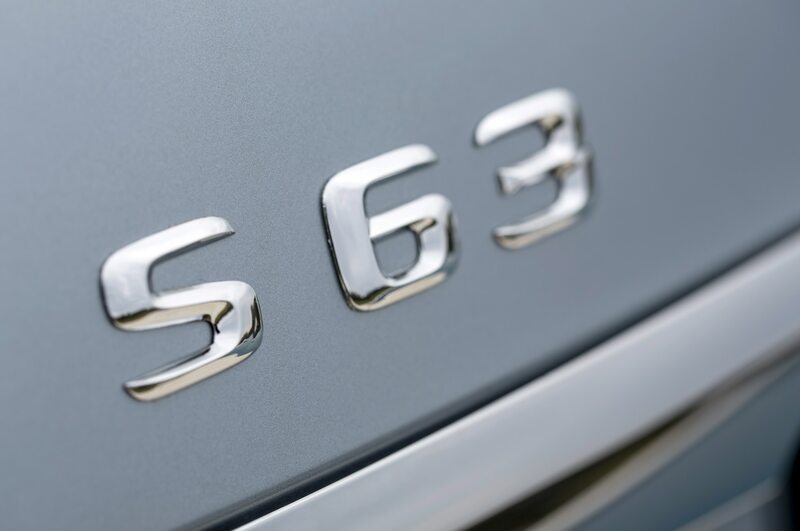 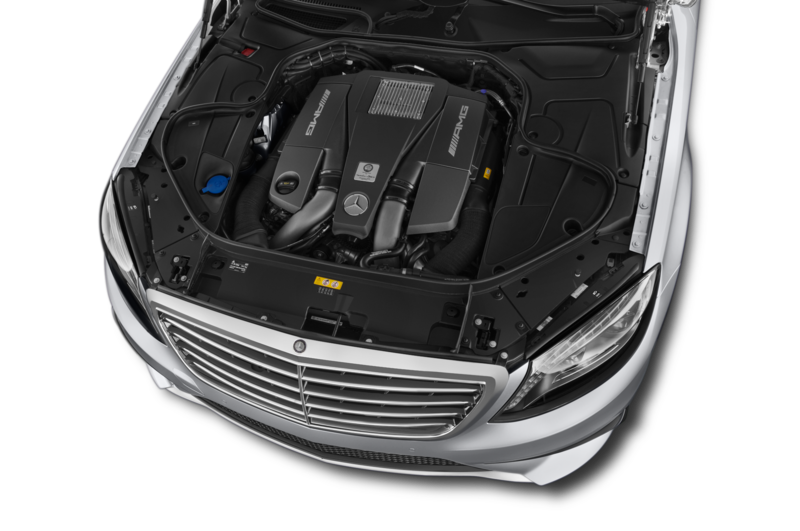 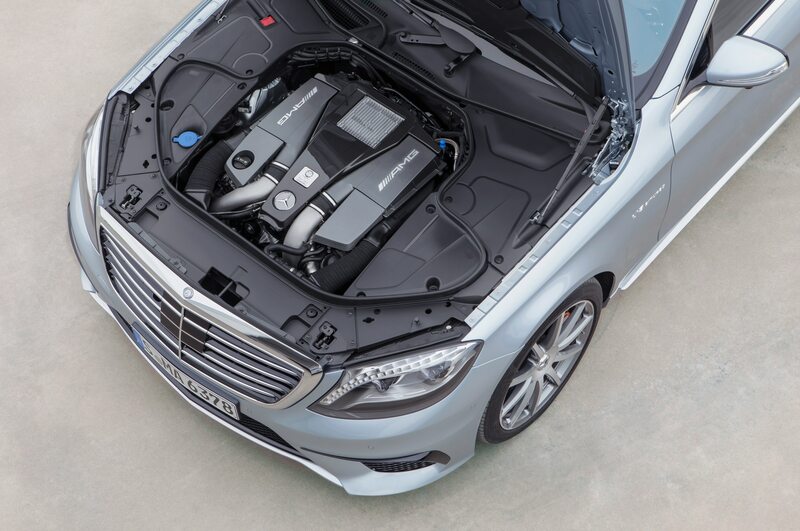 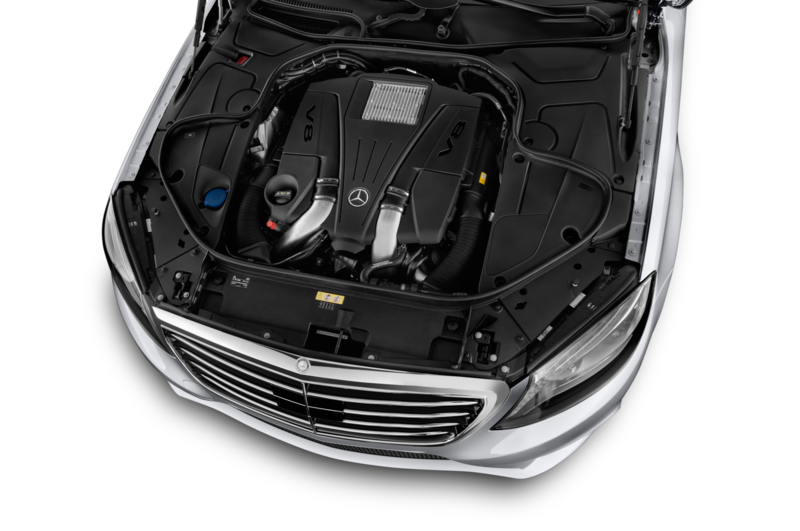 The 4.7-liter twin-turbo V-8 engine of the mainstay S550 (badged S500 in Europe) is essentially carryover, as is the seven-speed automatic transmission. 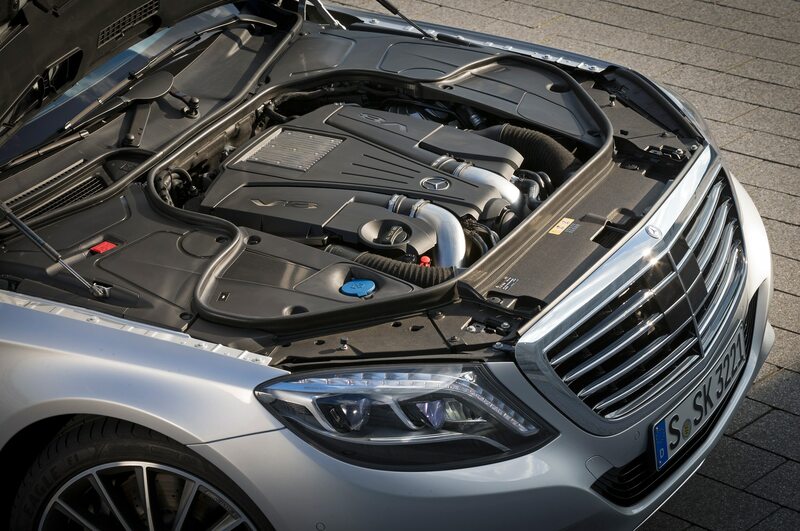 Output has crept up from 429 to 455 hp, but torque is unchanged at 516 lb-ft. As before, the S550 steps lively for such a big machine; it can gather itself up to reach 60 mph in 4.8 seconds, according to Mercedes. 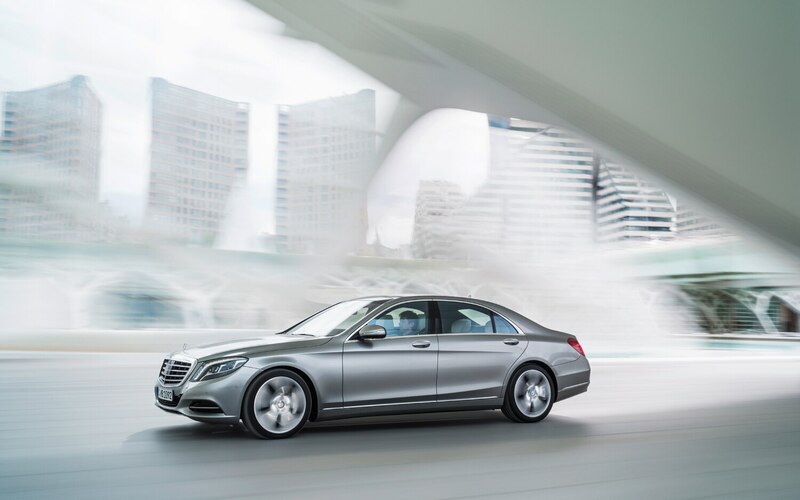 Delve deeply into the long accelerator-pedal travel and the S550 can blast around slower-moving traffic, creating opportunities even in short passing zones. 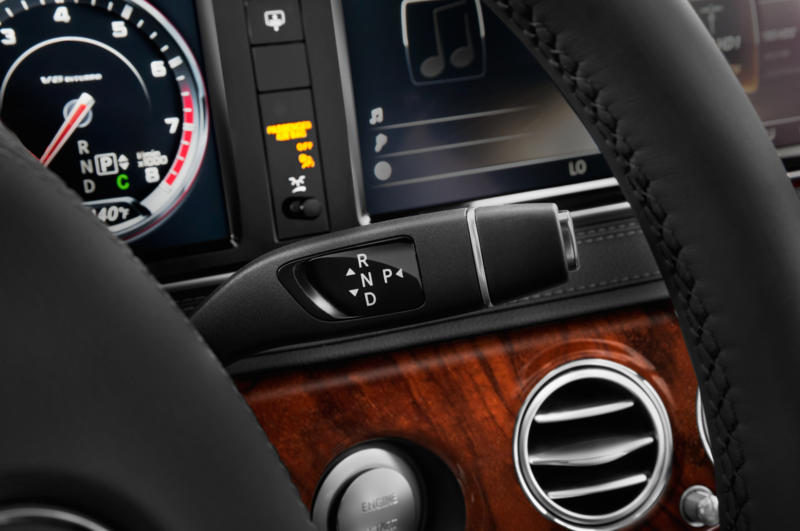 In more relaxed driving, one appreciates the luxuriously smooth and predictable throttle tip-in; turbo lag is unmentionable. 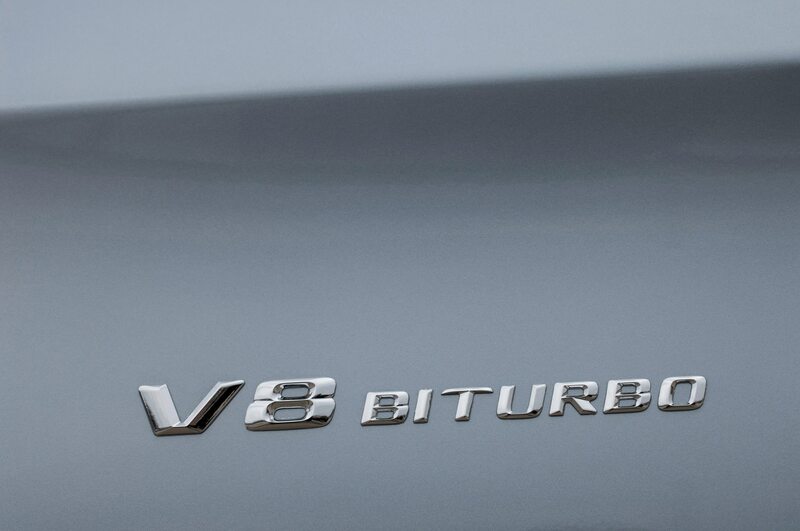 Aside from the slight power increase, chief engineer Dr. Hermann-Joseph Storp says that they worked on the V-8’s sound quality at higher rpm; indeed, when it crosses 3000 rpm the engine emits a muted burble, while at lower engine speeds it’s barely audible. Despite the power increase, Mercedes engineers were able to achieve a roughly five percent improvement in efficiency (although U.S. EPA figures aren’t yet available). 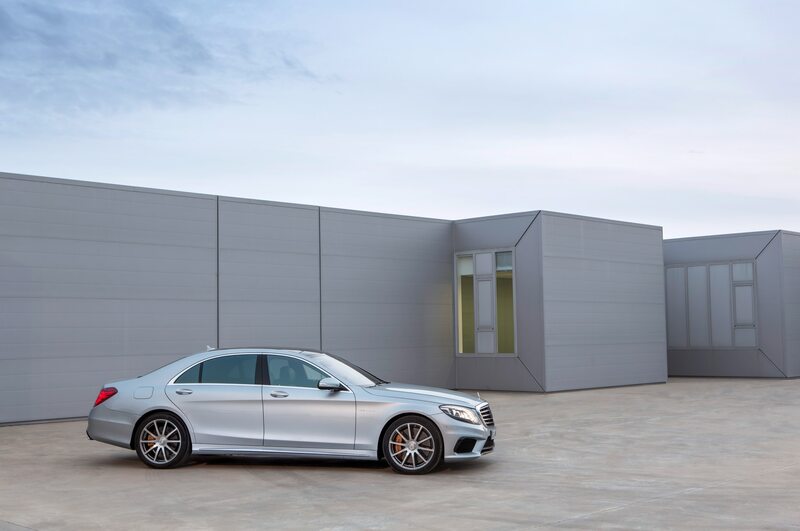 All outer body panels are aluminum, including the roof — a first at Mercedes-Benz. 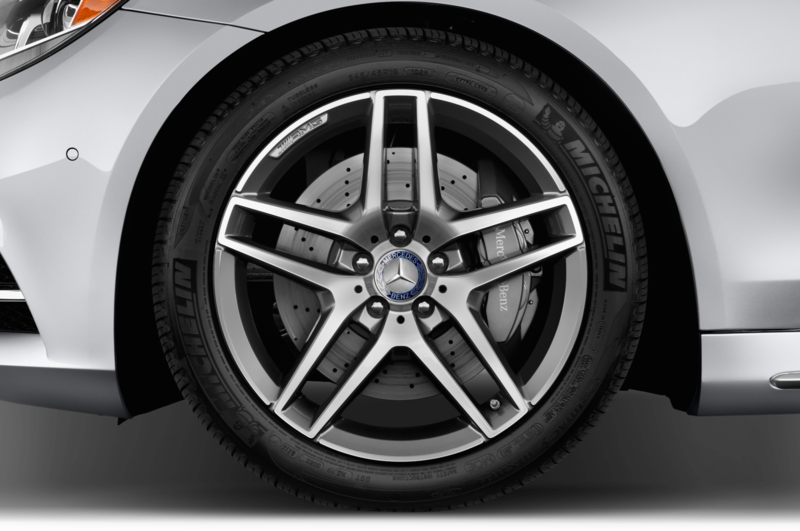 Aluminum is used in the under-the-skin structure as well, including the suspension. 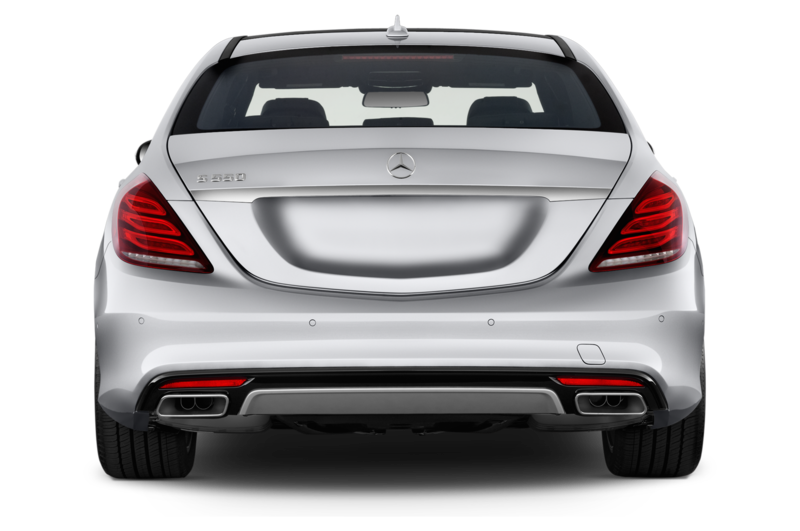 Air springs return, along with adaptive dampers. The system has grown more sophisticated in that it’s now infinitely adjustable rather than simply switchable between soft and firm. 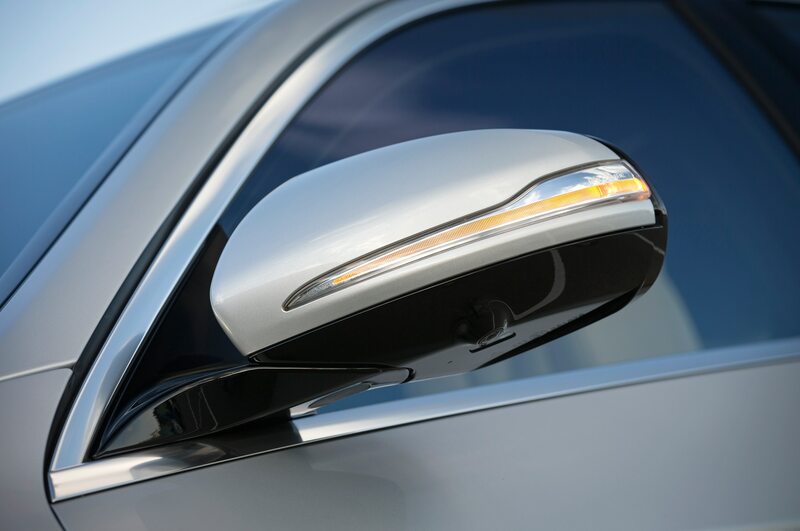 The bigger news, however, is the optional Magic Body Control, in which a set of stereo cameras located behind the rearview mirror scan the road 45 feet ahead so that the suspension can adjust to bumps before the wheels reach them. 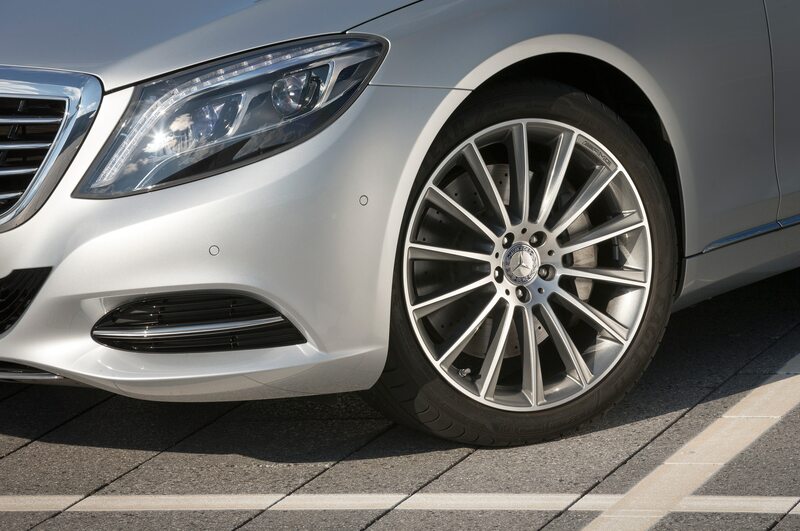 Because bad pavement is hard to find in this part of Germany, Mercedes set up a demonstration with two five-inch-tall speed bumps. 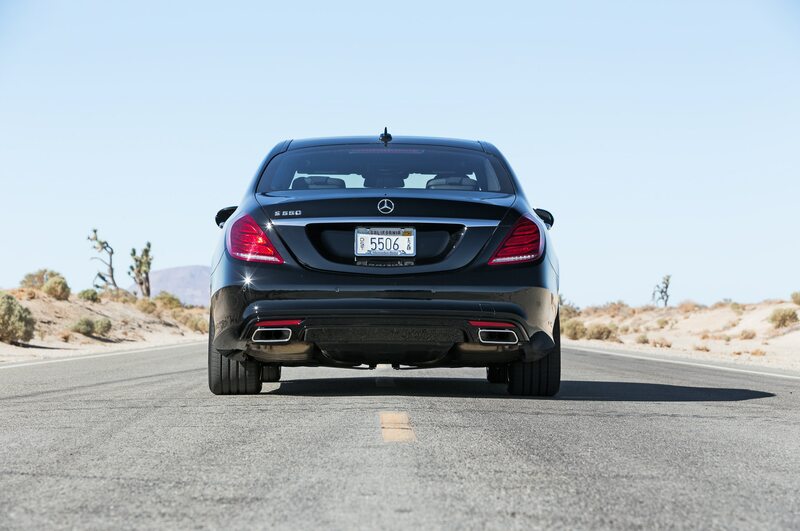 First we drove across them at 25 mph with Magic Body Control deactivated, and the effect was about what you’d expect: a gentle rise and fall. 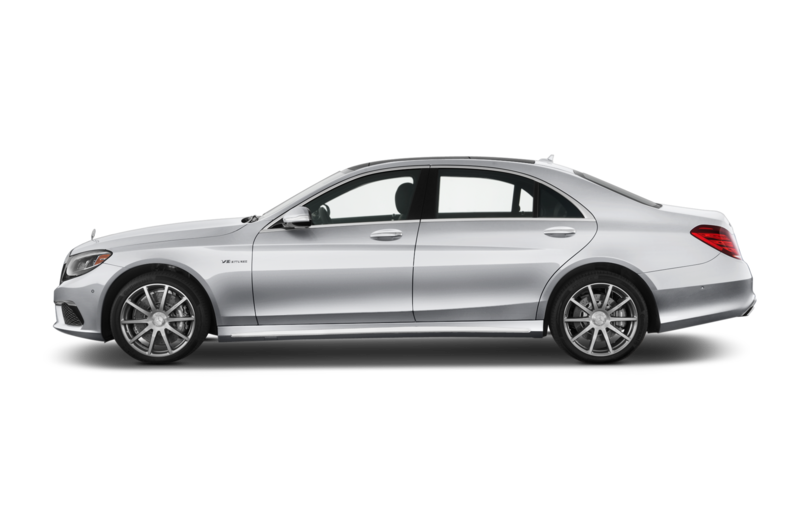 Then we repeated the exercise at the same speed with the system working, and it was almost as if the bumps had been erased. 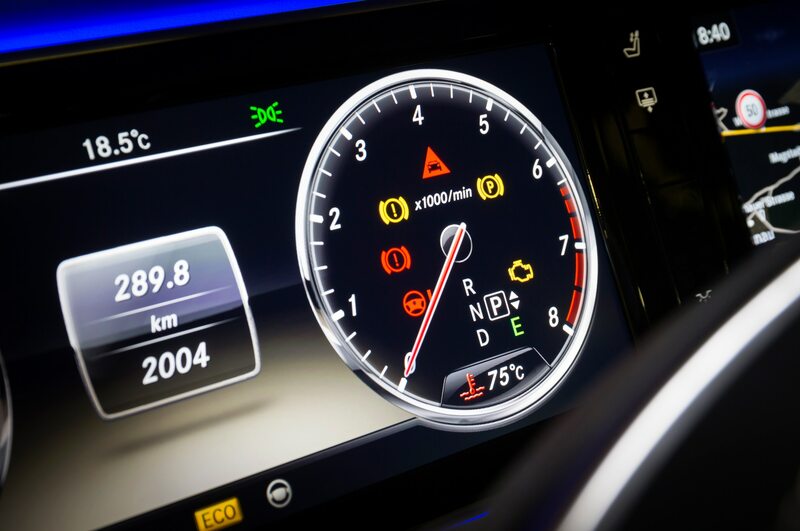 One oddity of the system, however, is that it works only when the suspension is in comfort mode, not sport. 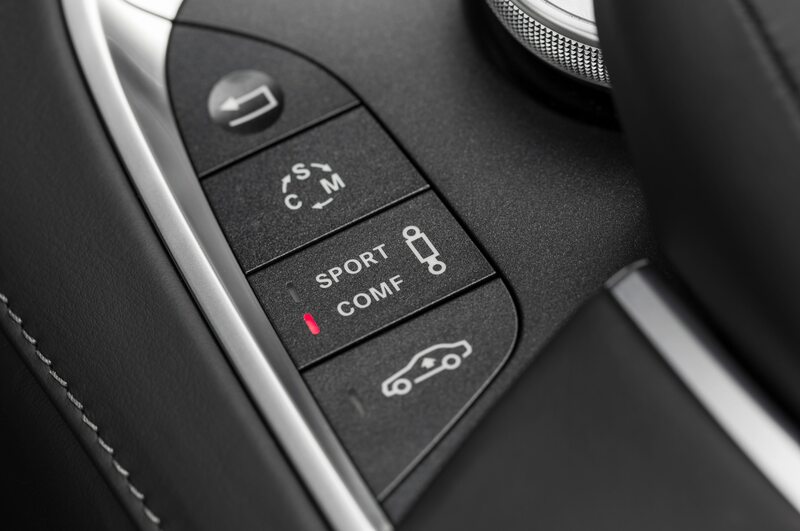 It seems to us that a suspension in sport mode is more likely to suffer harshness and therefore would benefit much more from Magic Body Control than the cushy standard mode. 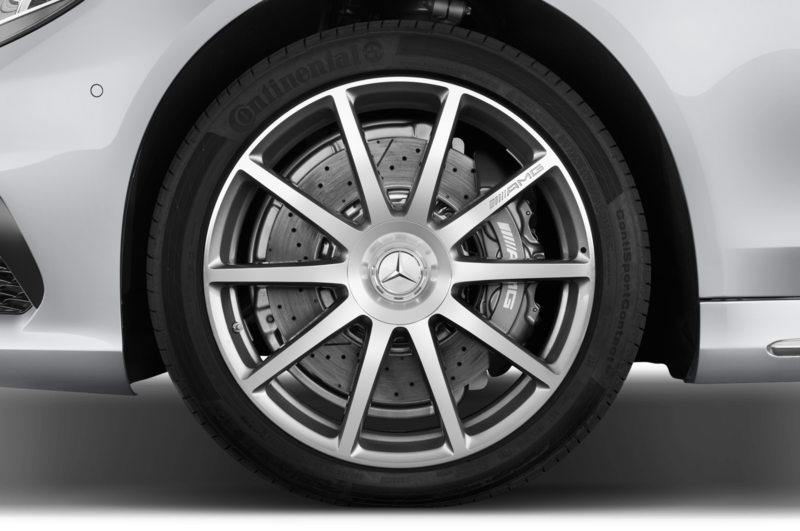 Other than enabling or disabling Magic Body Control, there isn’t much difference between the two modes, either in suspension firmness or steering effort. 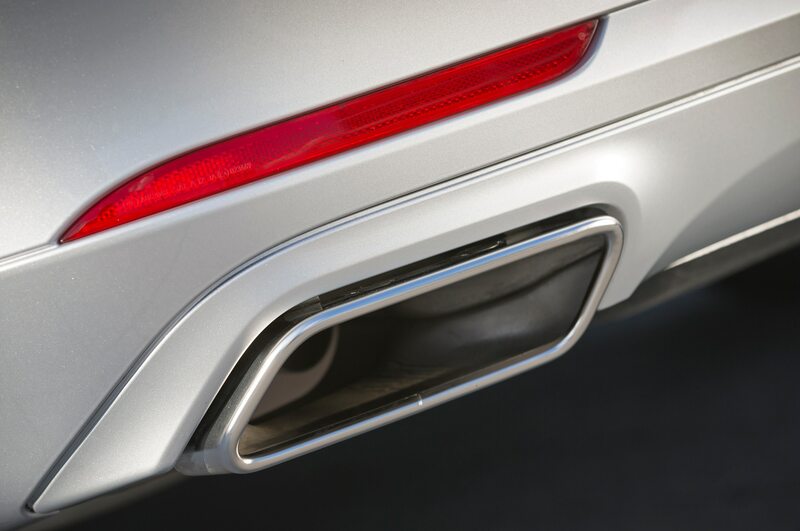 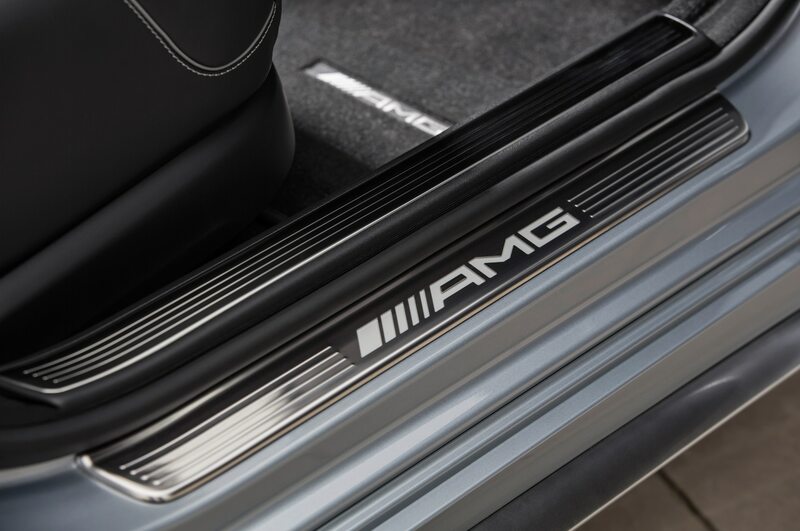 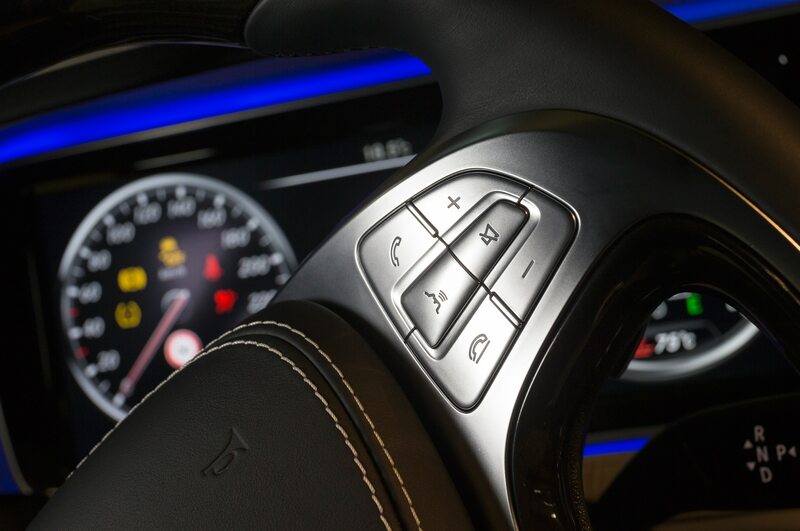 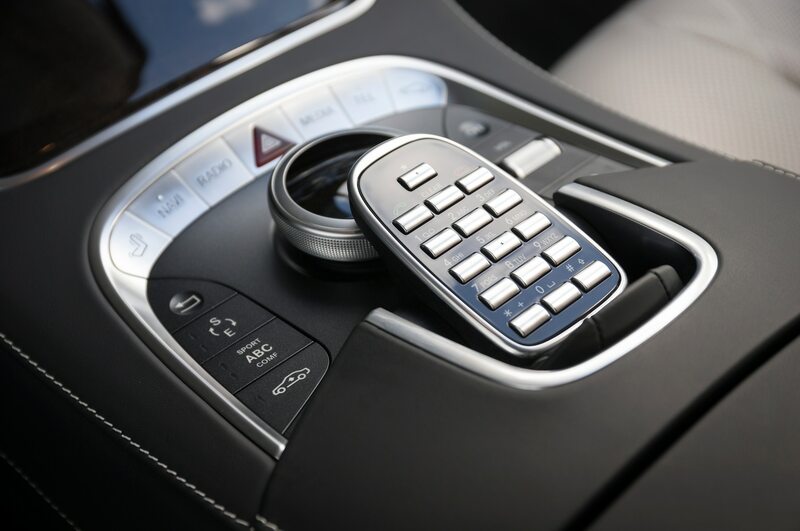 Regarding the latter, the V222 switches to electric power assist, but Mercedes has done a remarkable job exactly imitating the action and effort of the previous hydraulic system. 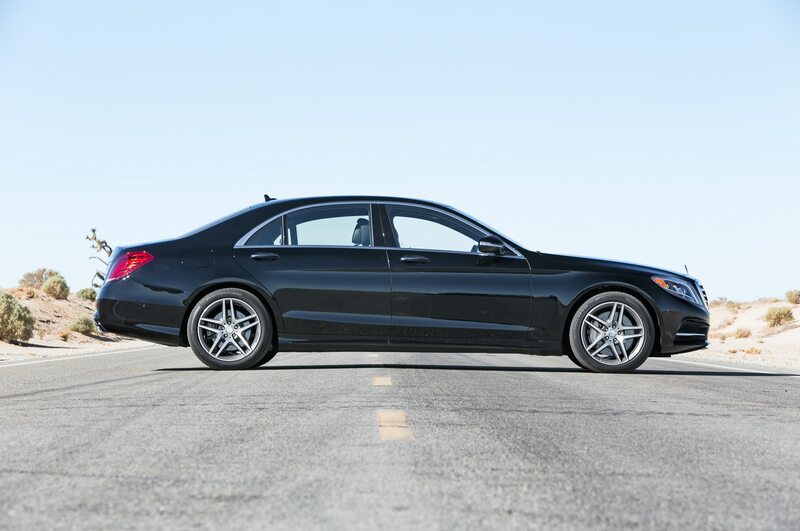 We were also surprised at the maneuverability of this big machine. 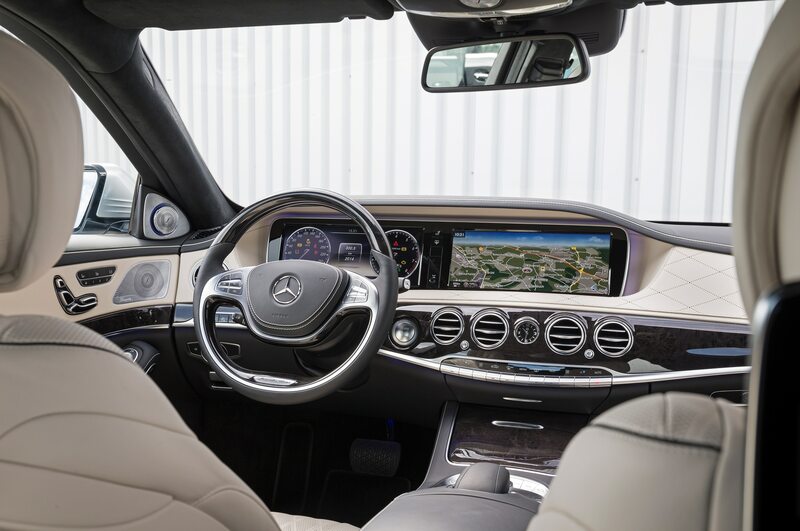 A tight, 40-foot turning circle combined with a split-view screen showing both the backup camera and an overhead 360-degree view makes tight spots a lot less intimidating. 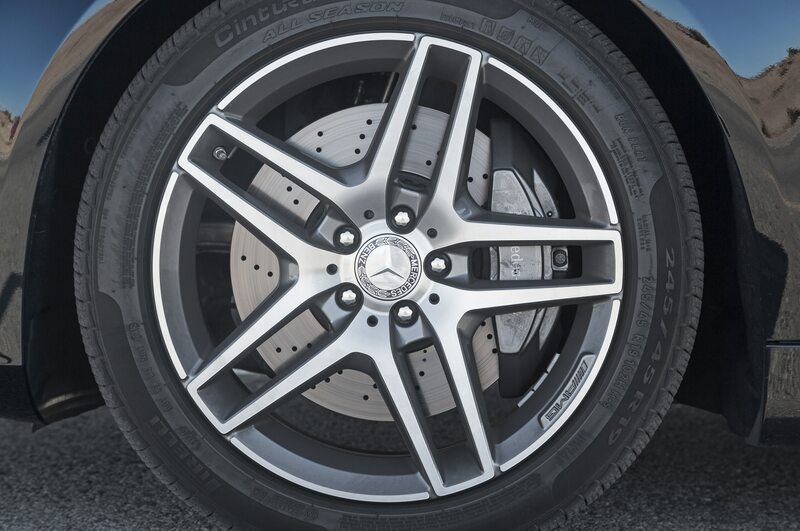 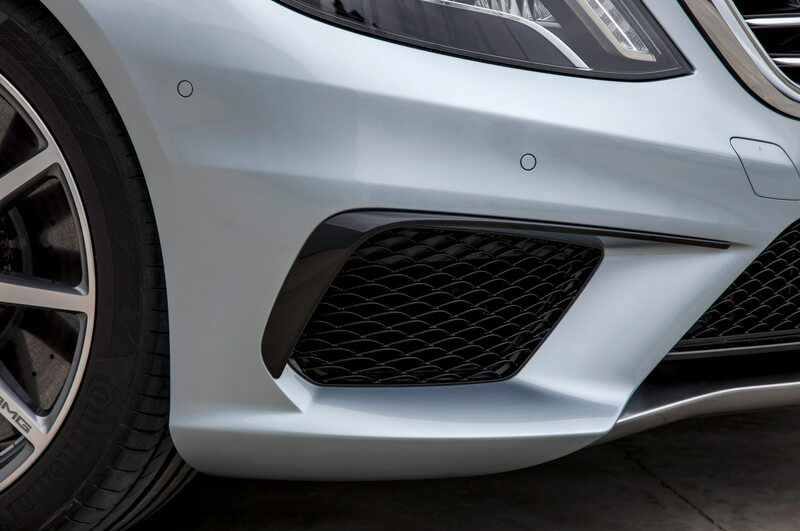 Further chassis enhancements concern the braking system. 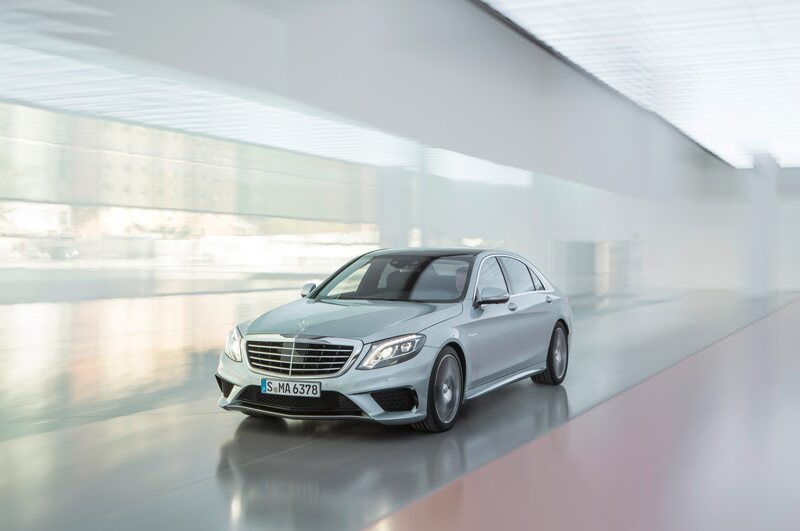 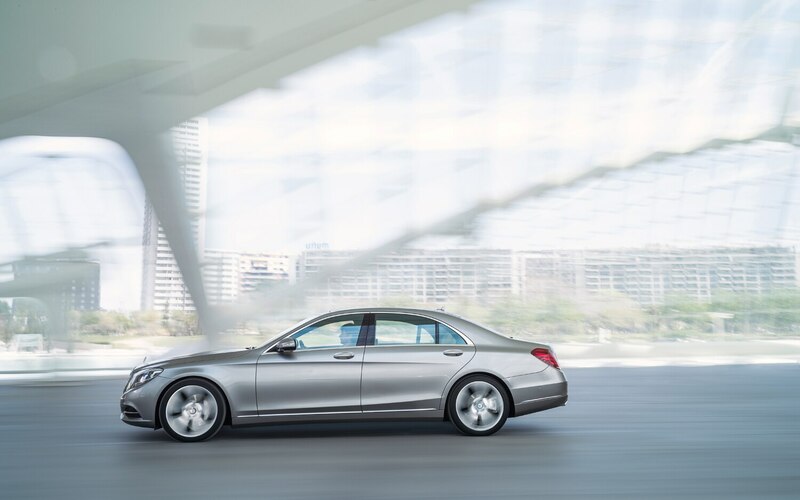 The S-class adds a city braking function and pedestrian detection capability and can, after warning the driver, autonomously brake to avoid a collision at speeds up to 31 mph (or mitigate a collision at speeds up to 45 mph). 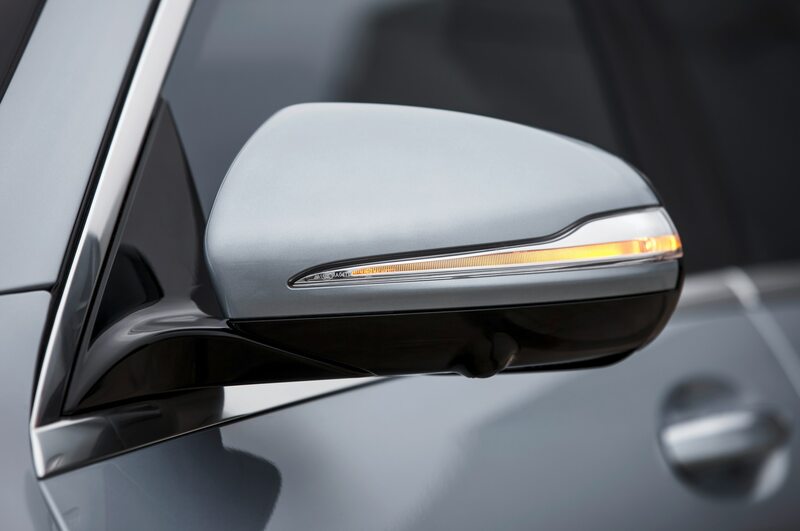 The new BAS Plus can detect cross traffic, warning the driver and assisting with braking to avoid a collision. 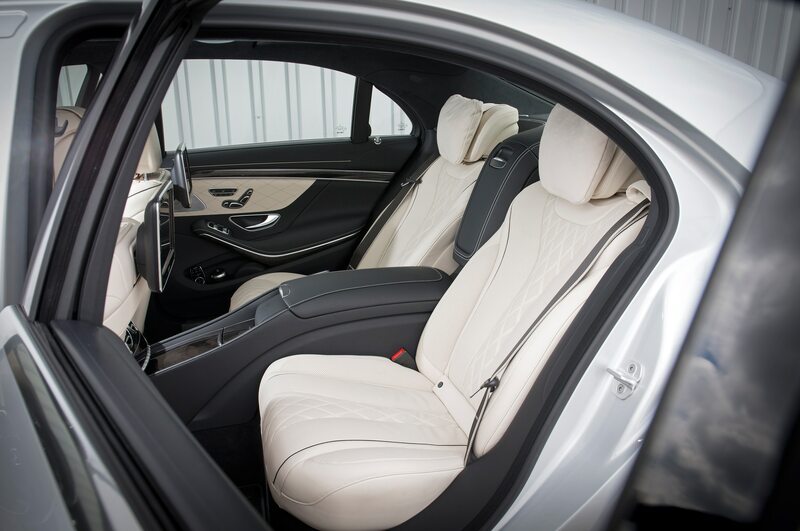 Finally, Pre-Safe Plus can detect an imminent rear-end collision and can prepare for it by cinching the seatbelt tensioners and firmly applying the brakes, reducing potential for whiplash injuries and secondary crashes. 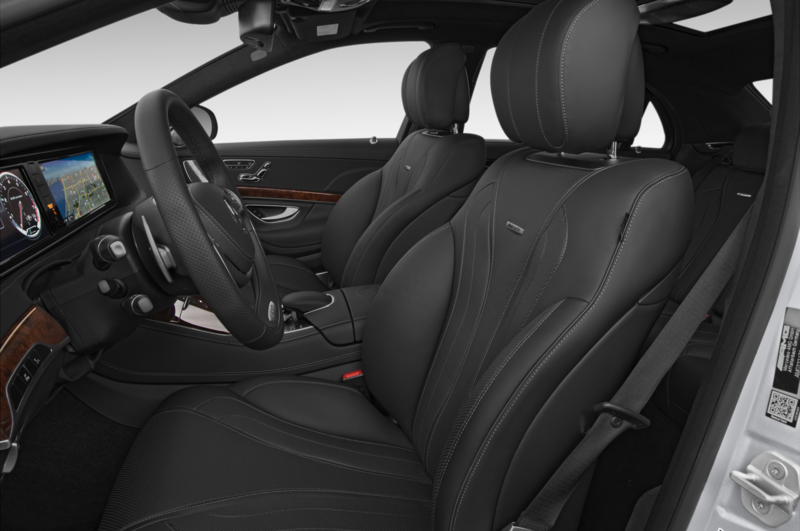 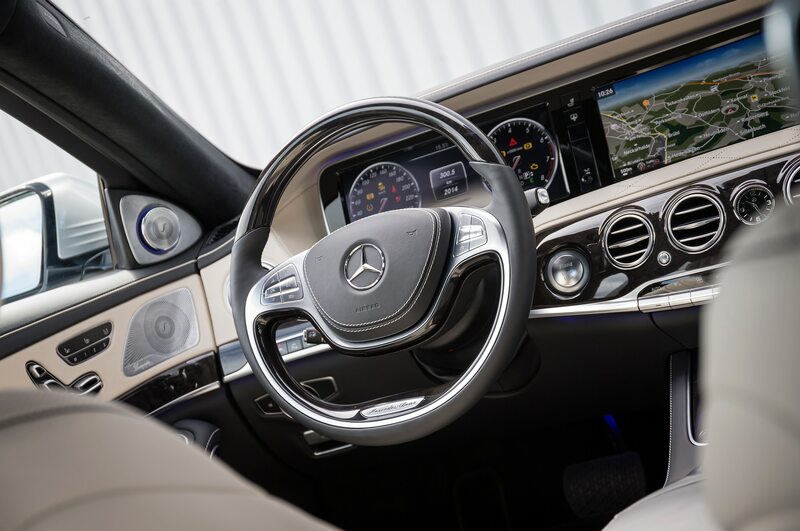 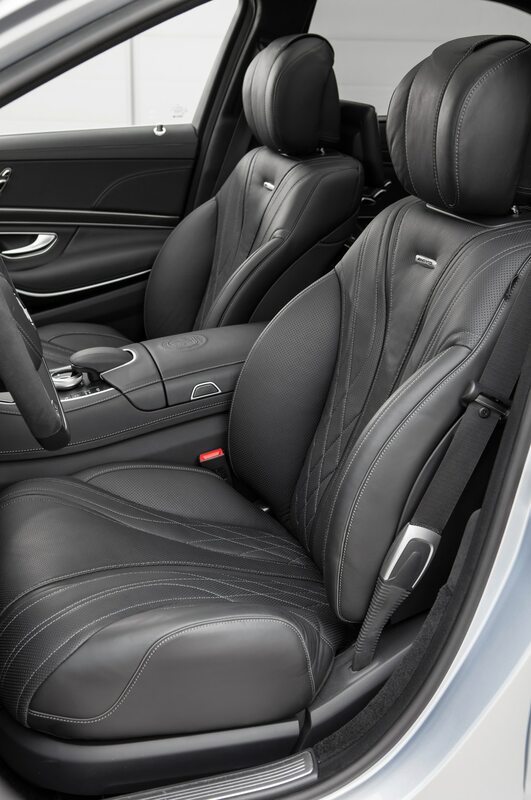 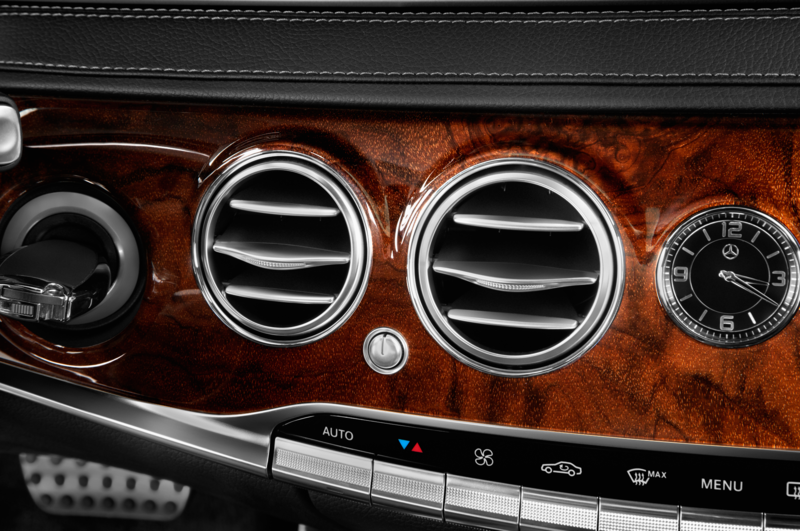 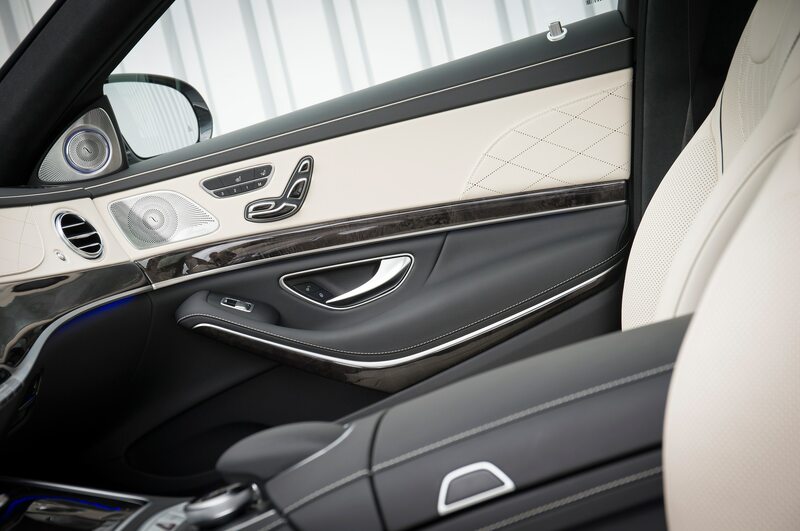 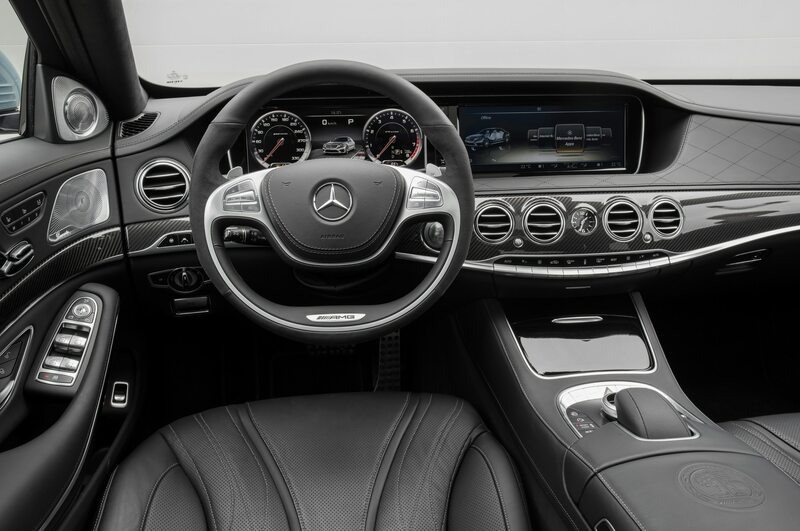 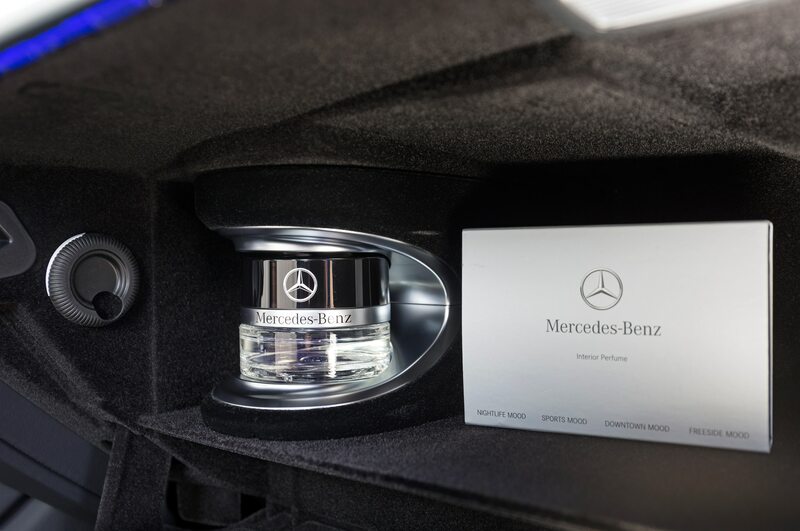 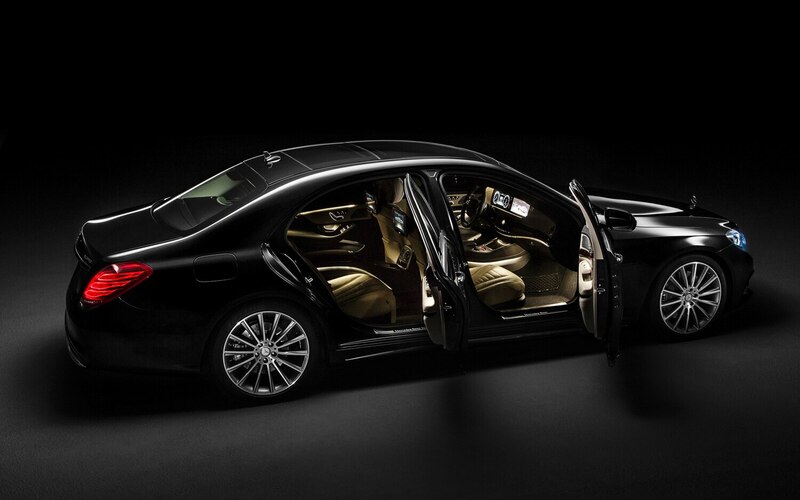 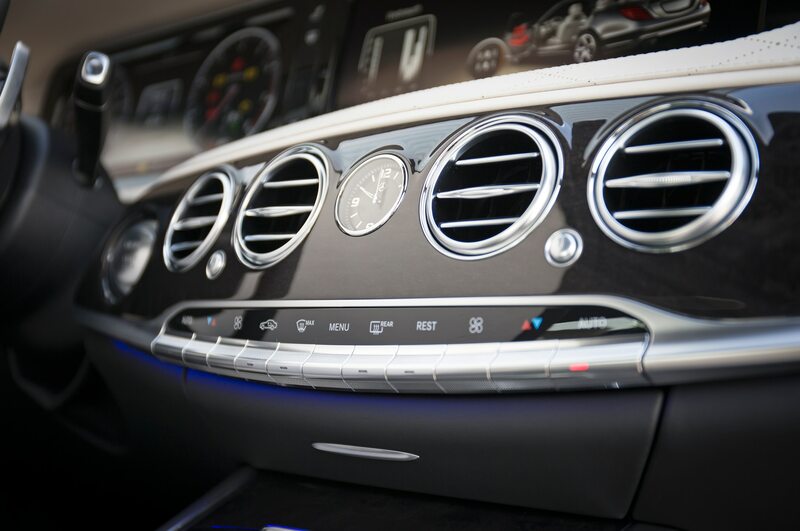 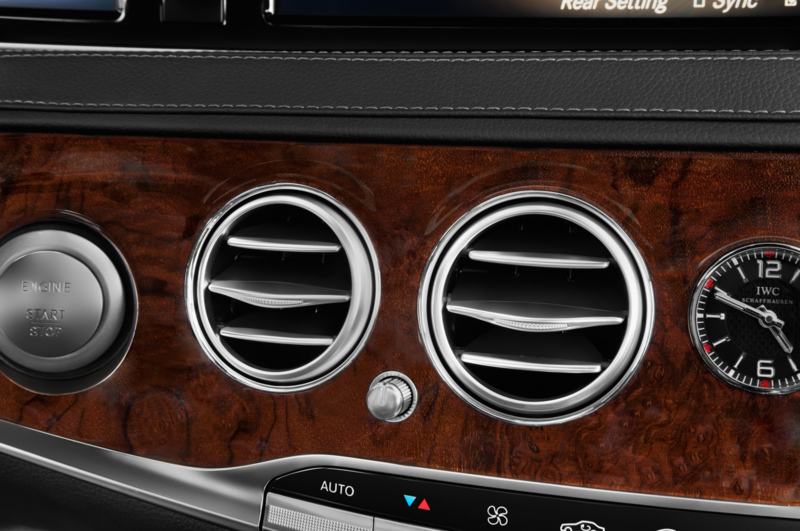 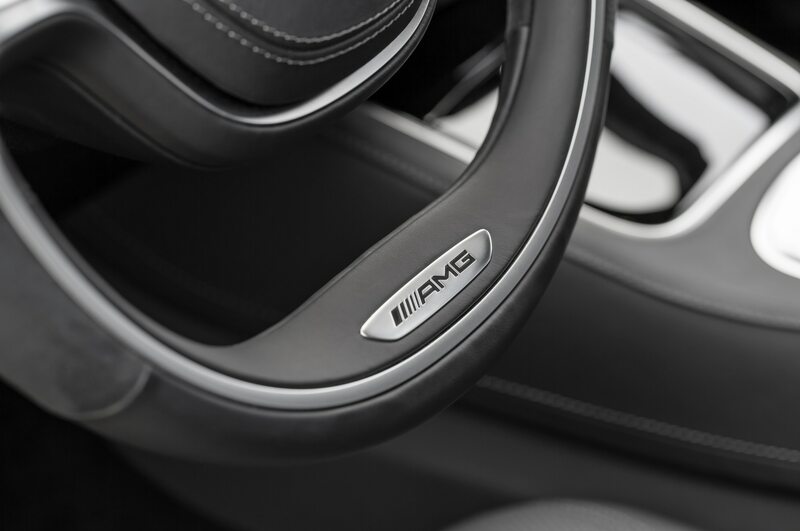 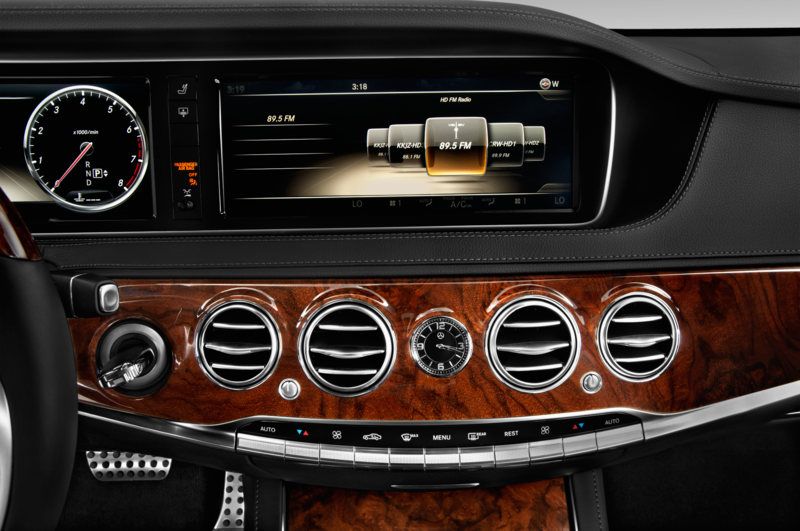 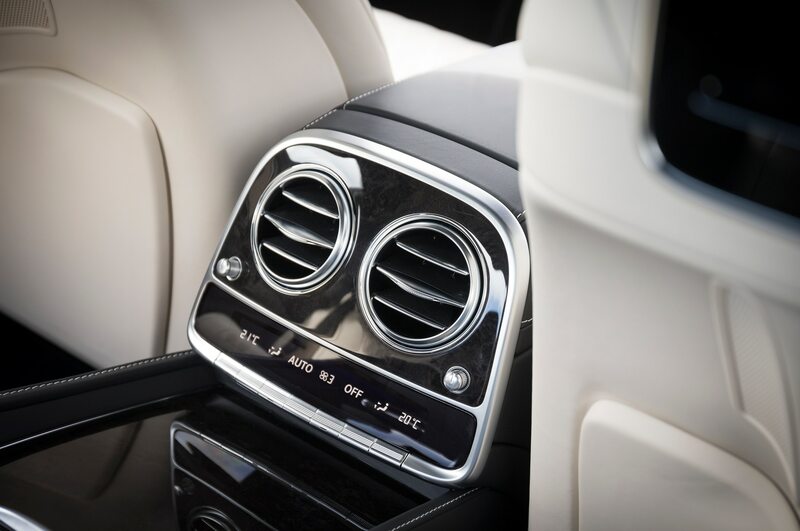 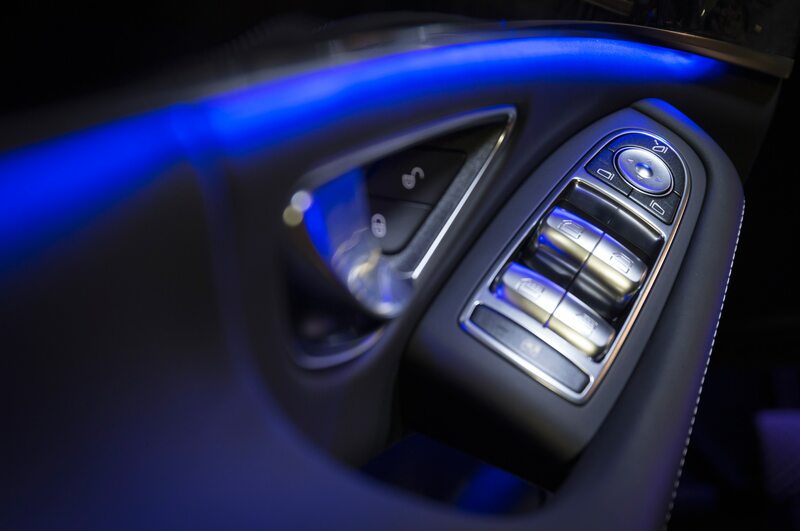 Like the chassis, the S-class’s interior combines the familiar and the new. 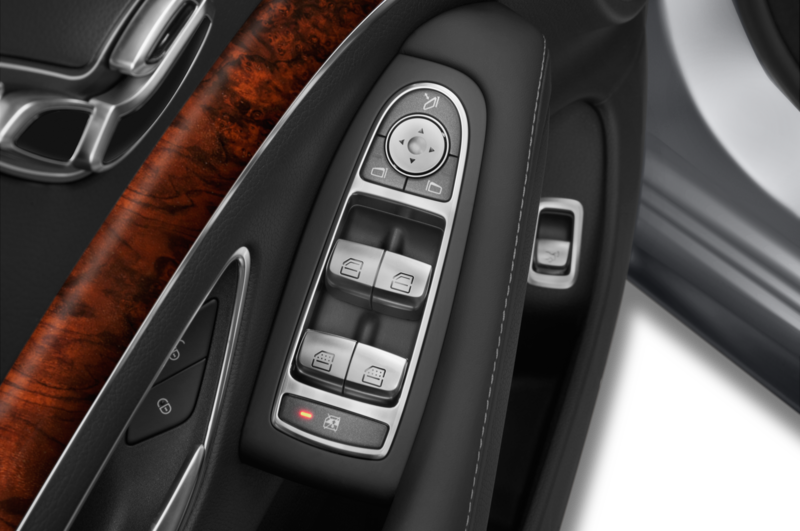 The Comand controller returns and is easier to use than ever, as it’s surrounded by more function-specific buttons. 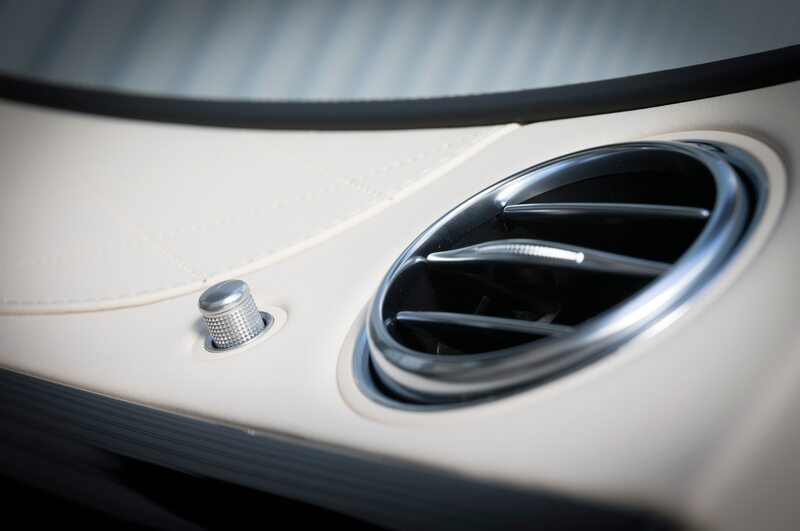 A line of silver buttons again stretches across the center stack; they look nice but could stand some separation of function. 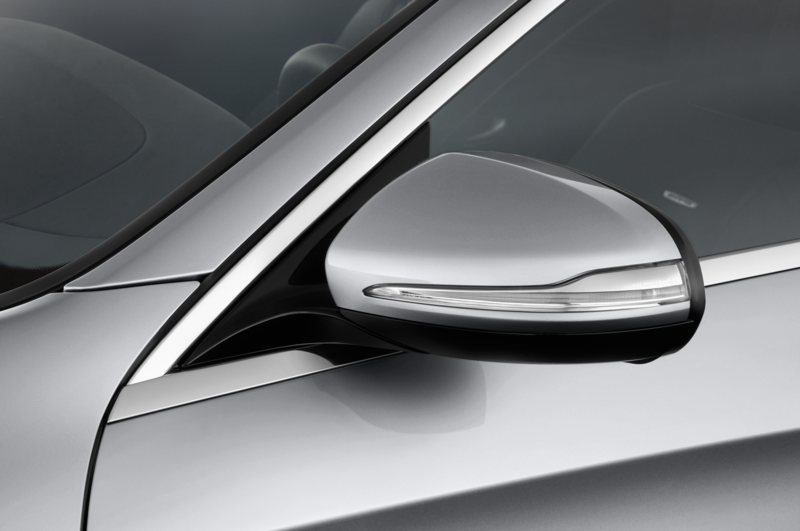 The dash itself takes a new, wraparound shape. 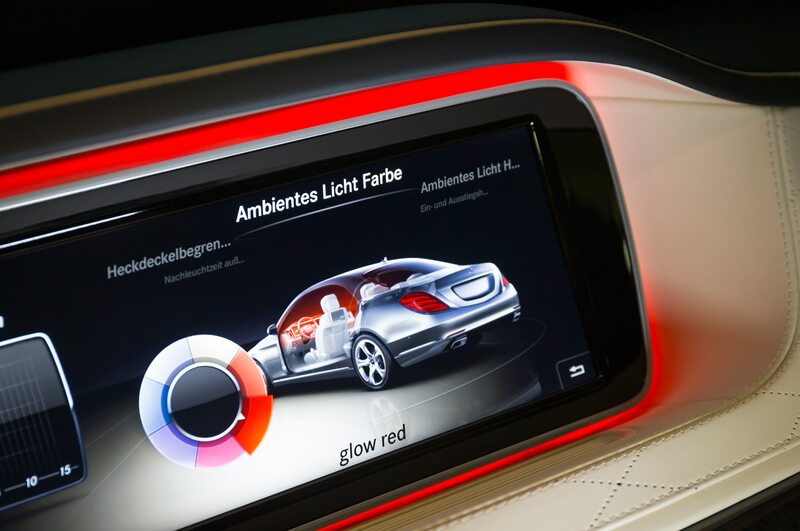 Two 12.3-inch-diagonal TFT screens stand proud of it, and colored ambient lighting glows from behind. 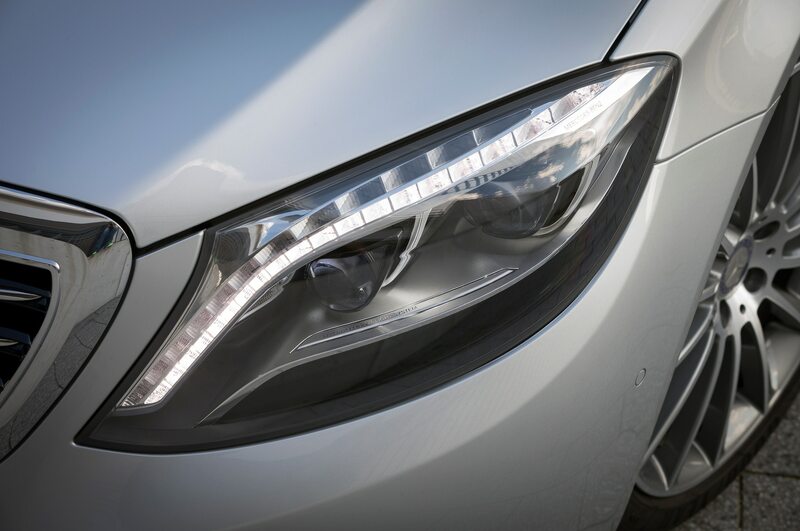 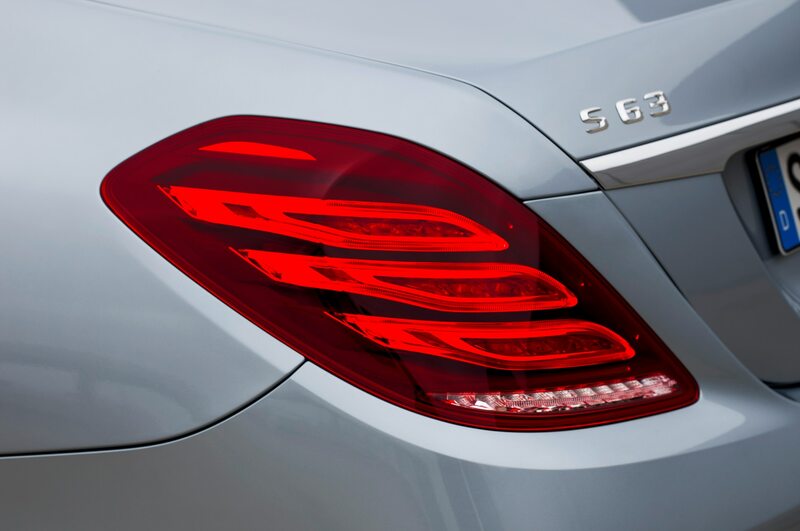 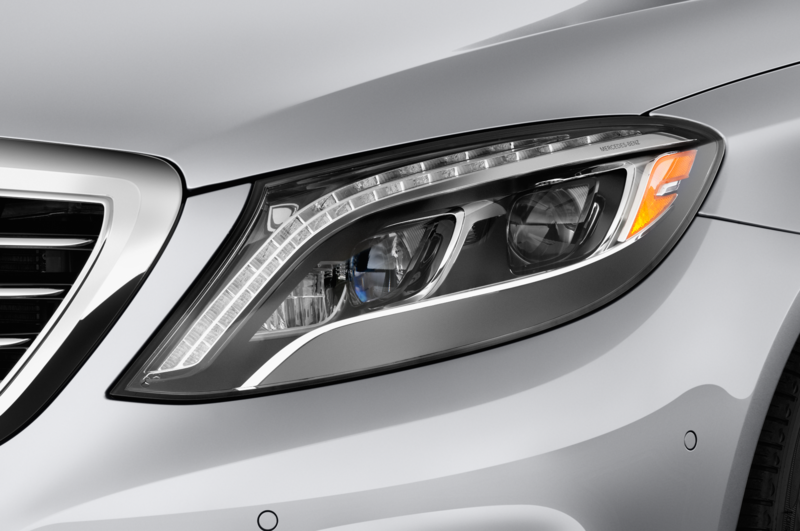 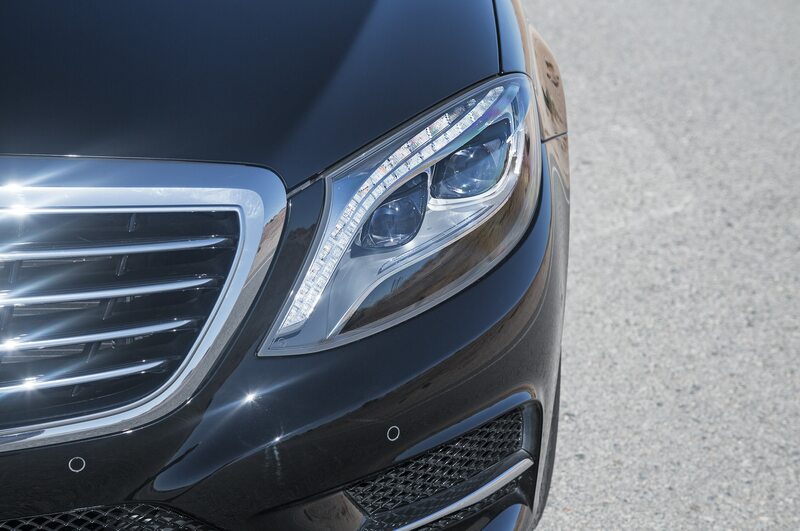 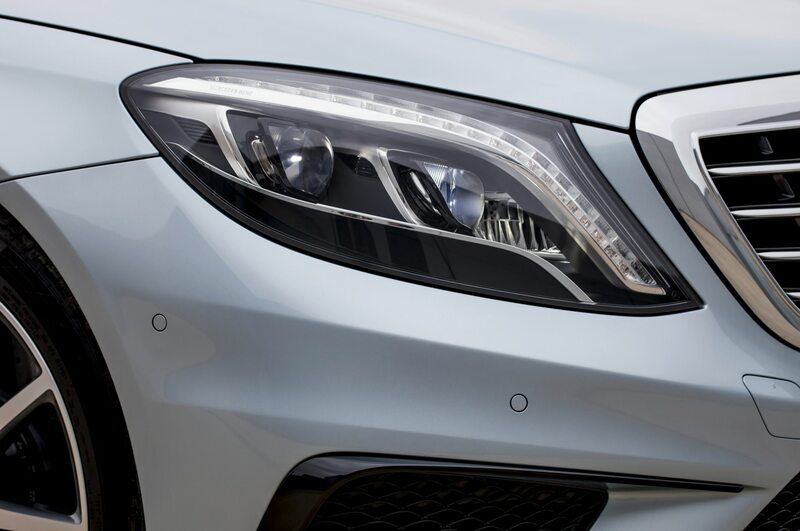 That lighting is LED, as is all lighting on the S-class. 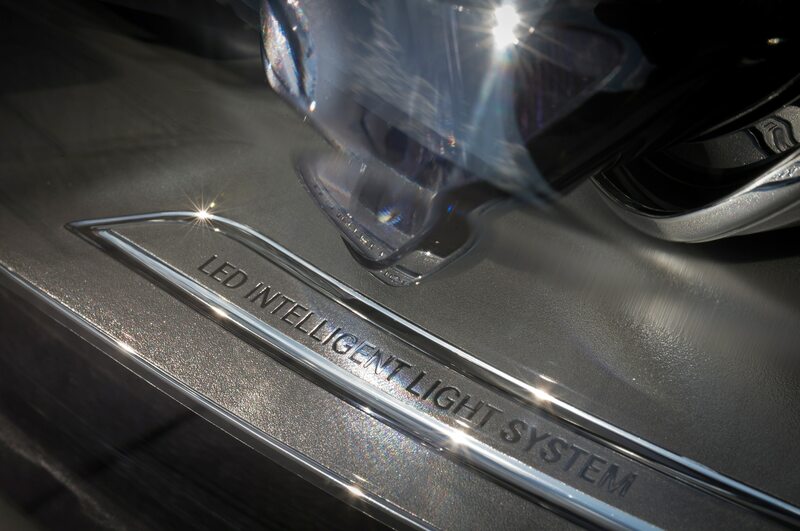 That’s right — no incandescent bulbs. 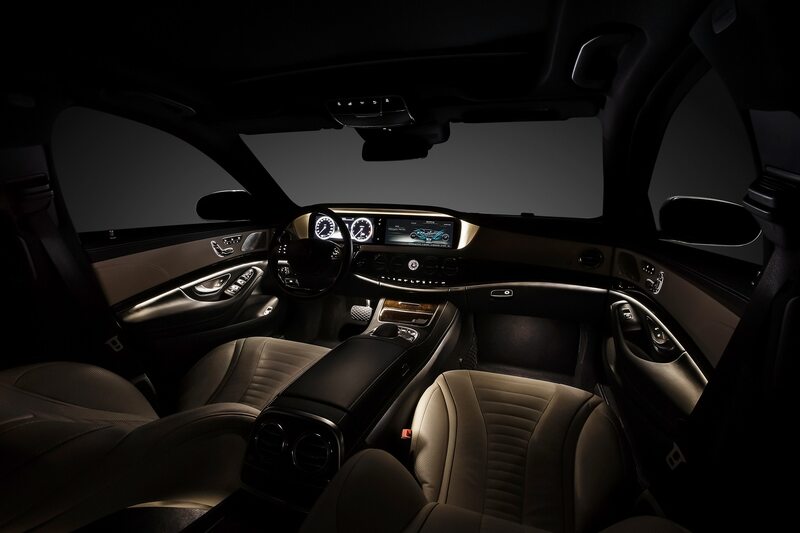 Combining the interior and the exterior, there are some 500 LEDs in total. 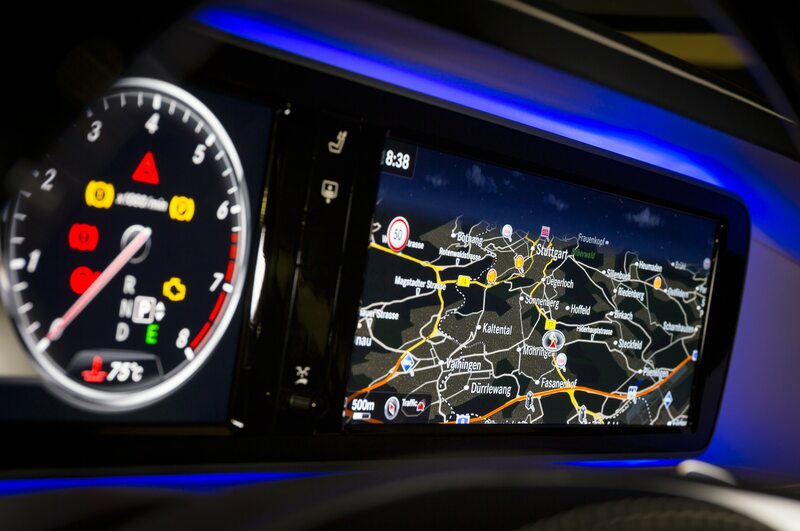 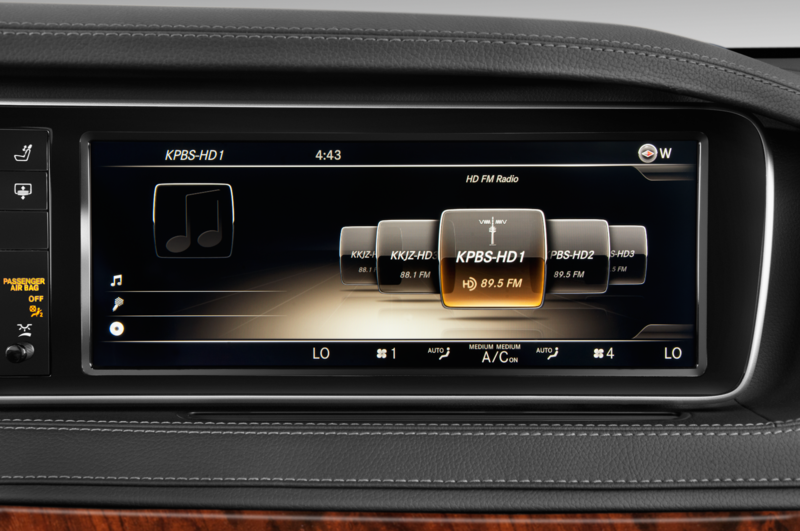 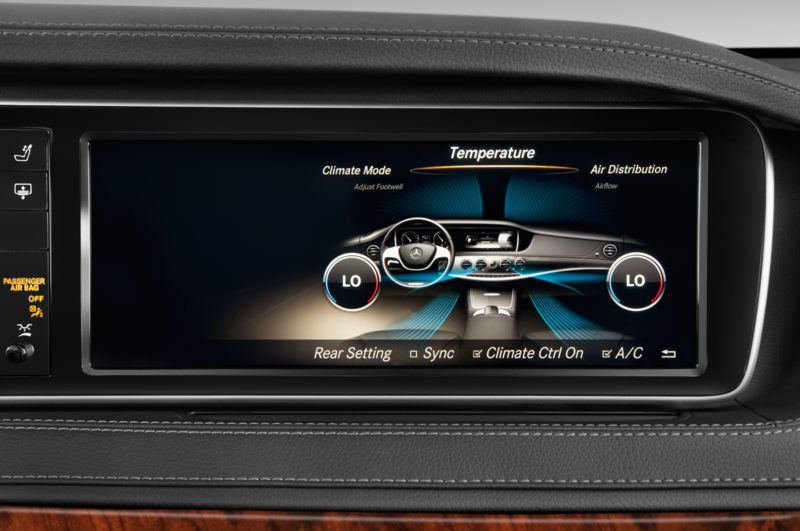 The big center screen displays navigation, audio, climate control, camera views, et cetera. 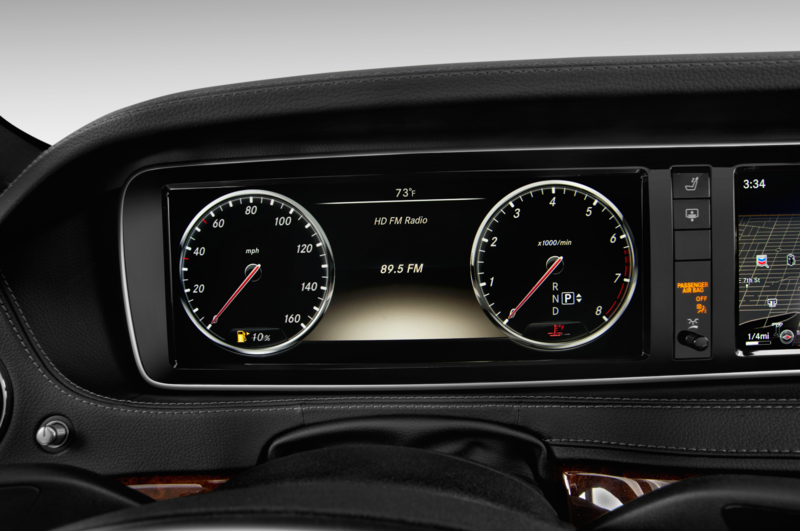 It can now read text messages aloud, and navigation destinations can be inputted as a single spoken entry. 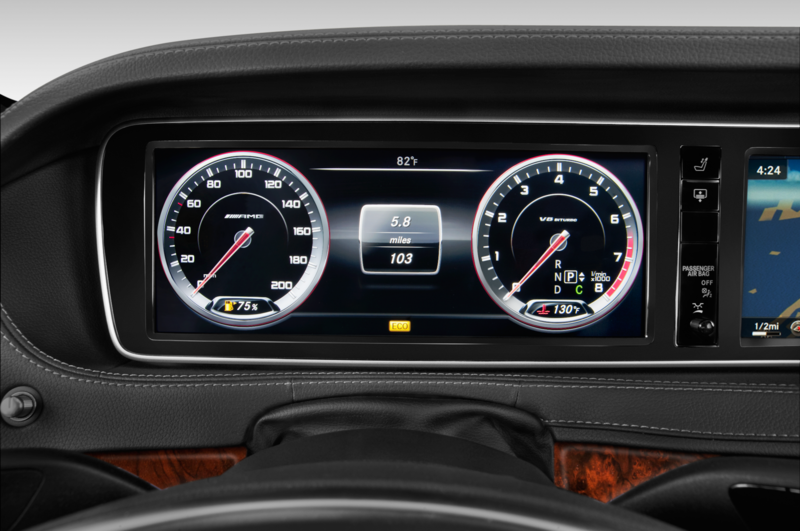 The screen in front of the driver houses the virtual speedometer and tachometer (à la Jaguar) with a reconfigurable space in between for the trip computer, navigation or audio info, or night vision. 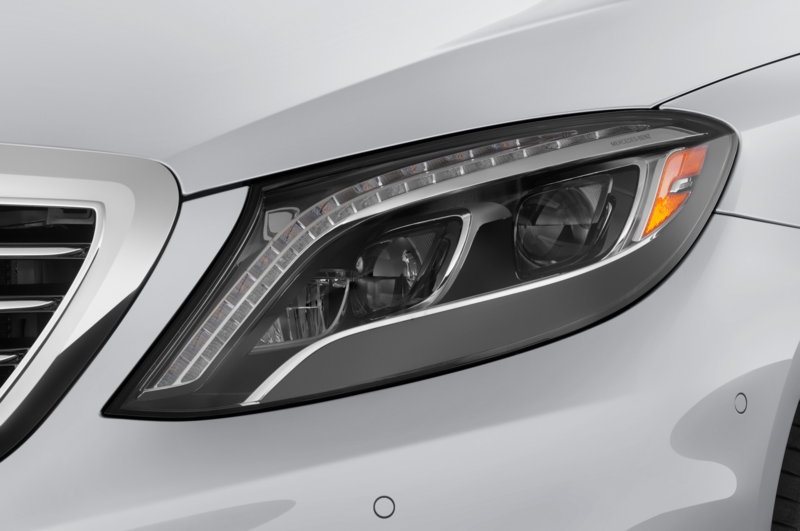 The last item is much enhanced, adding infrared imaging to the previous optical camera. 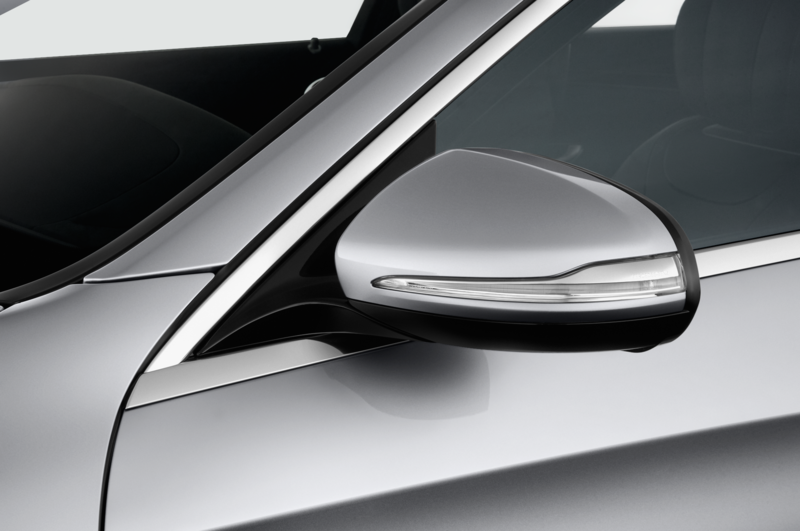 Some of the new features, though, smack of over reaching. 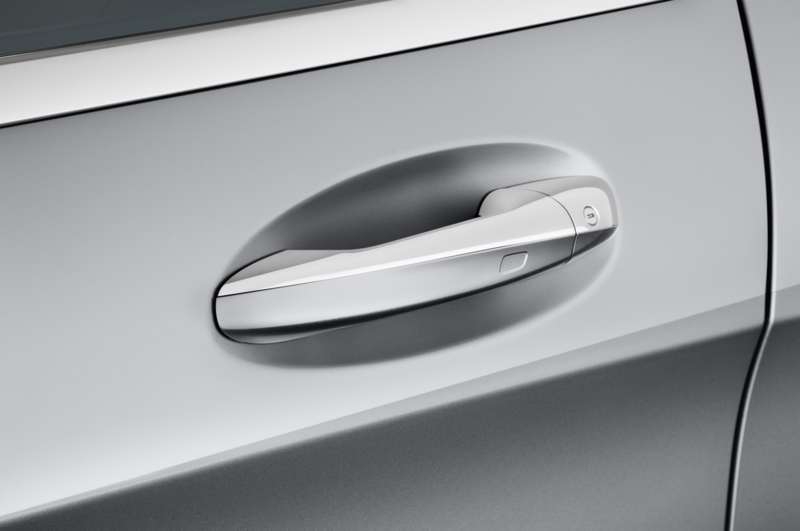 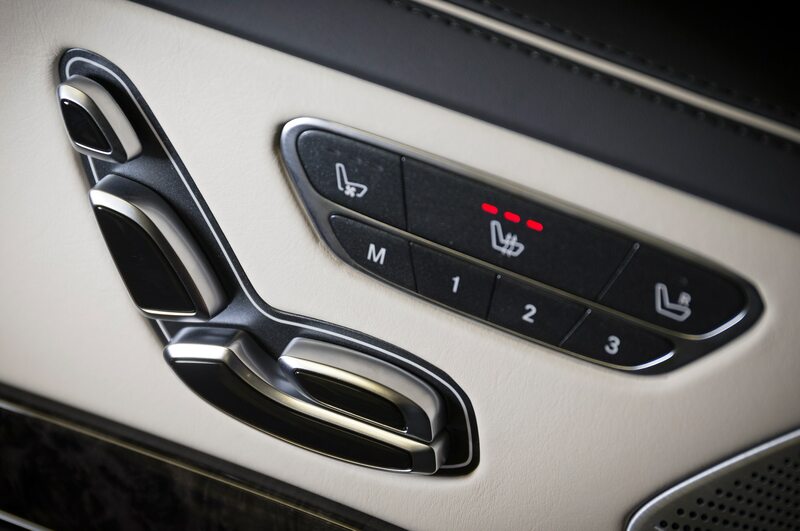 Heated door armrests and center armrests, for example, seem unlikely to become the wintertime essentials that heated seats or even heated steering wheels have. 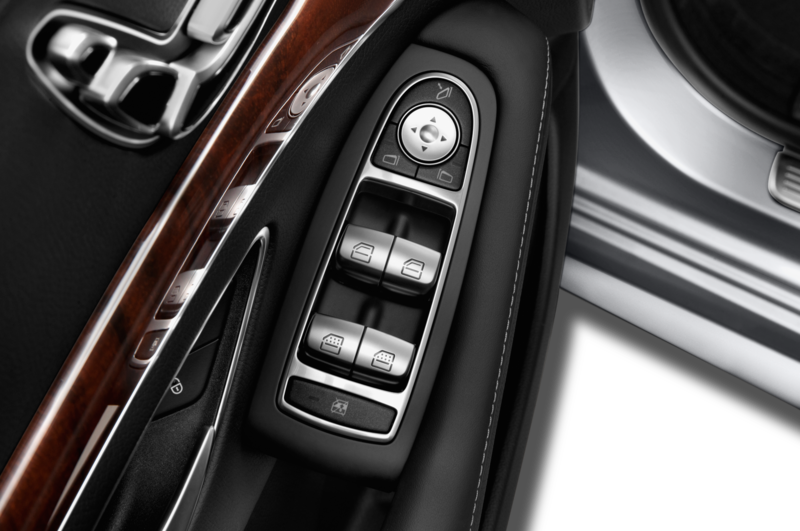 Seatbelt buckles that automatically extend and retract a few inches also make that list; they’re paired with a rear-seatbelt airbag (as seen in the Ford Explorer). 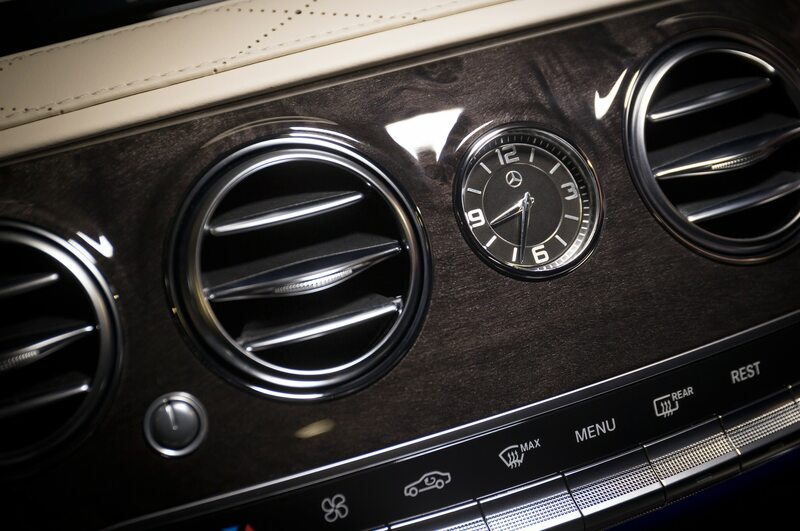 And the available perfume atomization — in four different scents — through the climate-control system just seems silly. 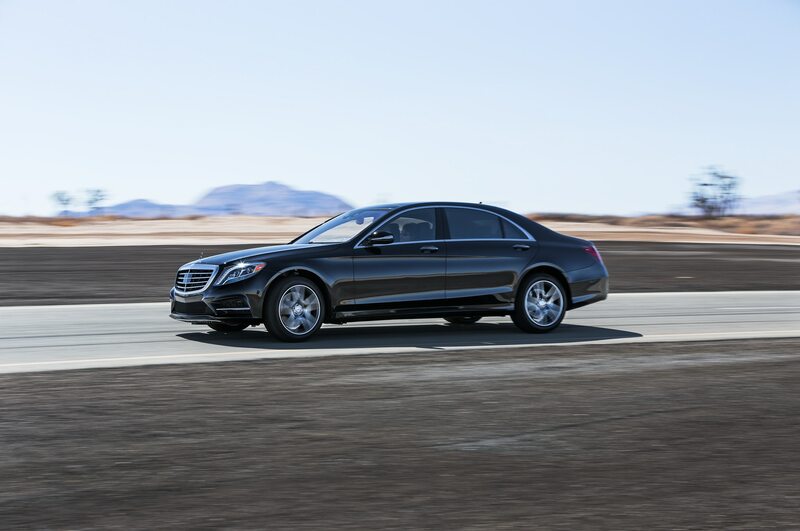 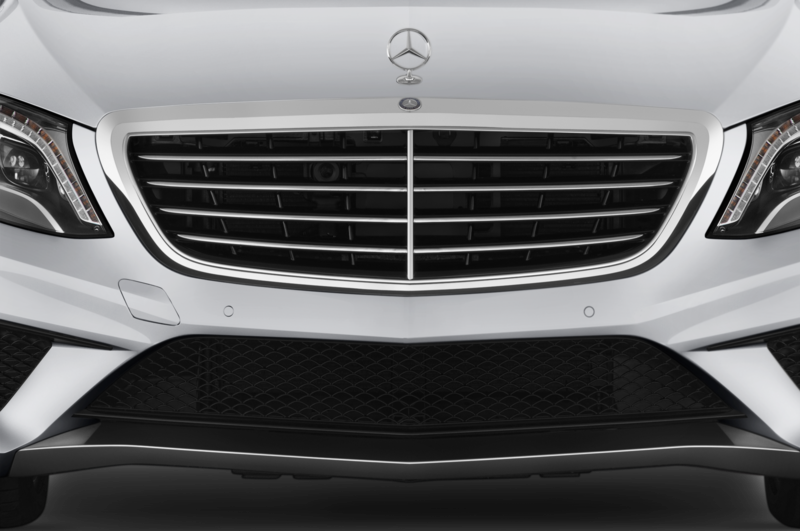 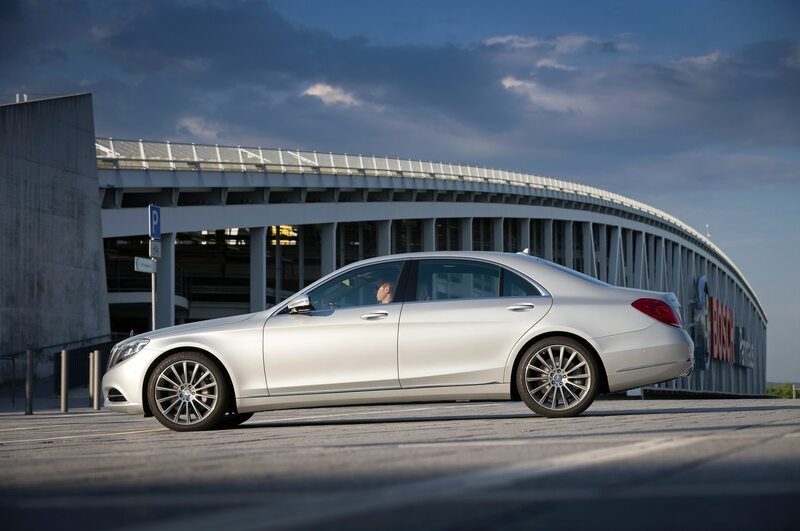 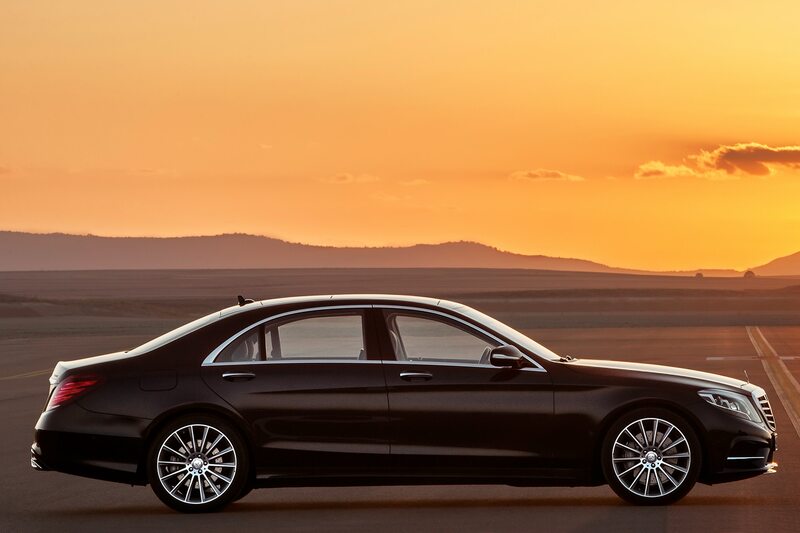 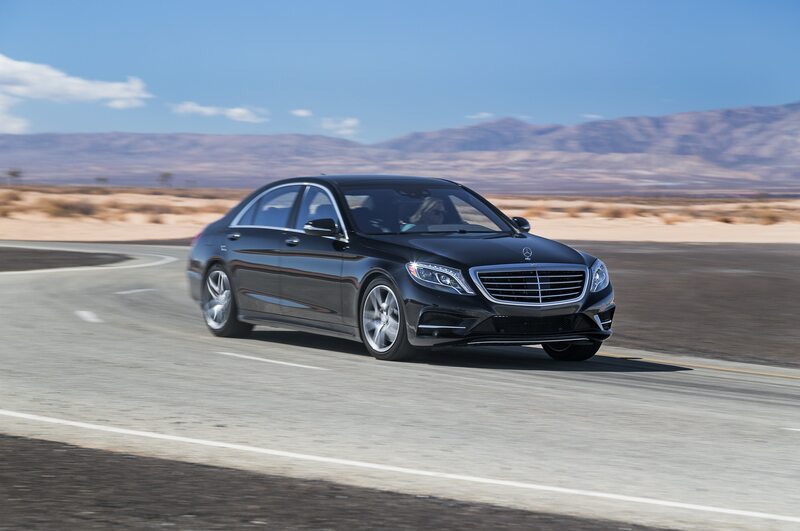 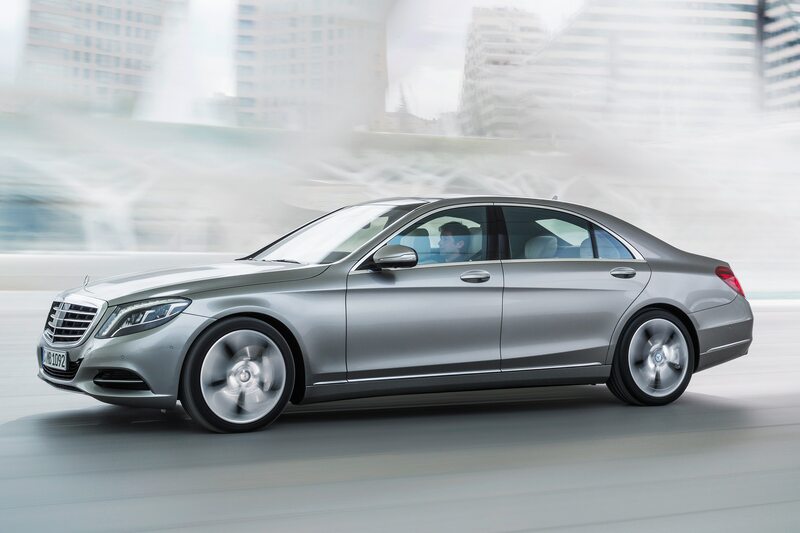 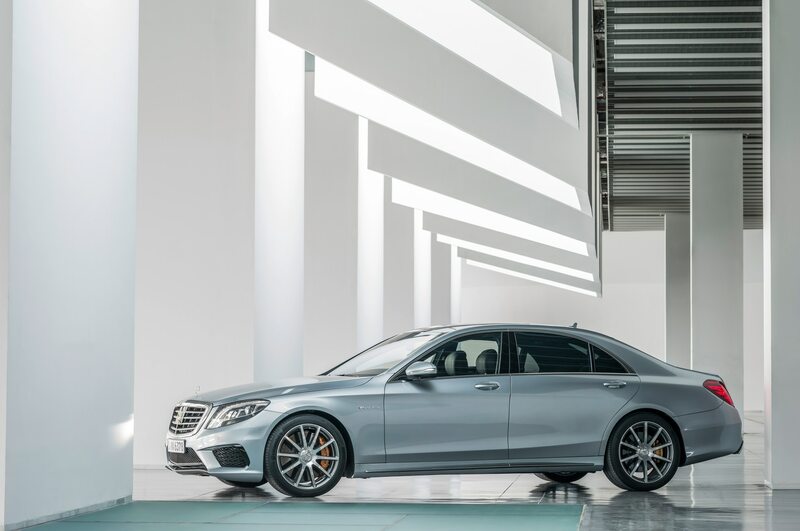 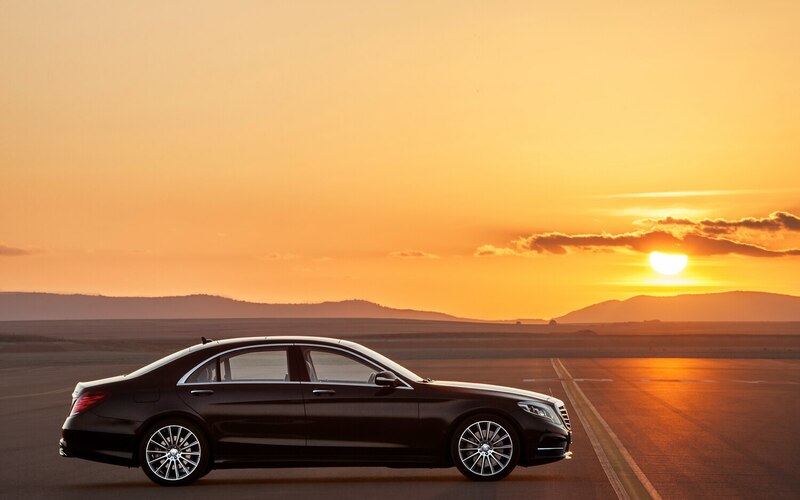 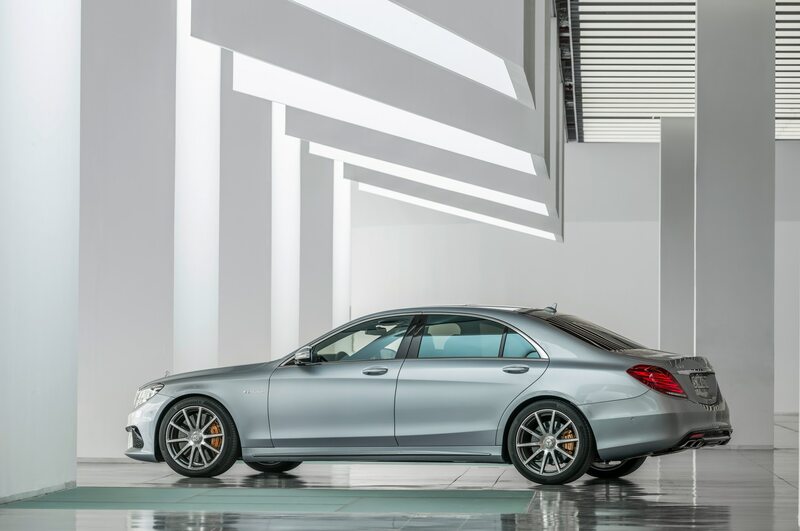 The long-wheelbase S-class is the only version offered in the United States and the increasingly important Chinese market. 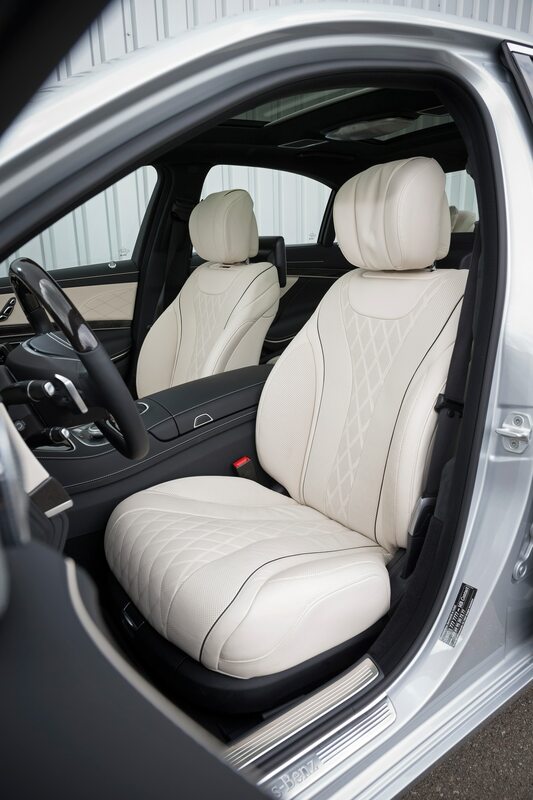 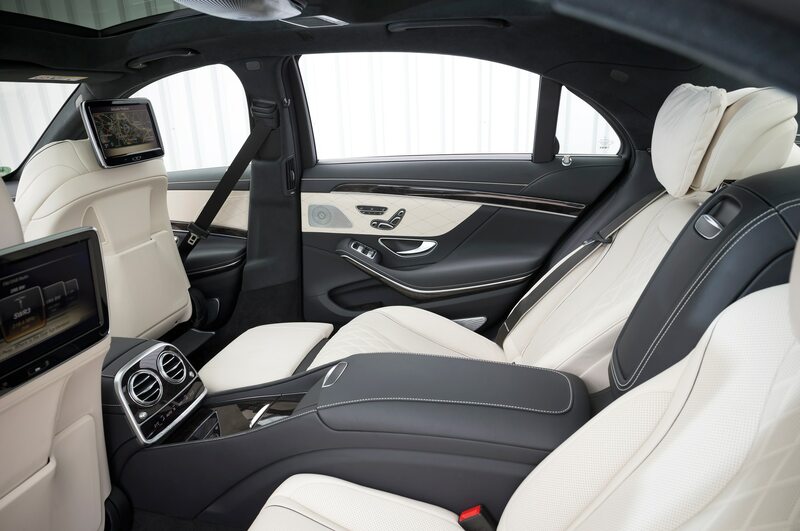 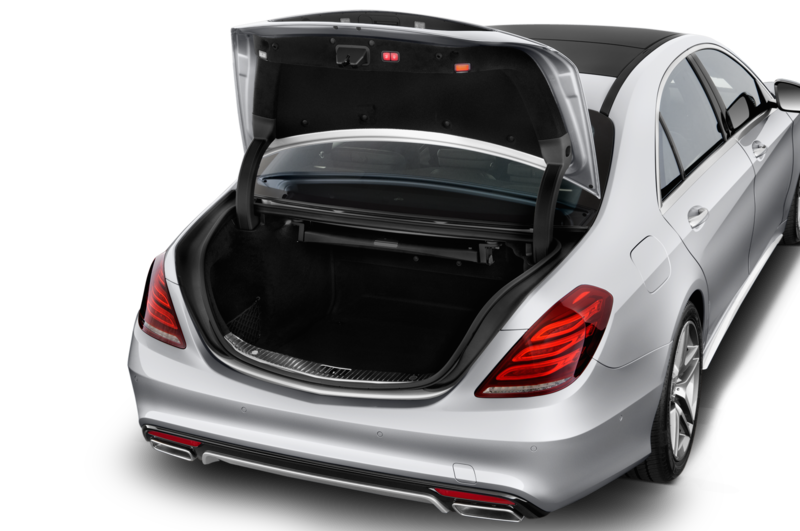 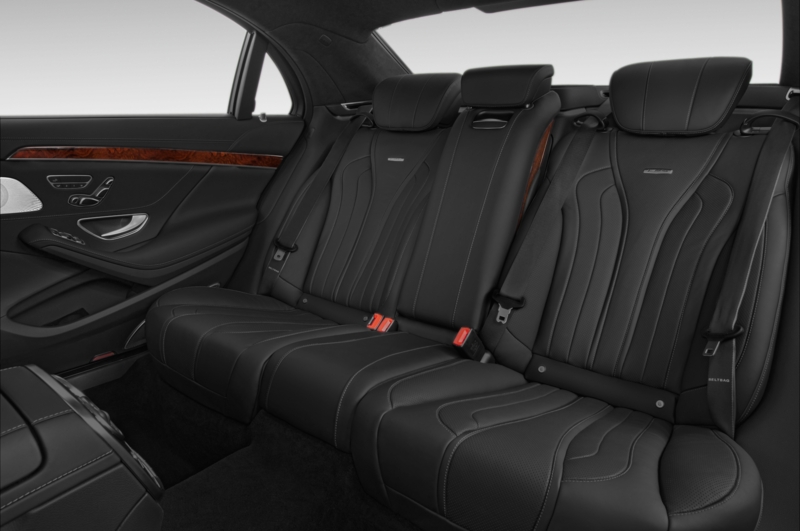 There, S-class owners are usually chauffeur driven, so it’s no wonder the rear seat was given particular attention. 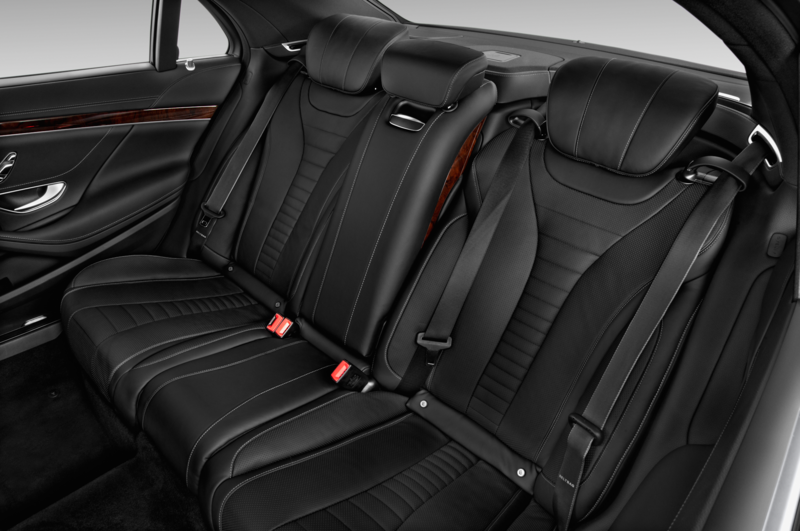 Buyers choose a three-person bench or two individual seats (the executive seating package). 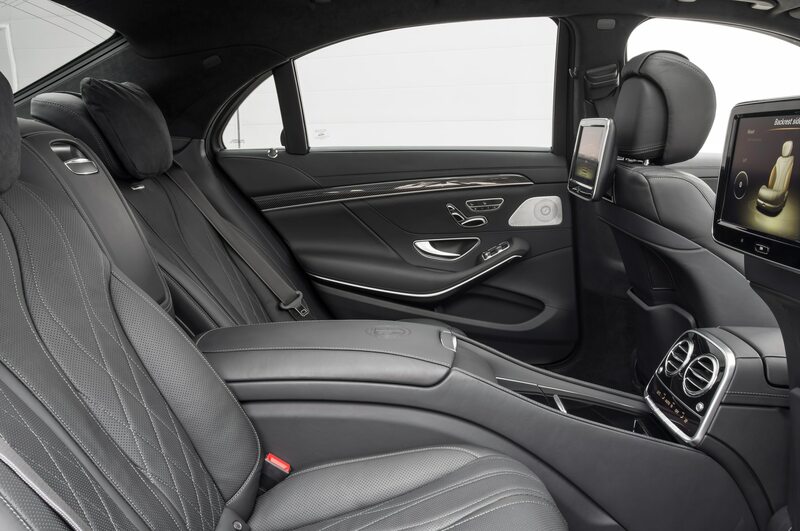 The latter offers a right-hand seat with greater recline range and a seat-cushion-mounted airbag that prevents reclining passengers from submarining in a crash. 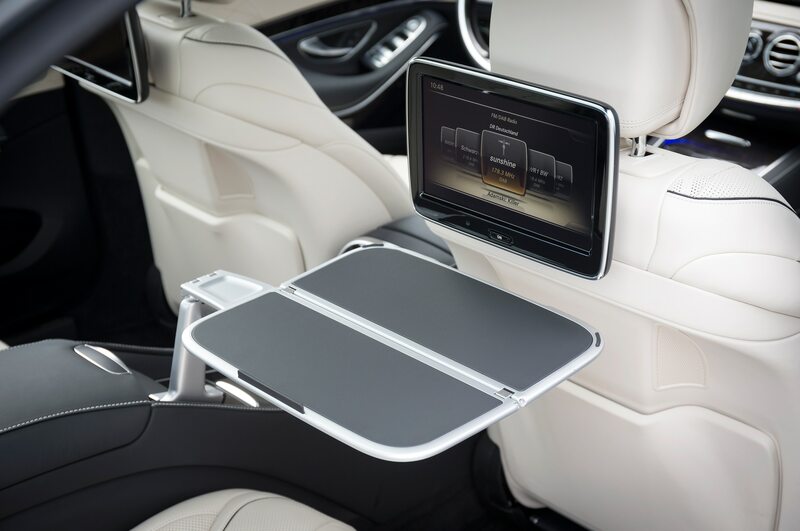 There are also extendable footrests and rear-passenger control of the front passenger seat. 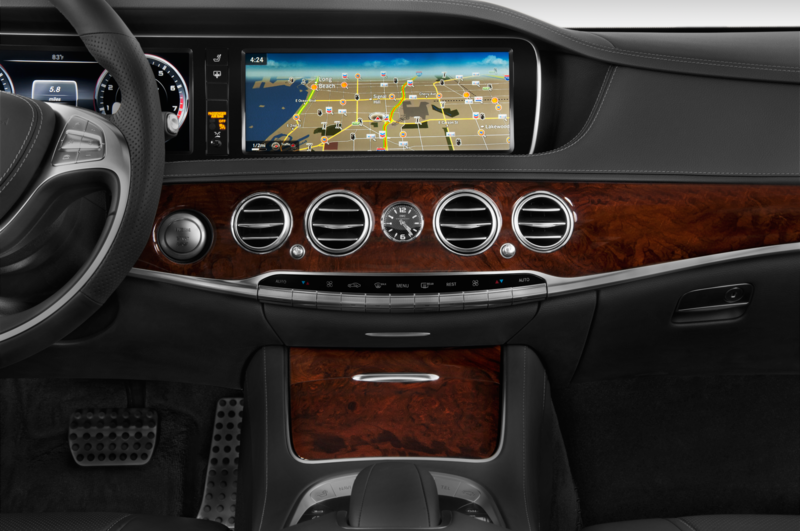 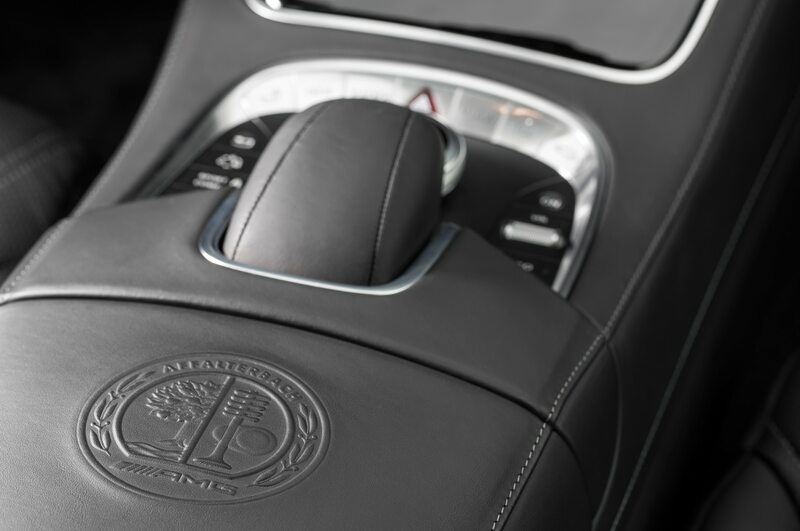 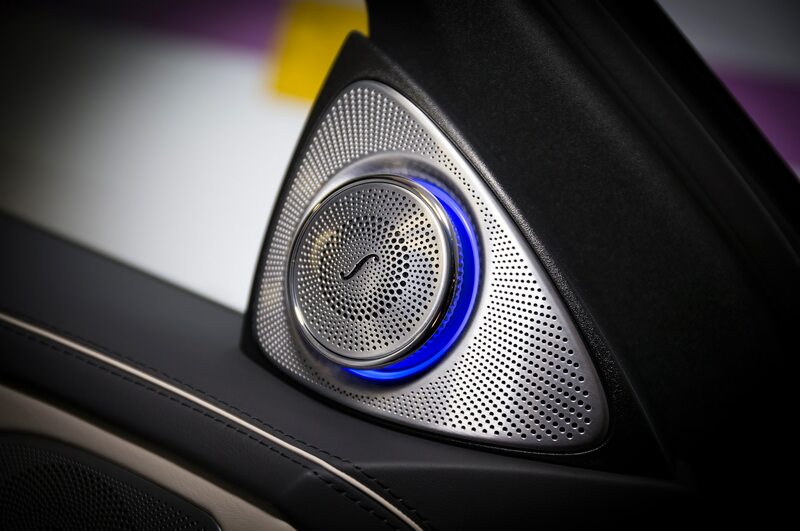 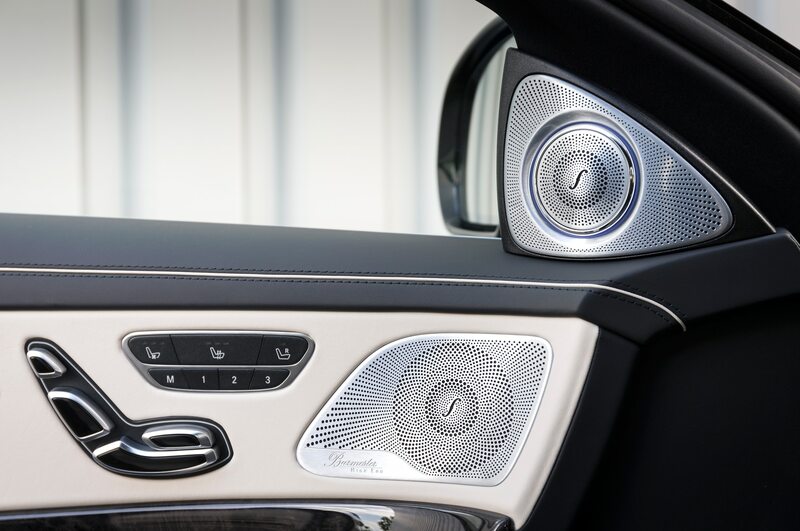 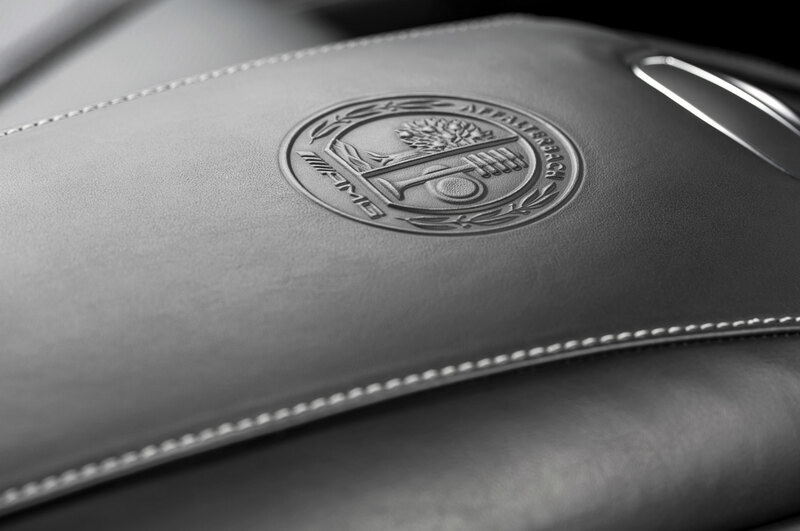 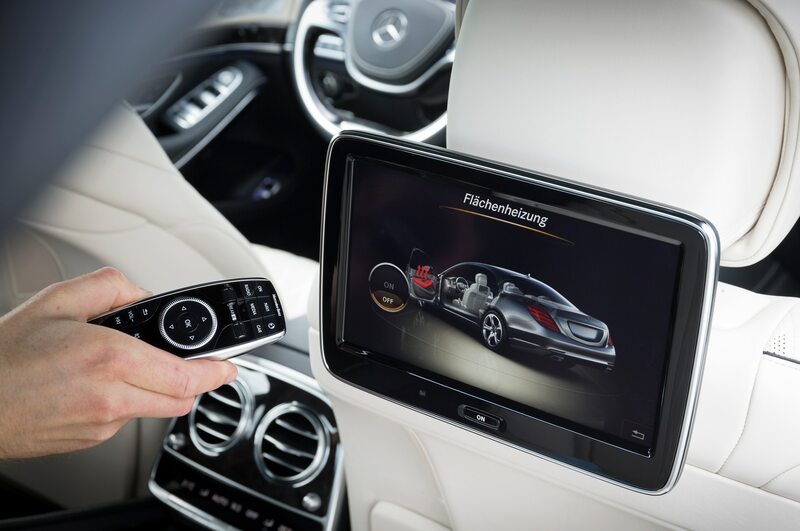 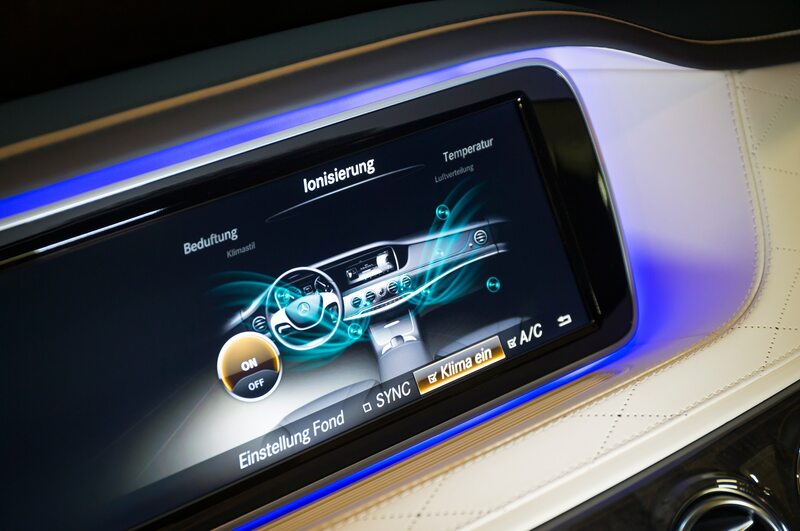 Tray tables that fold out of the center console are available, as are a remote to operate the multifunction screens and wireless headphones for the Burmester stereo. 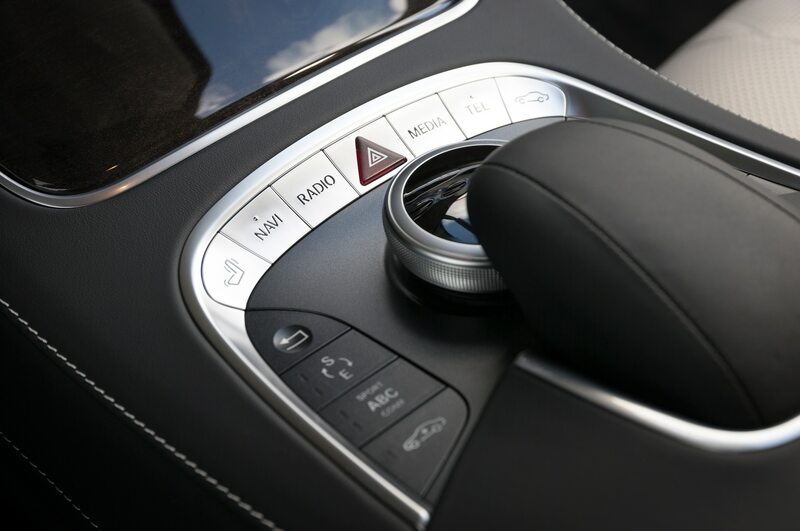 None of the interior features have the wow factor of Steering Assist, part of the available Distronic Plus adaptive cruise control. 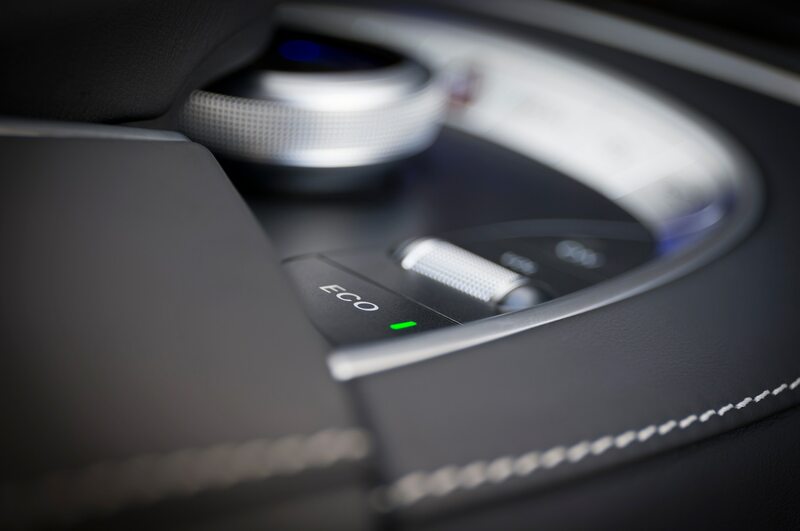 With Distronic engaged and a button on the lower left of the dash switched on, a green steering-wheel icon appears to indicate that autonomous steering is ready. 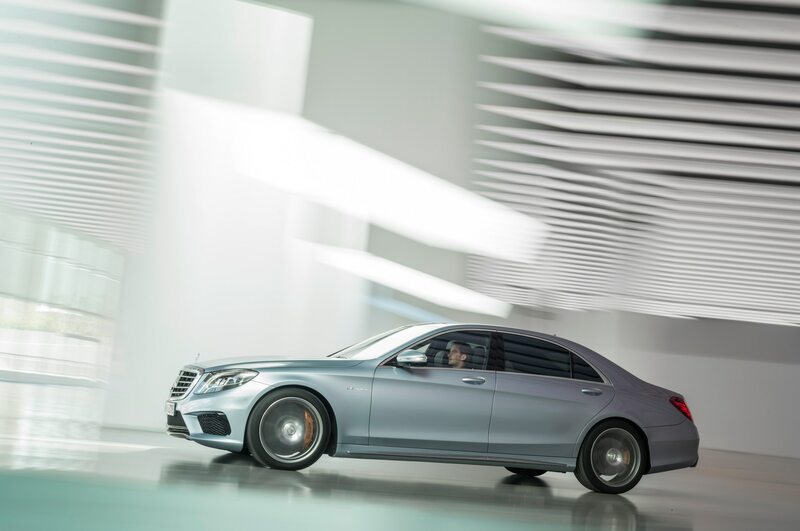 Using the stereo cameras behind the rearview mirror, the S-class can follow the car ahead, autonomously steering through curves. 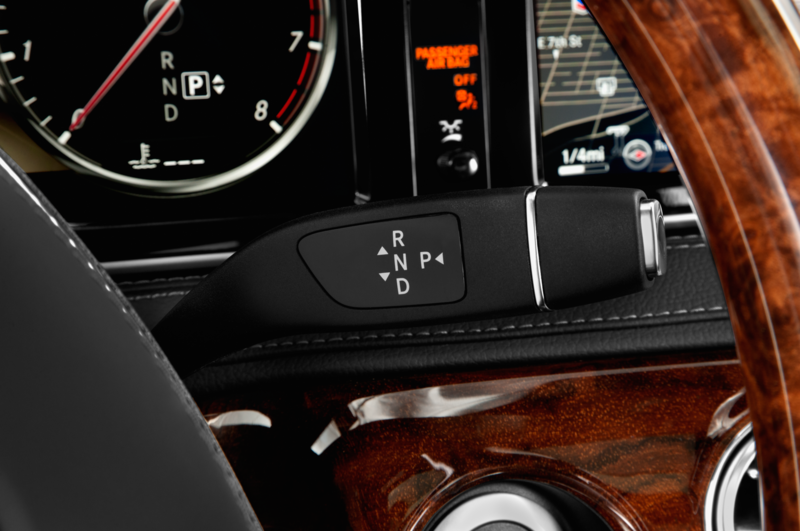 If the car ahead pulls off or changes lanes, the system will pick up the lane markers, although the driver might have to grab the wheel. 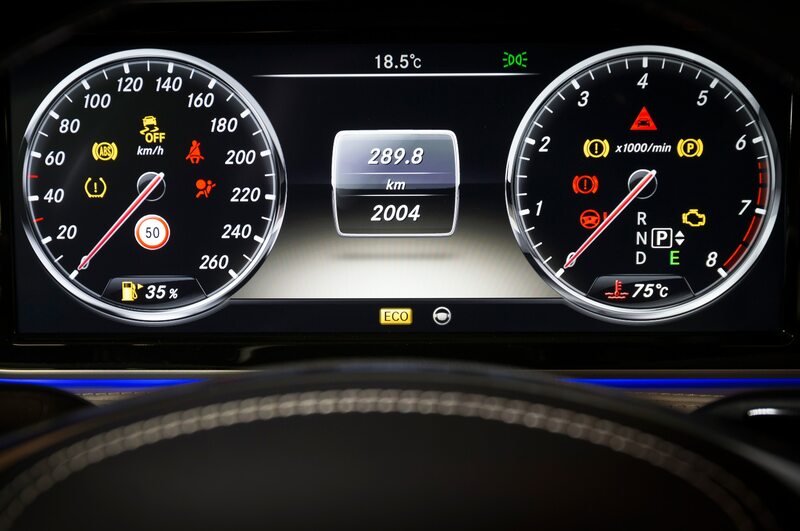 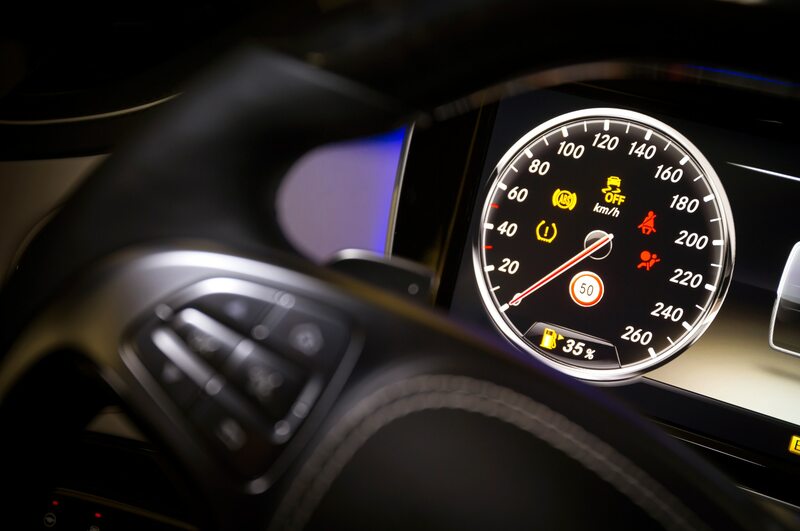 The system can detect a driver’s hands on the wheel and will allow hands-free driving only briefly at speeds above 19 mph before flashing a hands-on-the-wheel warning. 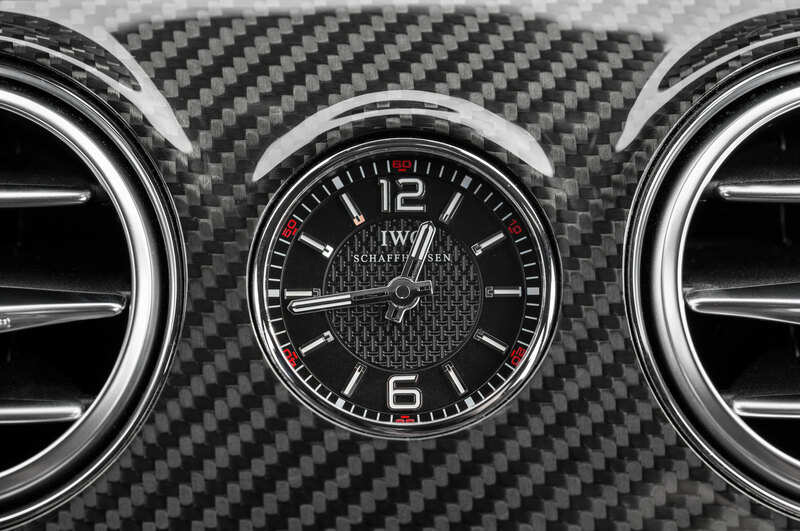 Below 19 mph, it allows more hands-off time. 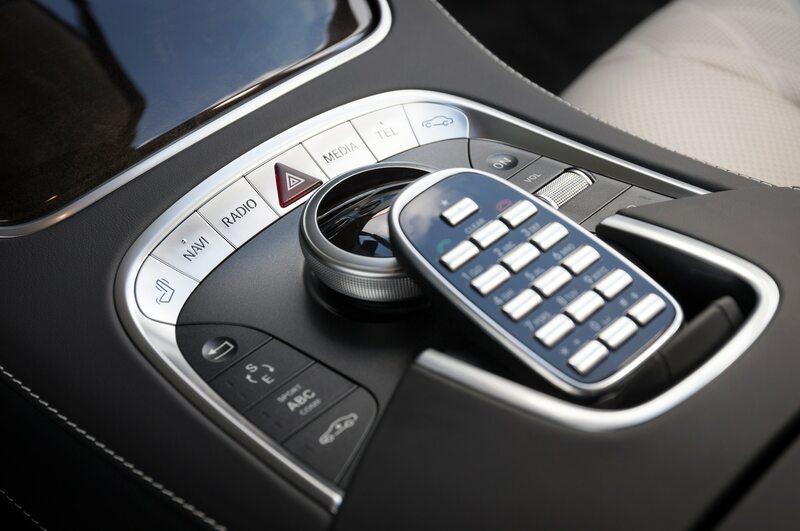 One can debate whether it encourages or mitigates distracted driving; certainly it’s an undeniable boon to those who can’t leave their smartphones alone. 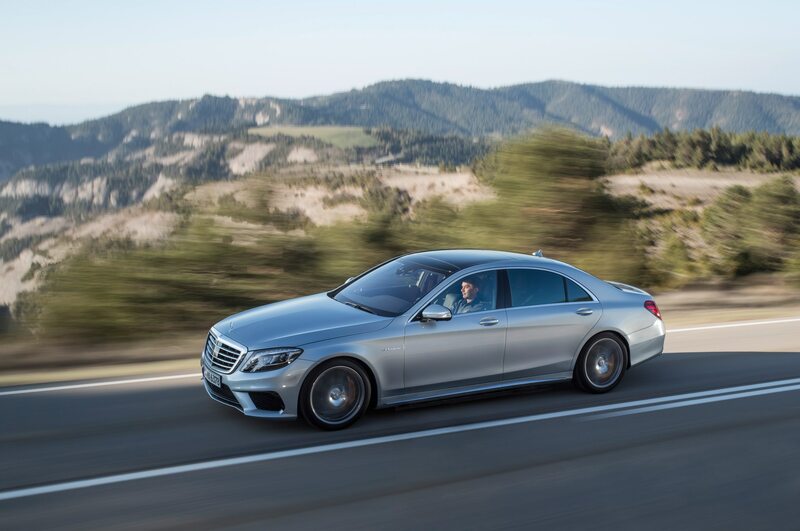 Mercedes engineers point to the system’s usefulness in traffic jams, and when we later were stuck in a slow crawl on the way back to Stuttgart, we could see their point. 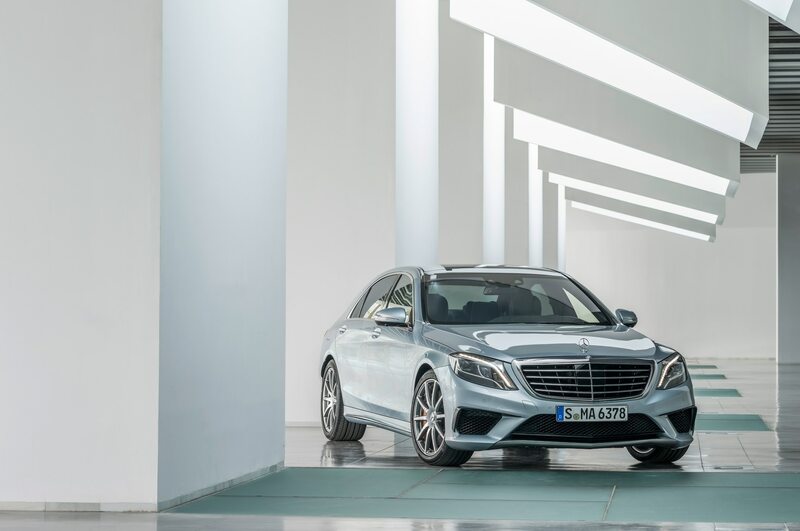 Asked whether a new S-class must introduce new features, chief engineer Storp confirms: “That’s always necessary.” One gets the sense that Mercedes-Benz threw everything it had into this new S-class. 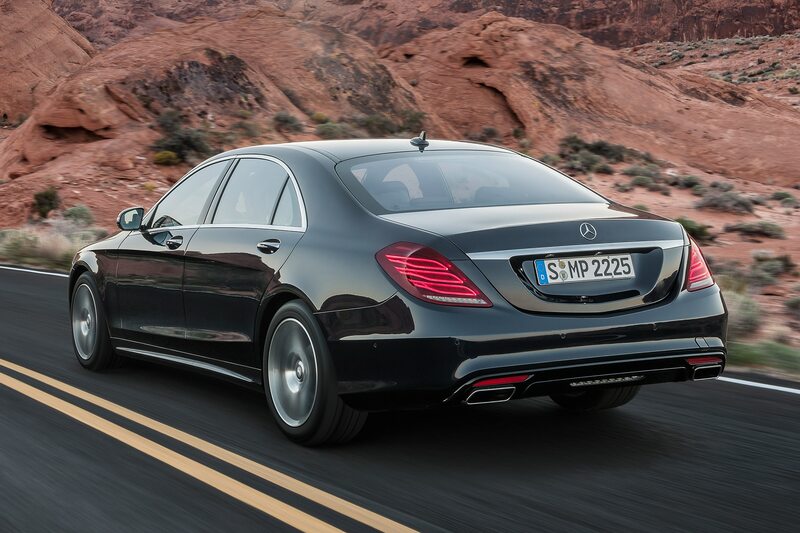 In that sense, it really does live up to the Mercedes mystique. 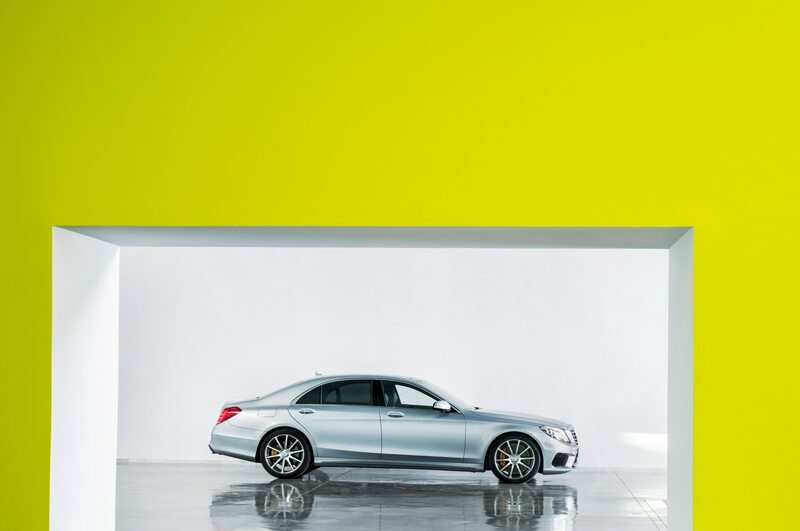 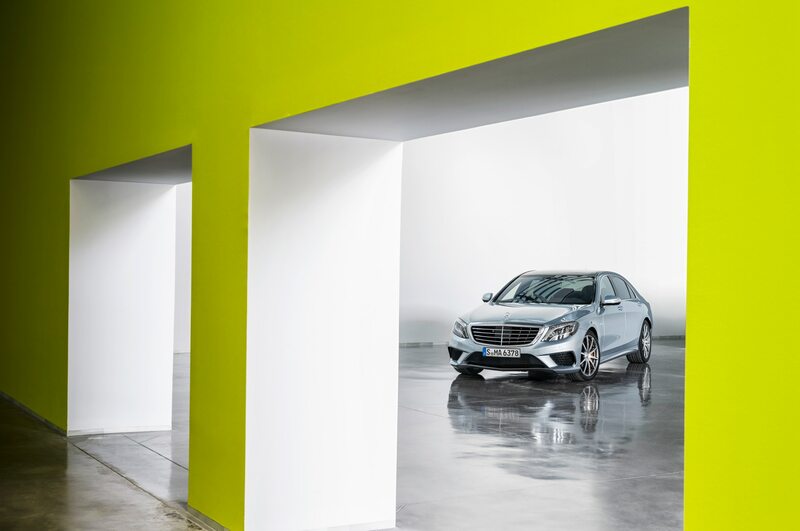 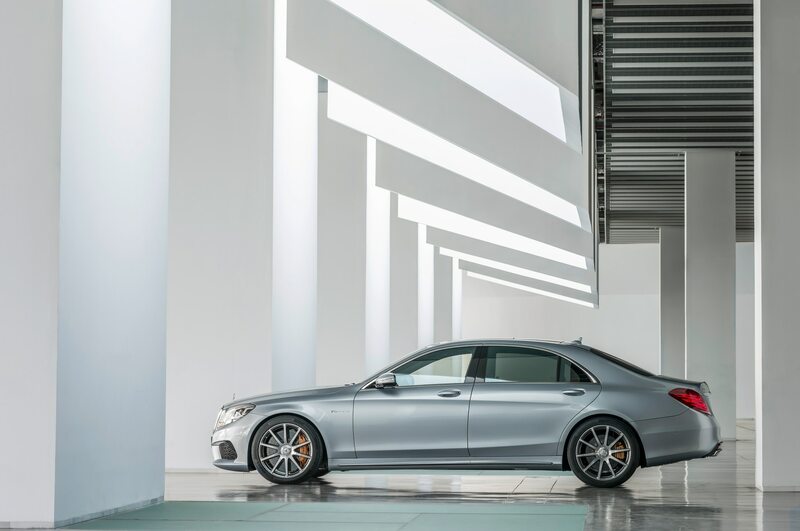 It has that harmony of movement — the action of the steering, suspension, brakes, and throttle — that has long characterized the S-class. 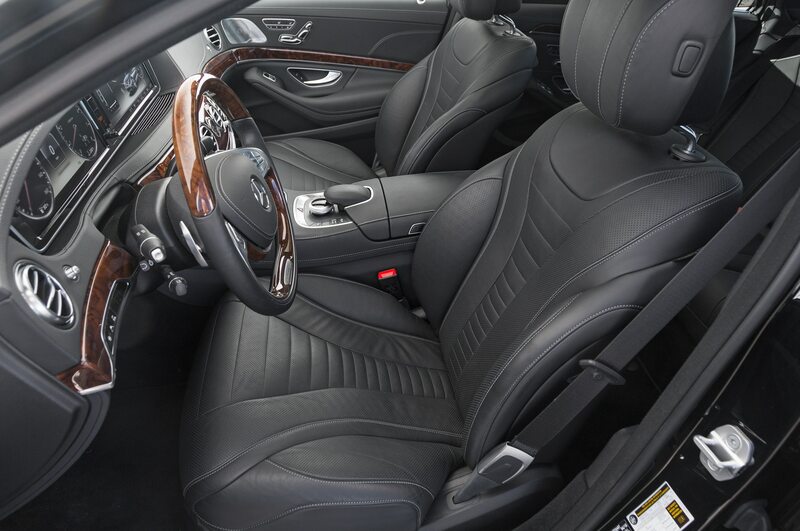 It’s a sybaritic pleasure to drive, or just to sit in. 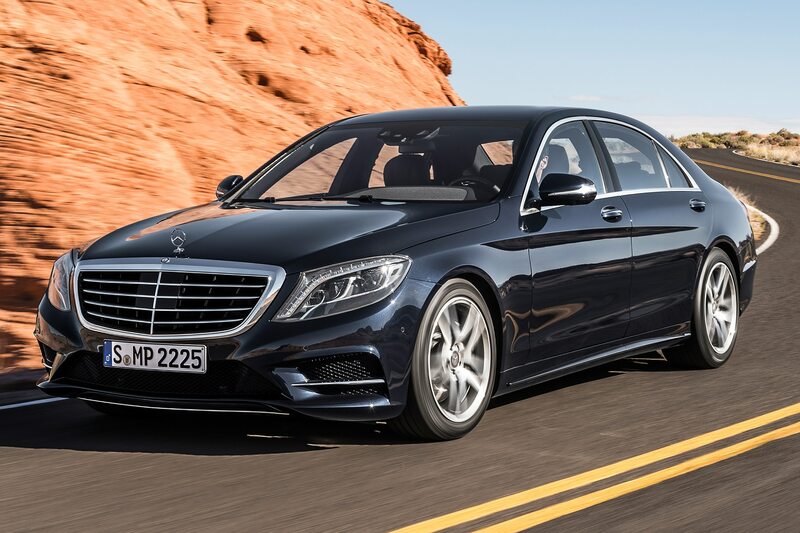 Given the extent of the effort with the V222, it’s surprising how dramatically the new S-class lineup will be diminished, at least in the States. 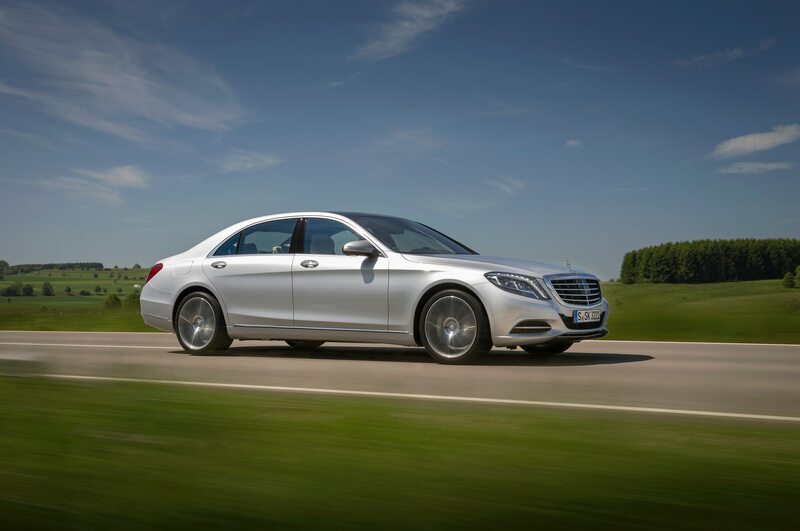 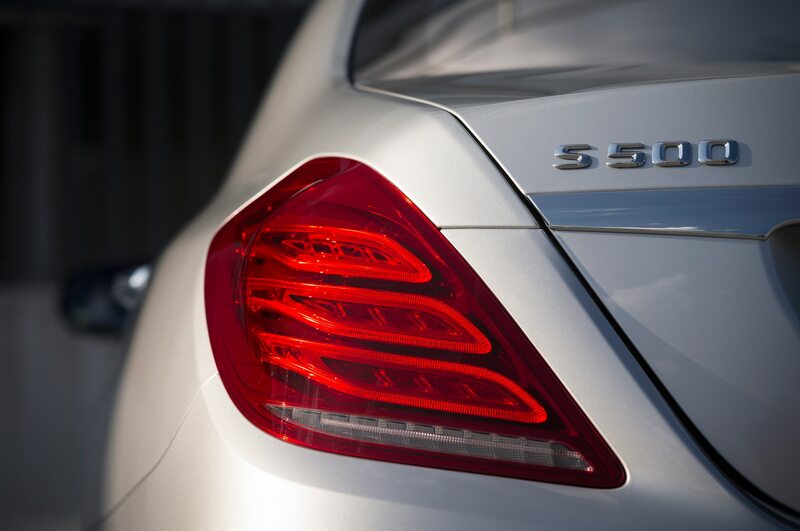 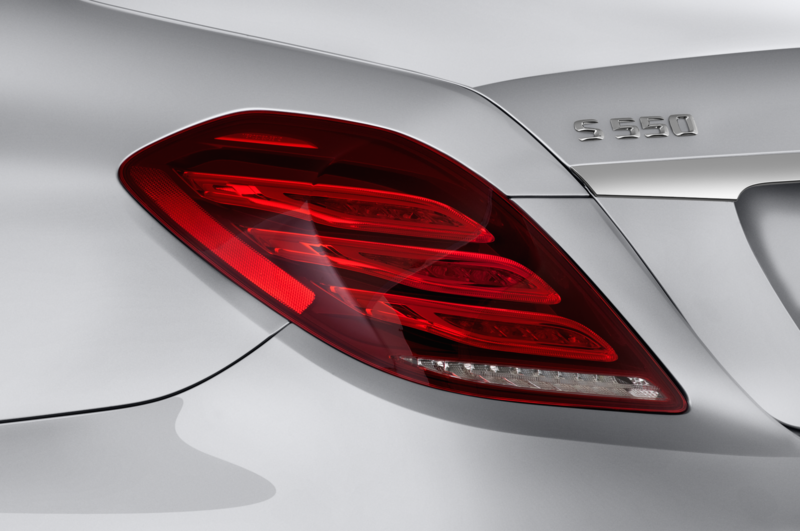 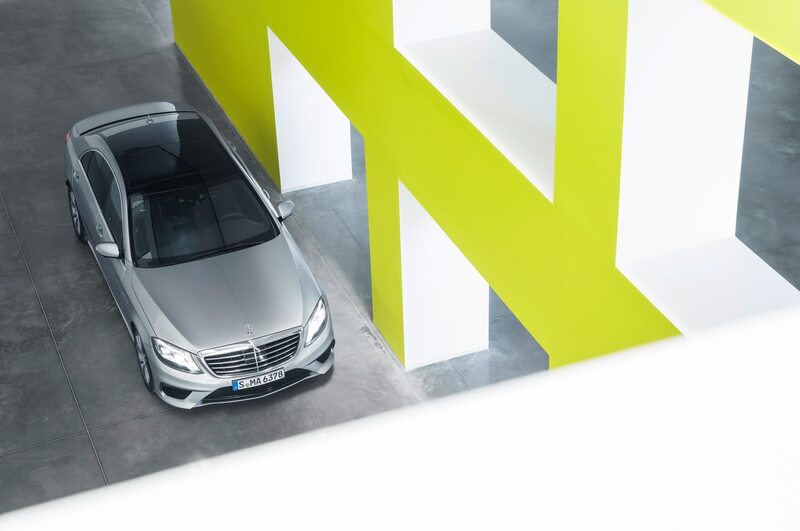 The new model launches in September with the S550, followed shortly by the S550 4Matic and the S63 AMG. 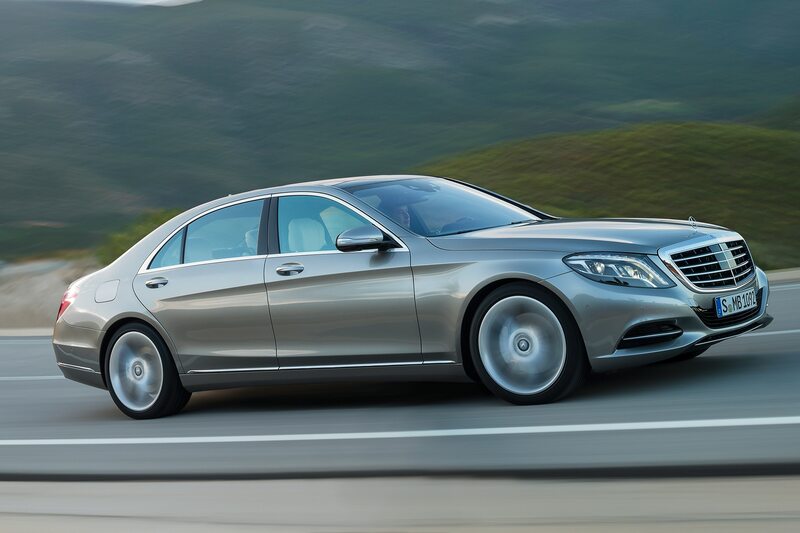 The diesel and the hybrid are not expected to return, although we might eventually get a plug-in hybrid. 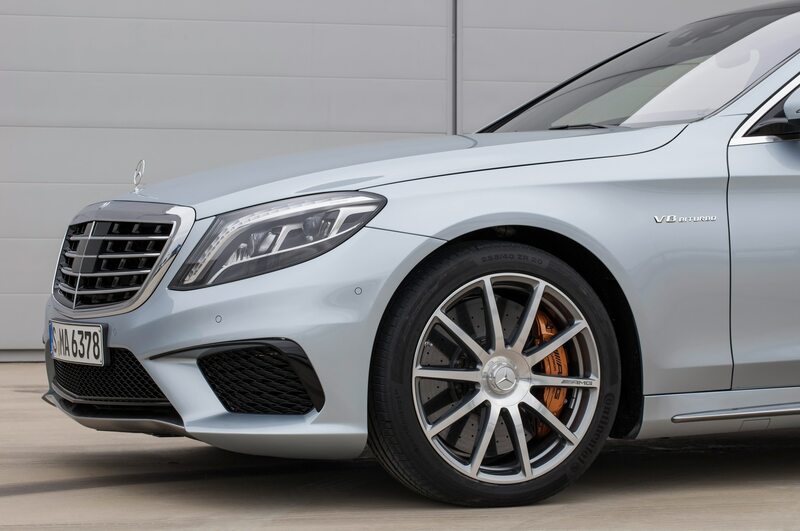 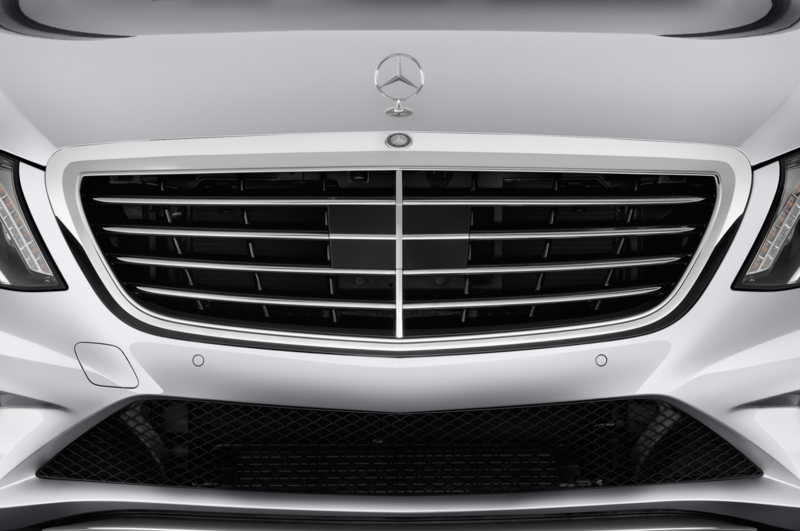 The V-12s are gone, at least for the time being, but we wouldn’t bet against an S65 resurfacing. 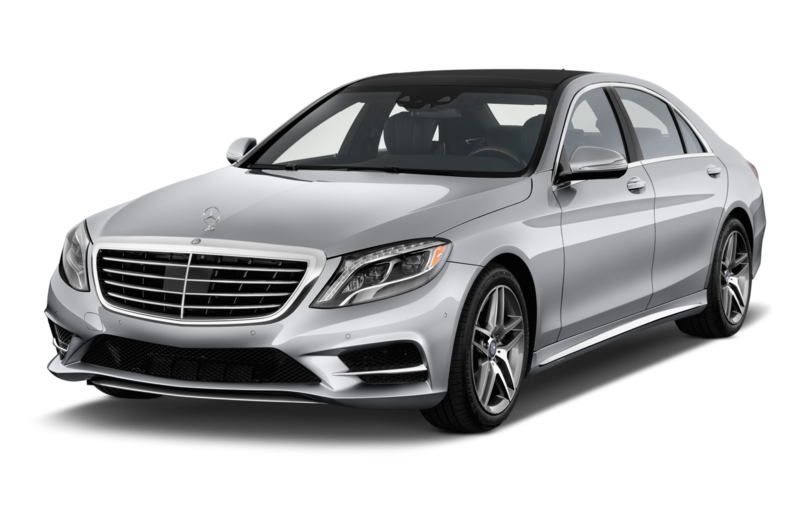 Even without the ultra-prestigious twelves, however, the V222 should burnish the position of the S-class as the preeminent luxury sedan. 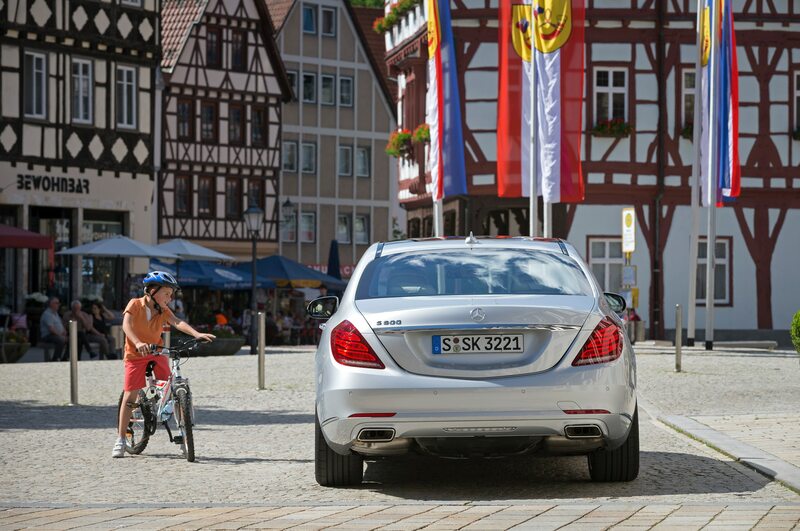 The Swabians don’t know what they’re missing.